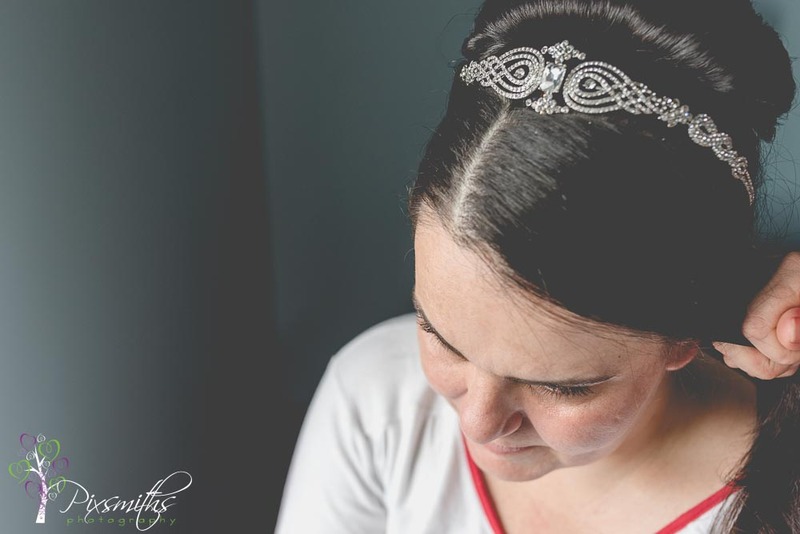 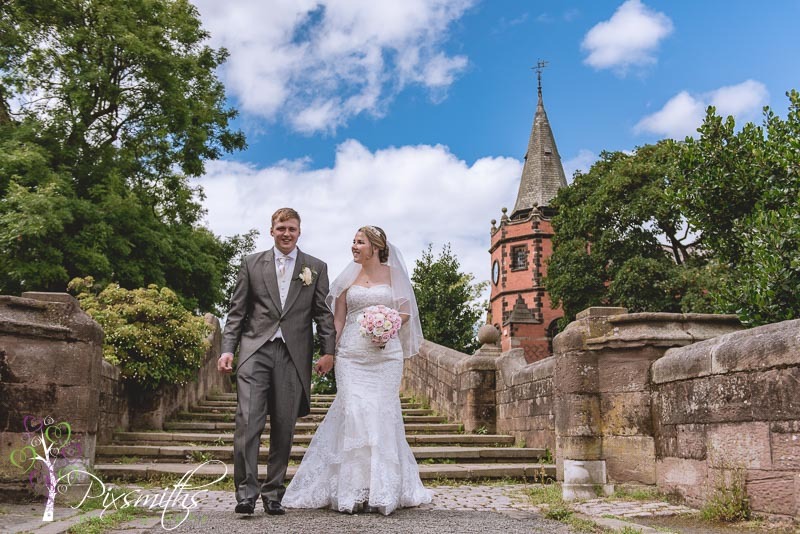 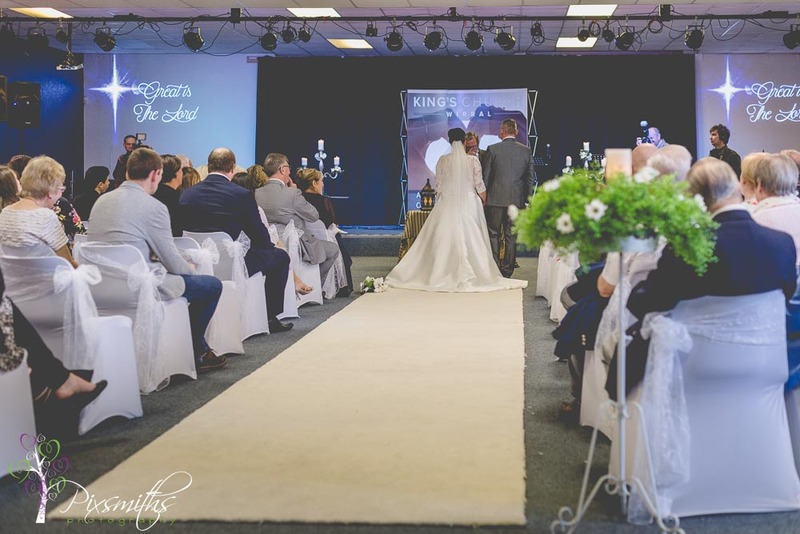 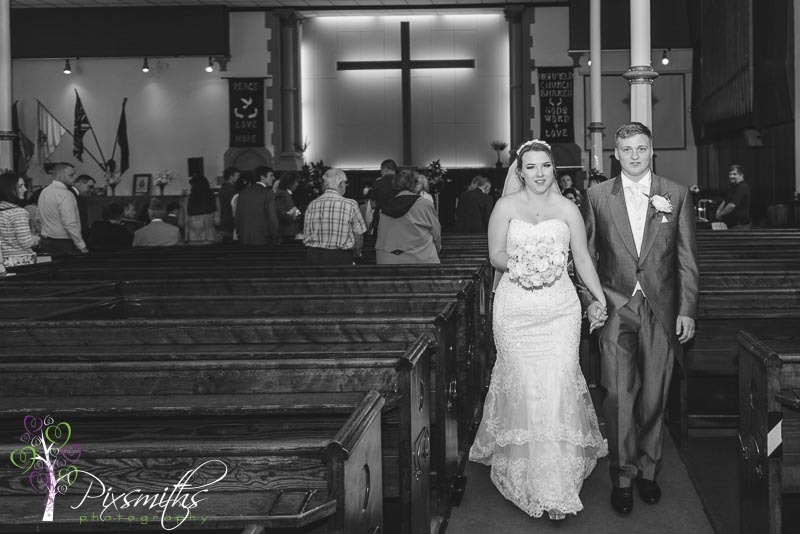 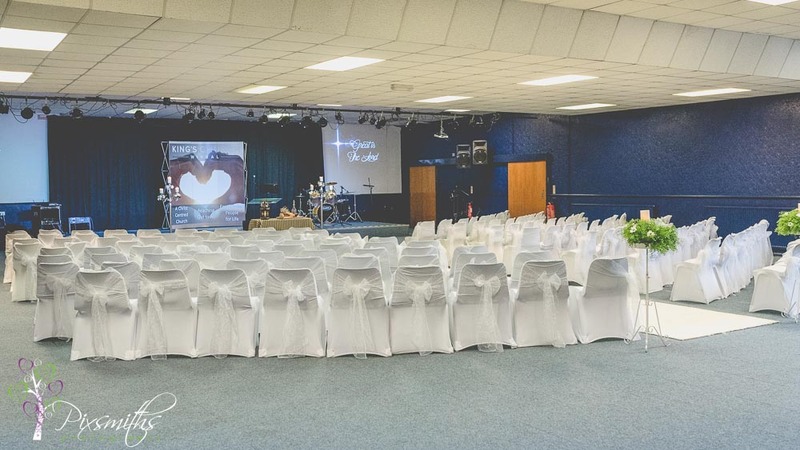 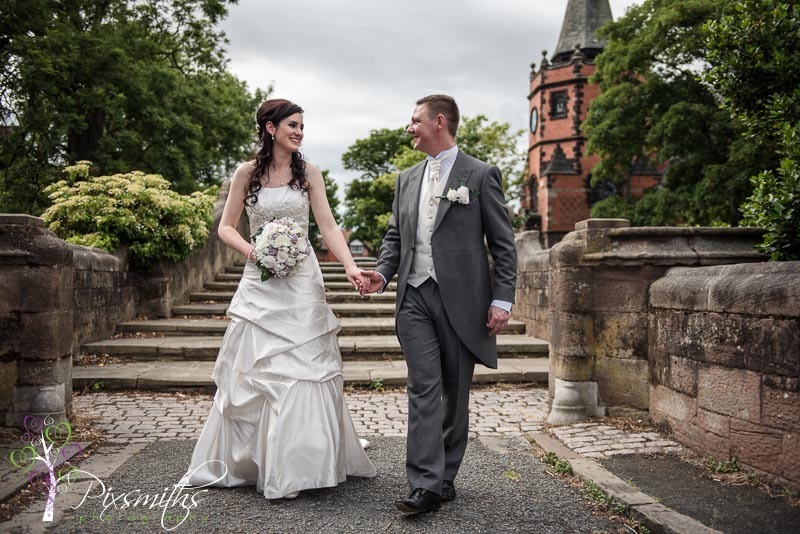 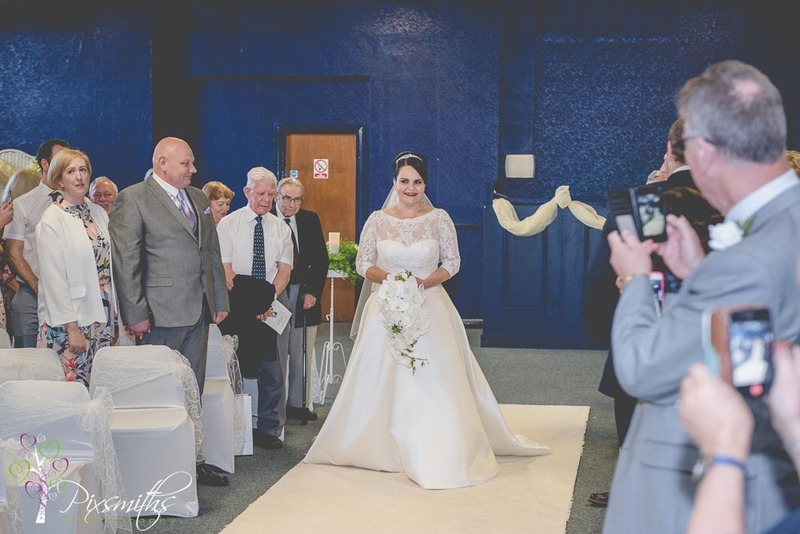 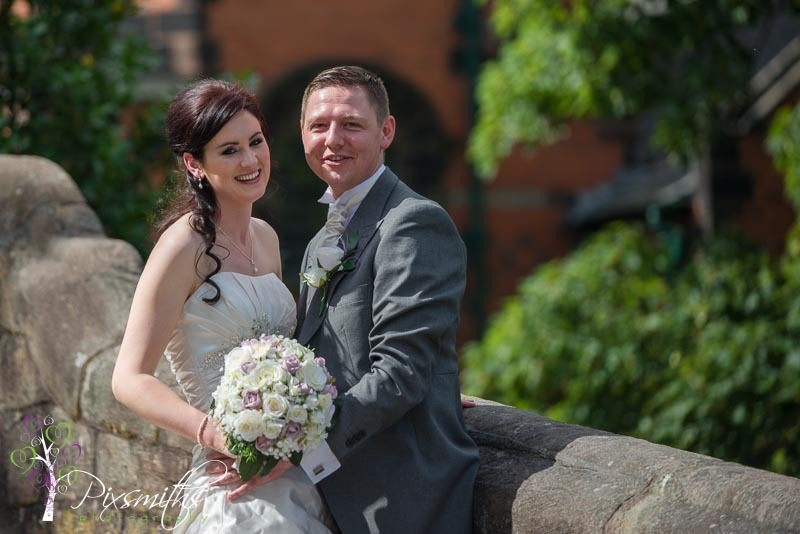 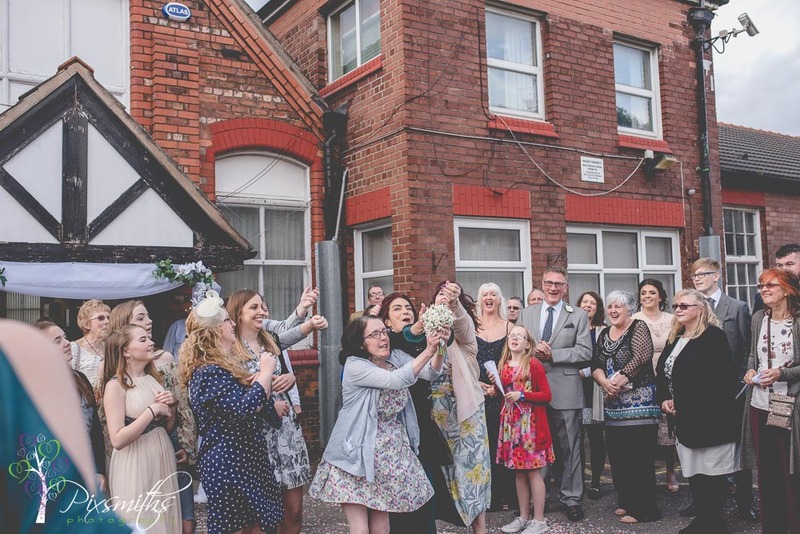 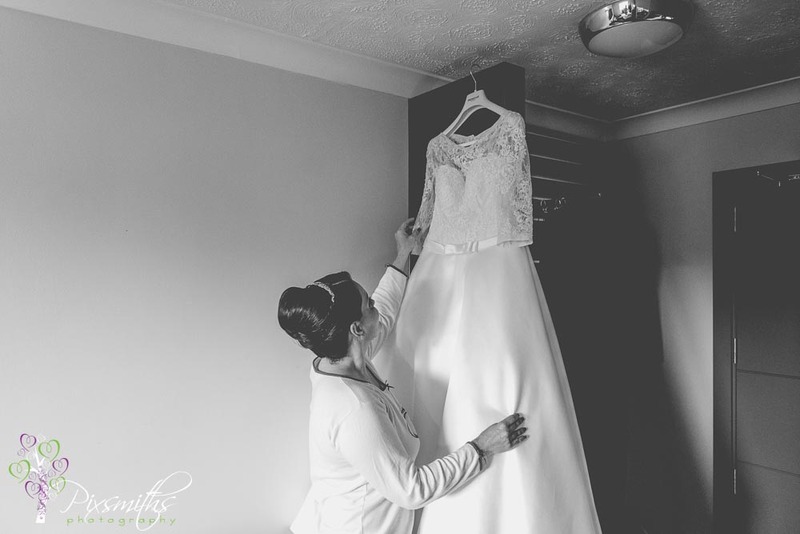 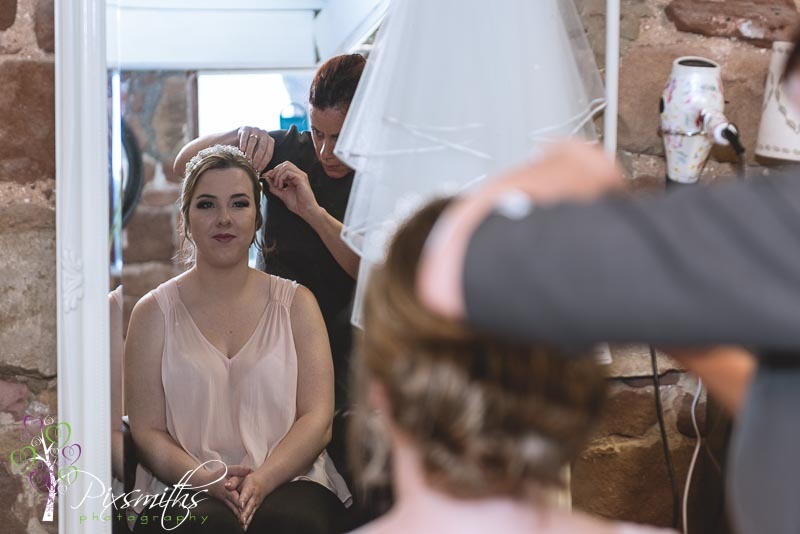 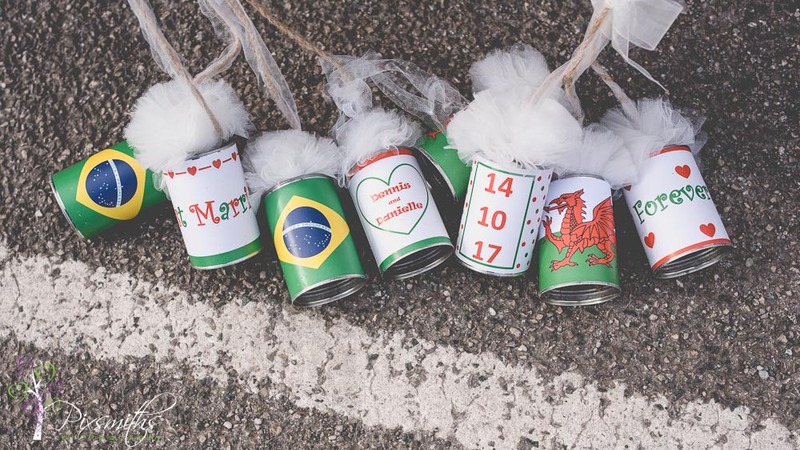 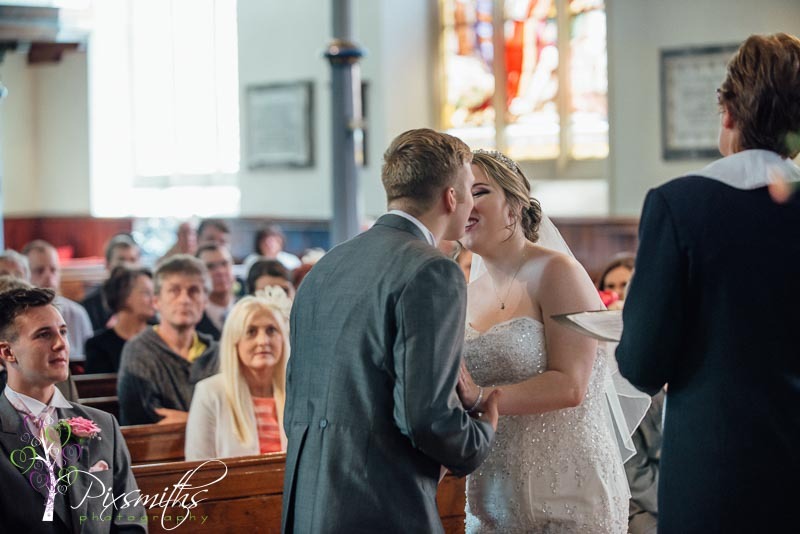 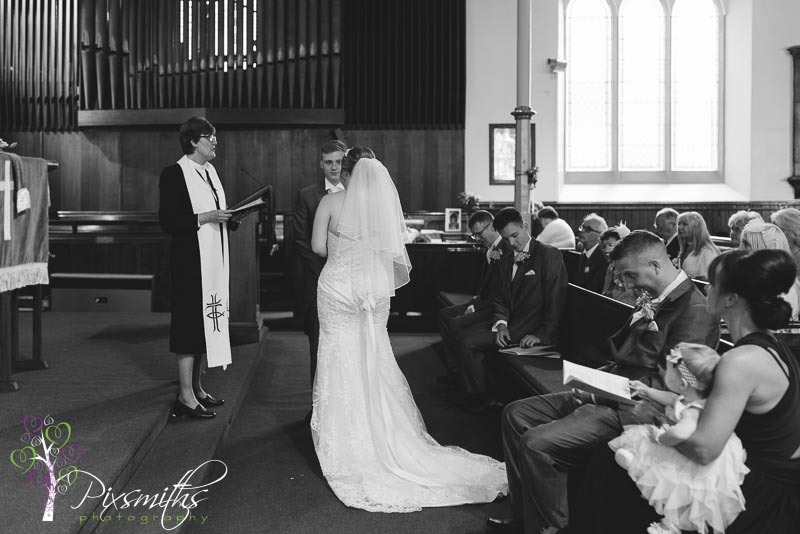 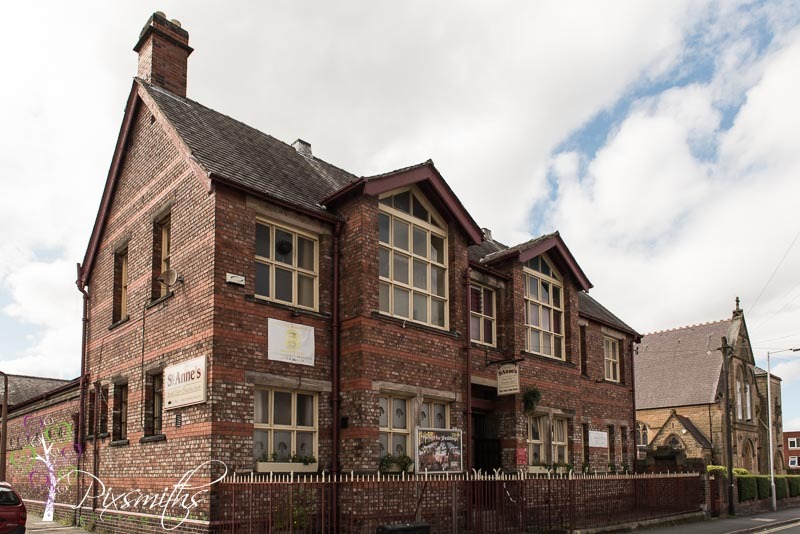 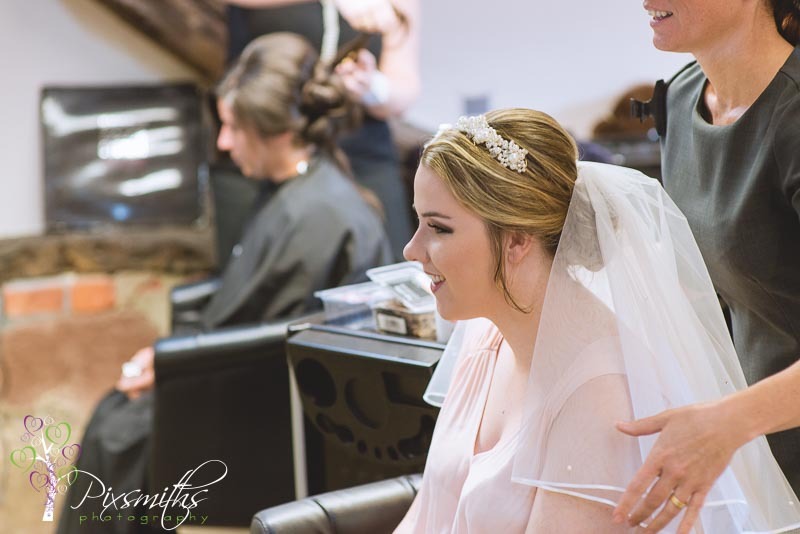 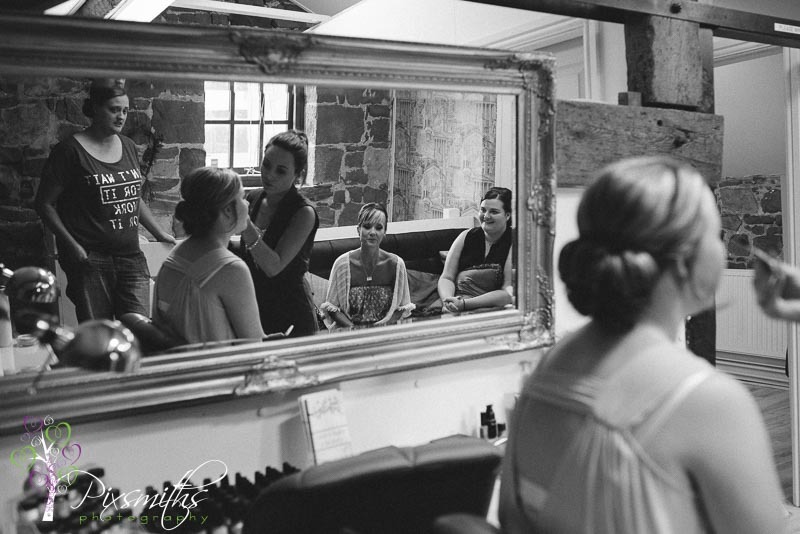 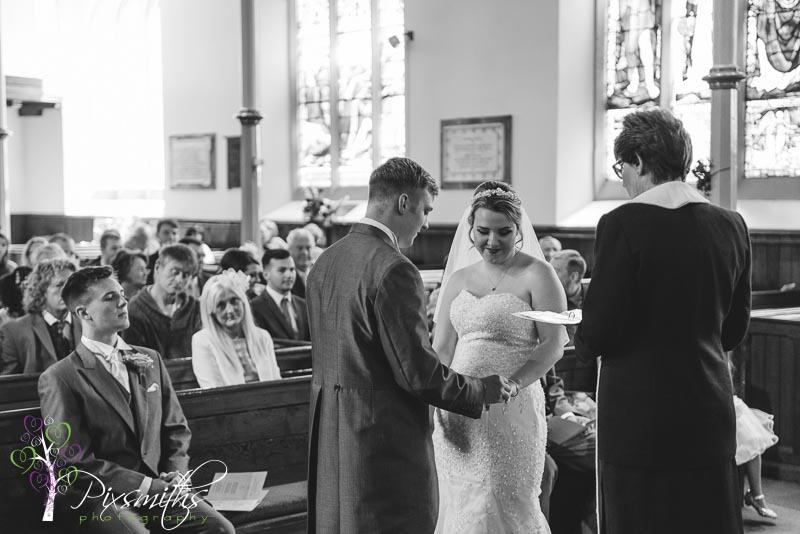 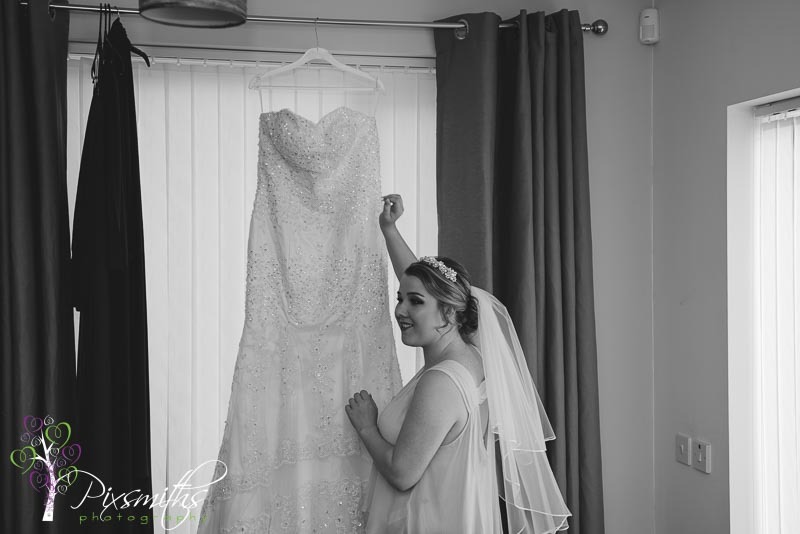 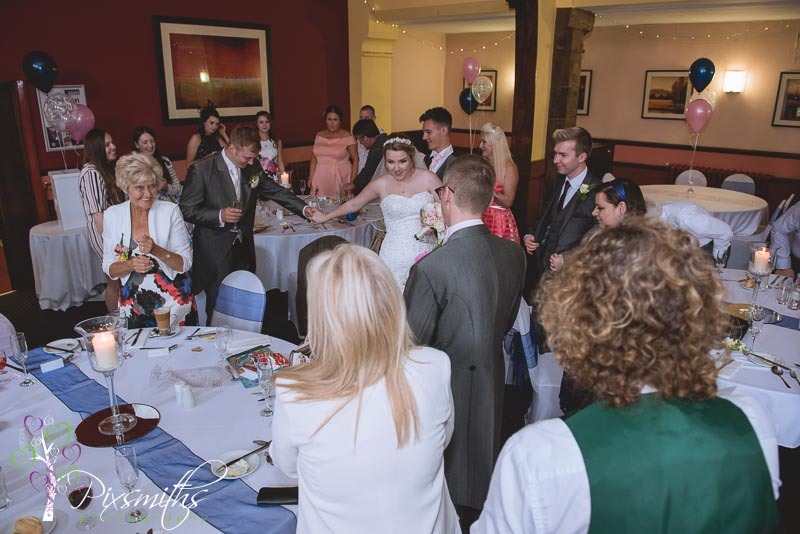 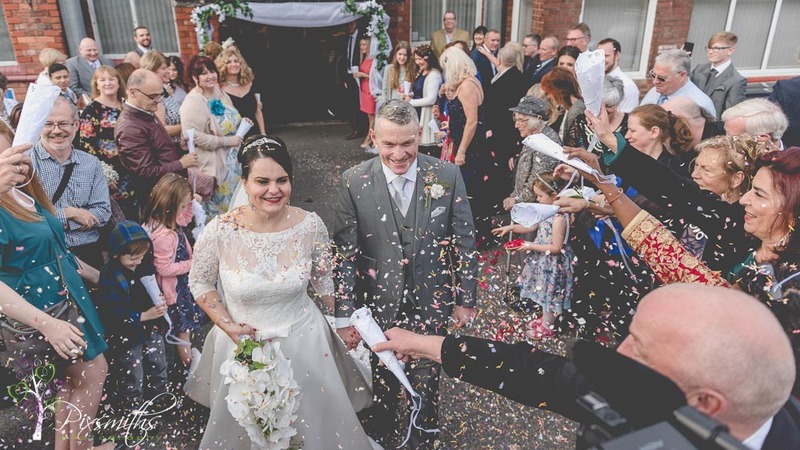 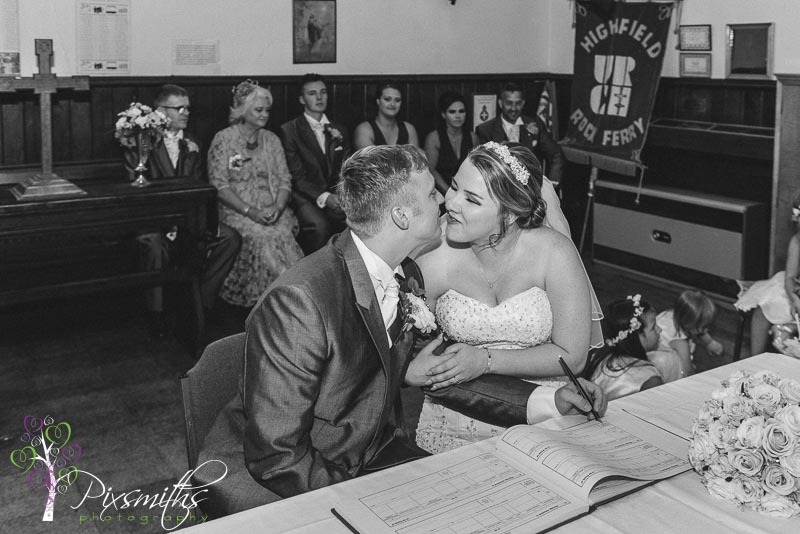 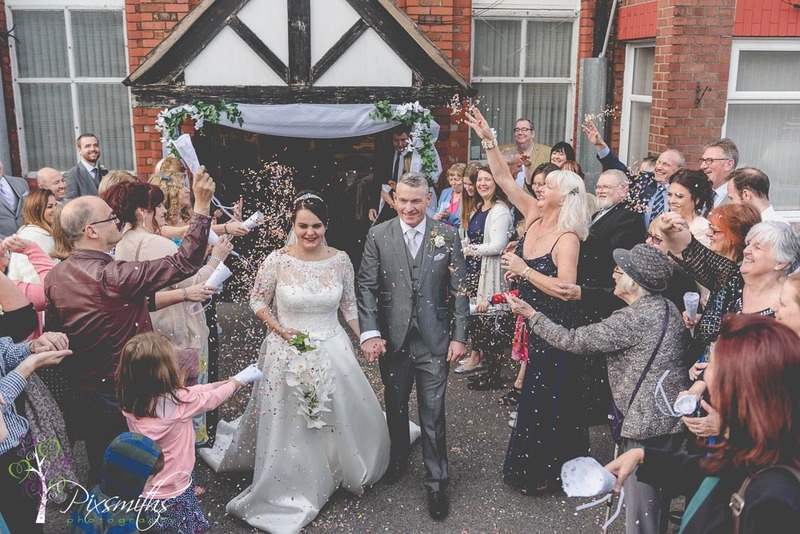 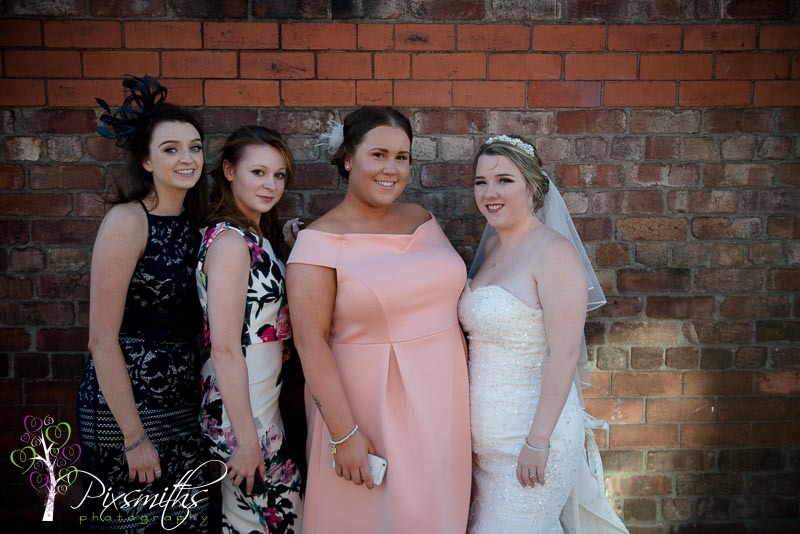 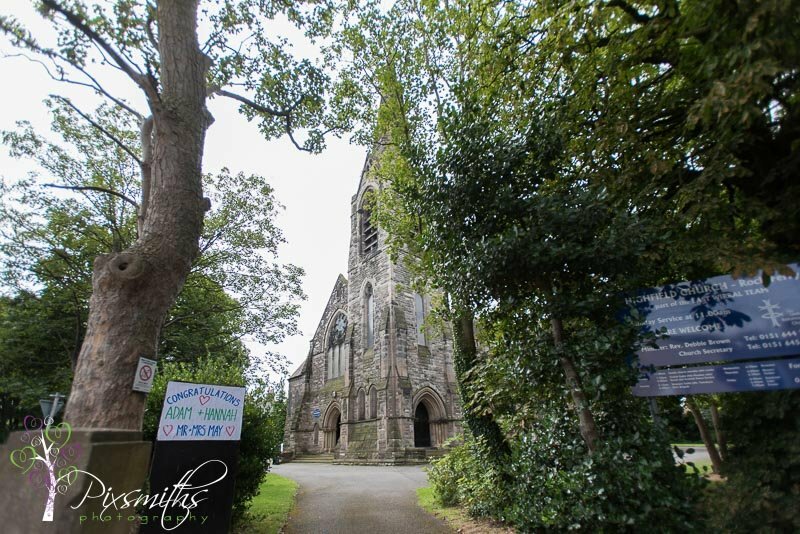 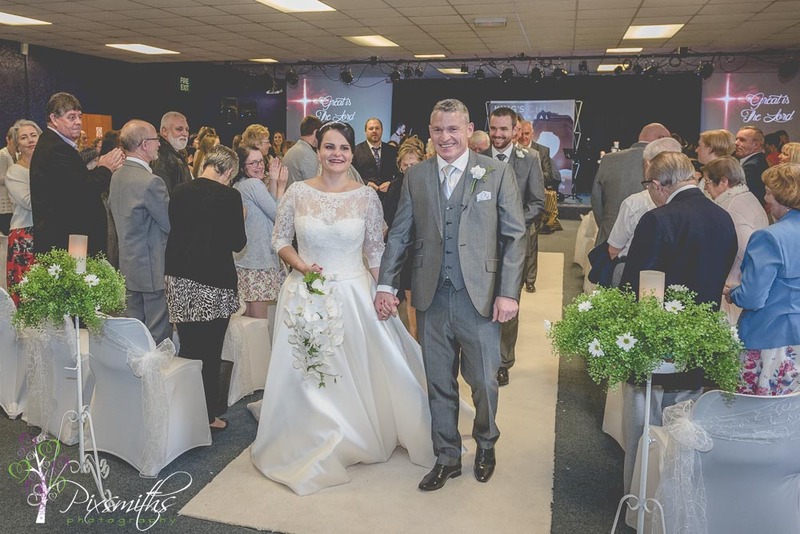 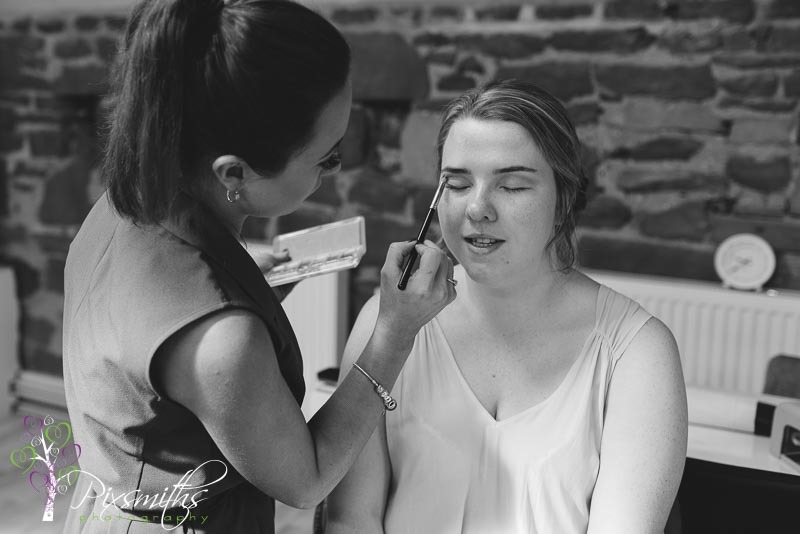 Hannah and Adam kept their Wirral Wedding local and handy for their Church Ceremony at Highfield Church Rock Ferry. 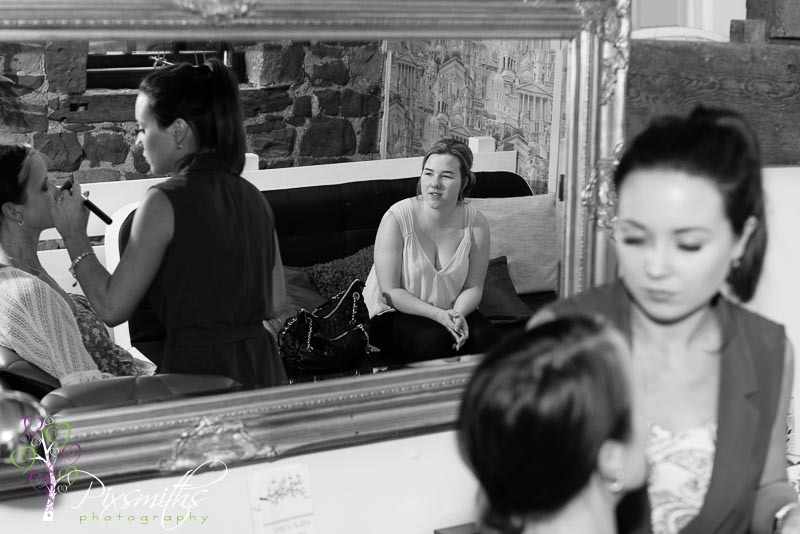 We started the day at Deborah Alfa hair and beauty salon in Brimstage for the pampering of the girls. 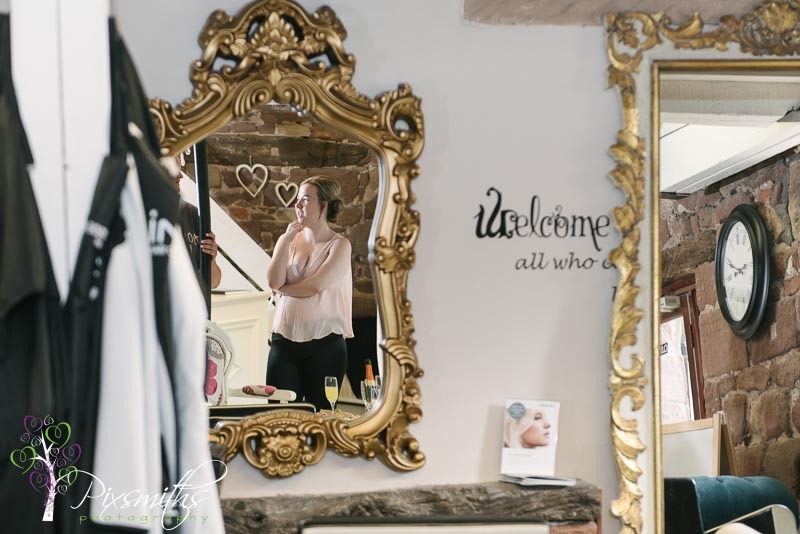 A lovely spacious salon and very attentive staff. 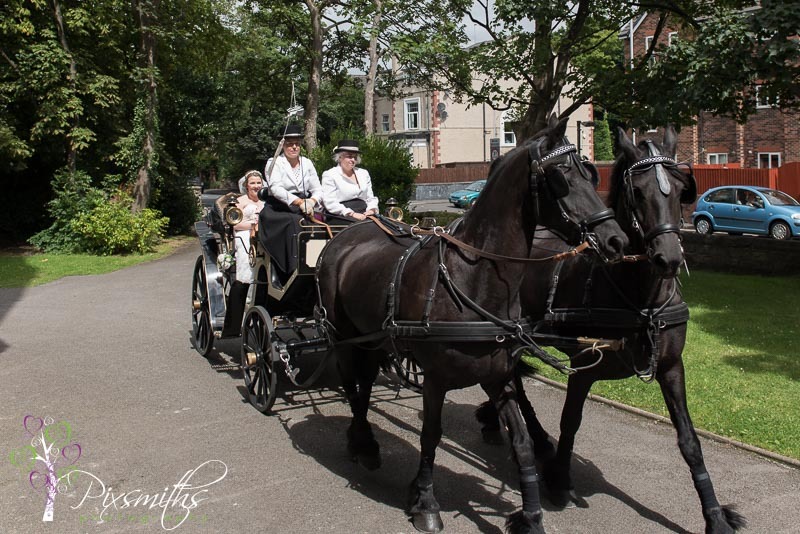 A short ride from their home so what better way for Hannah to arrive than by horse and carriage courtesy of Ashcroft Carriages. 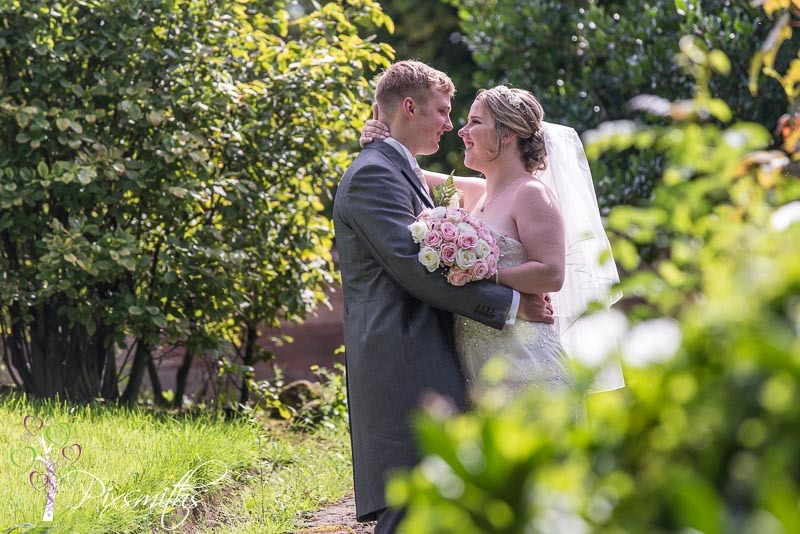 so happy it was a glorious sunny day for them. 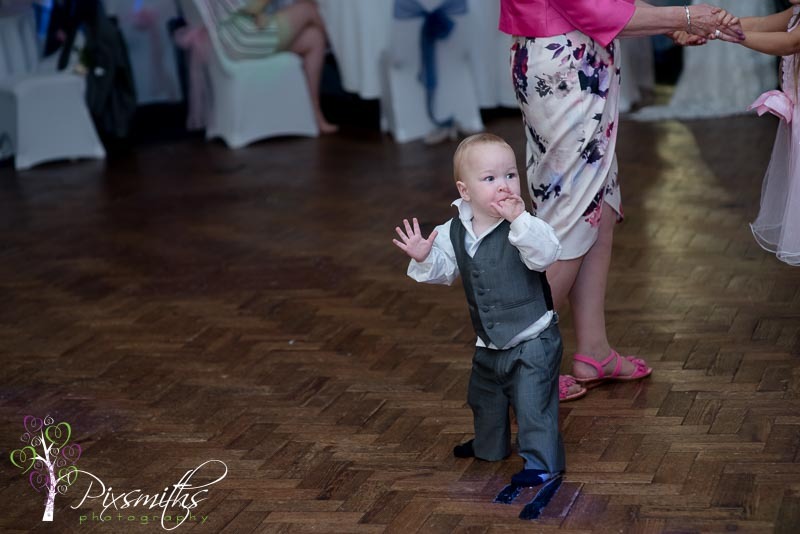 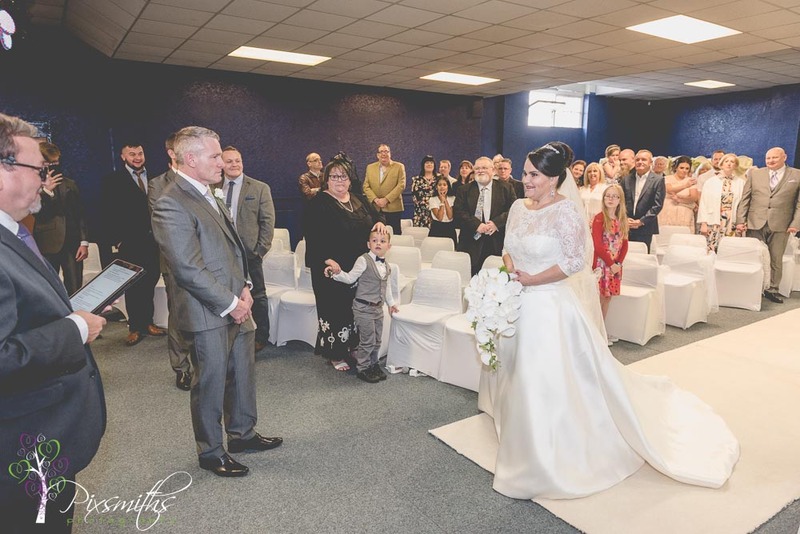 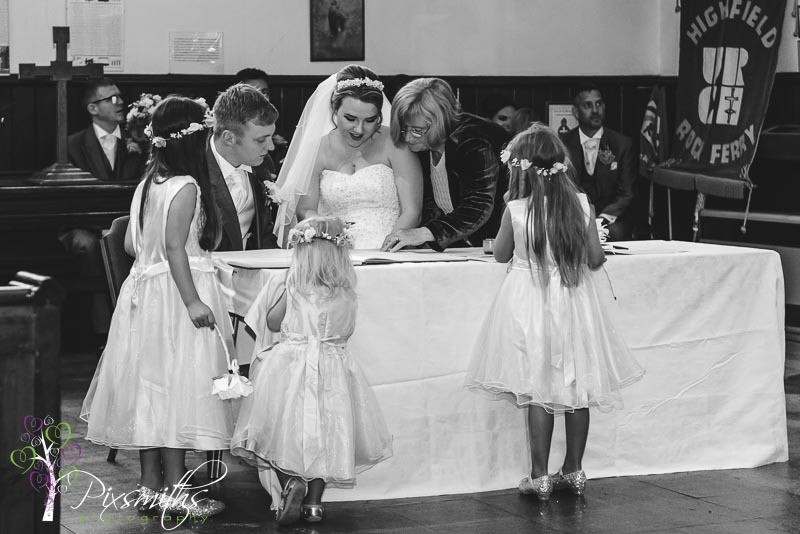 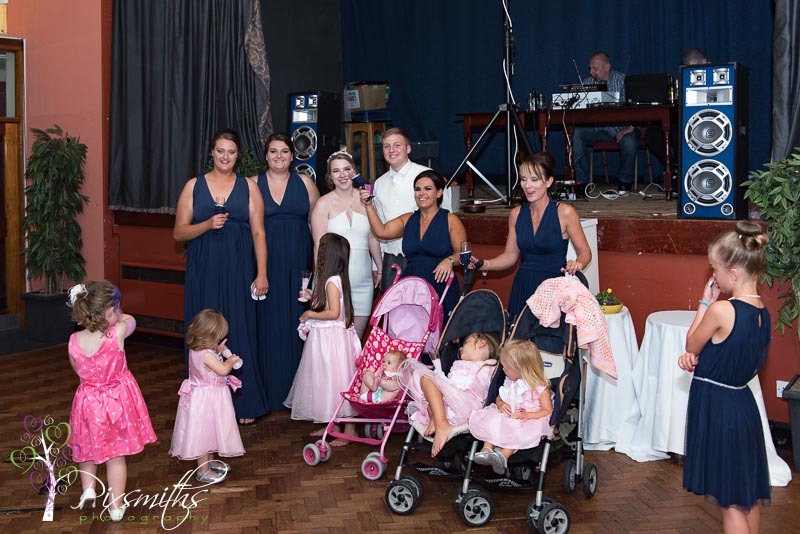 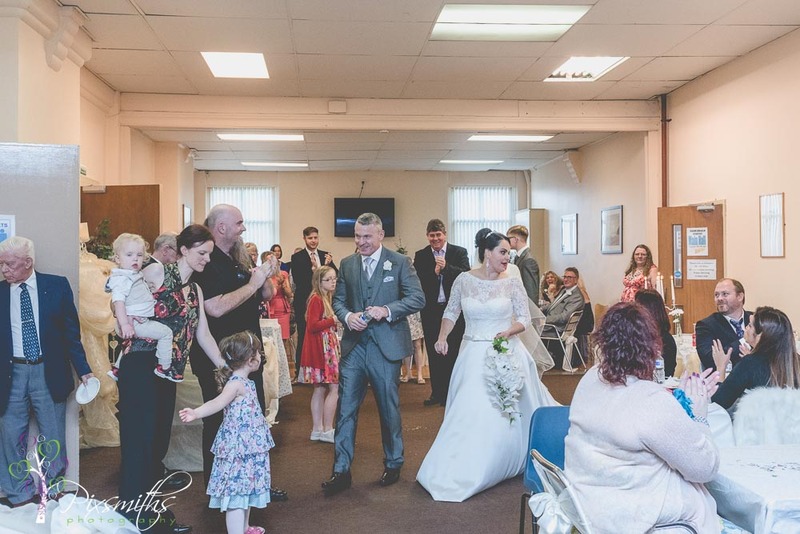 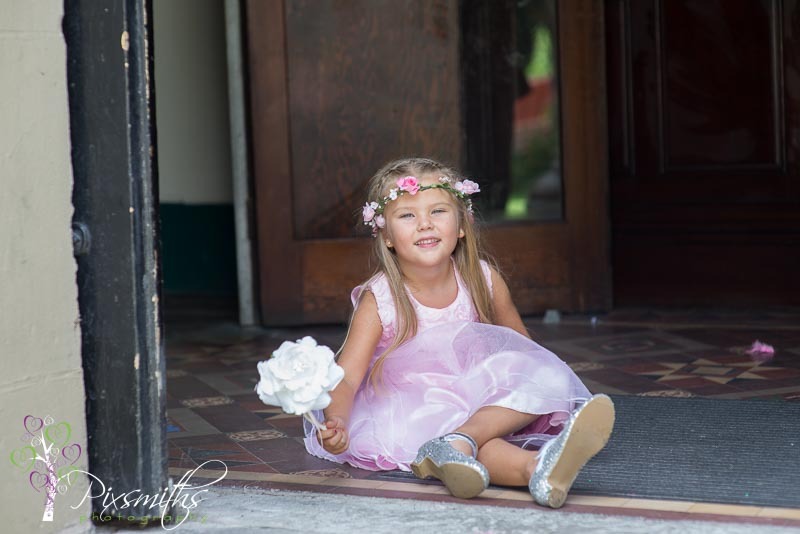 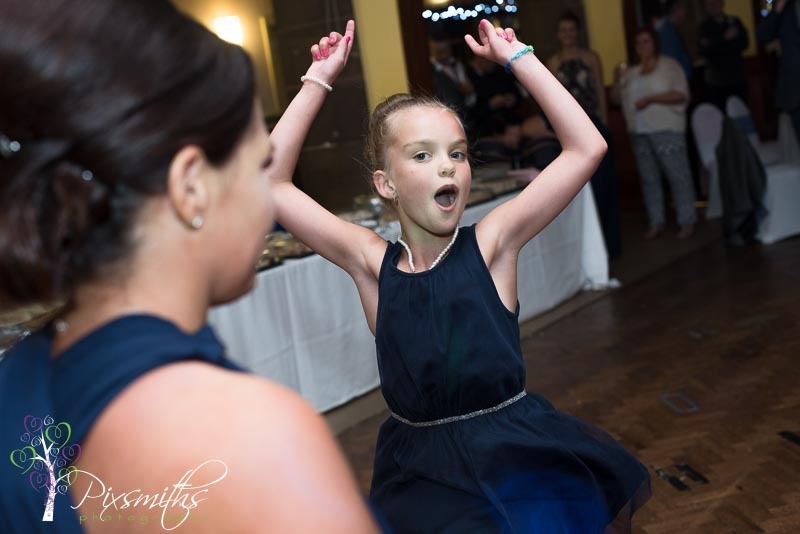 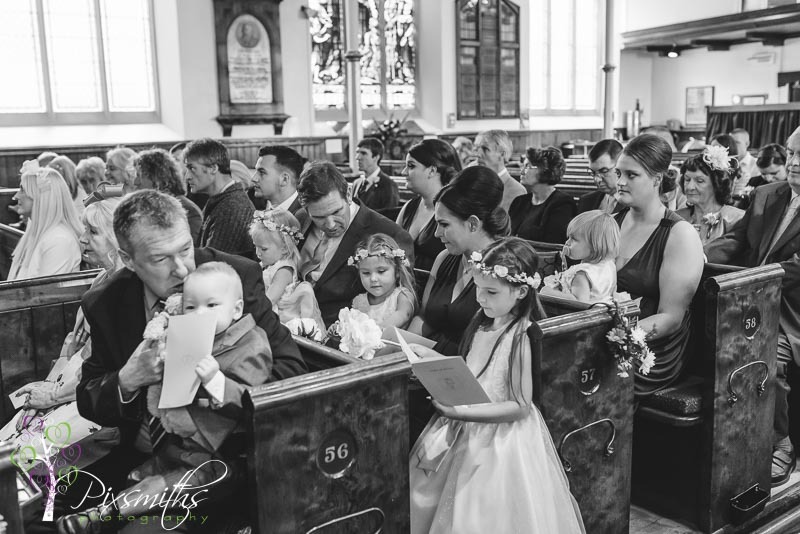 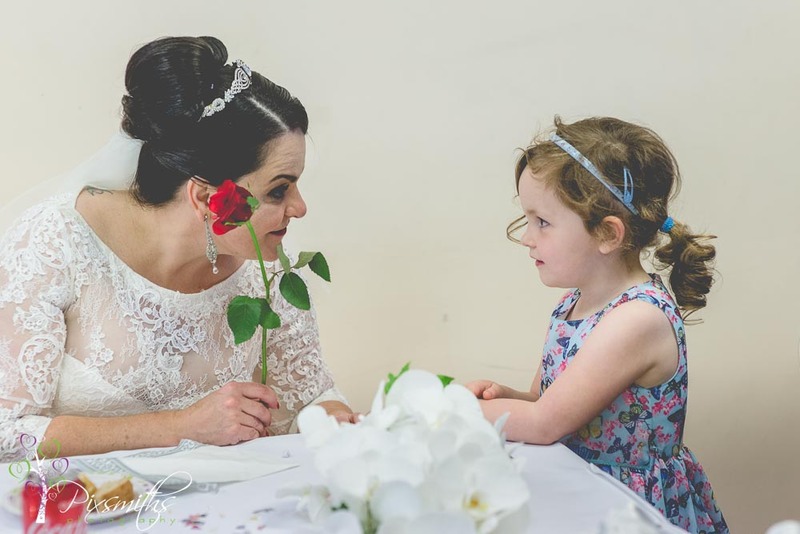 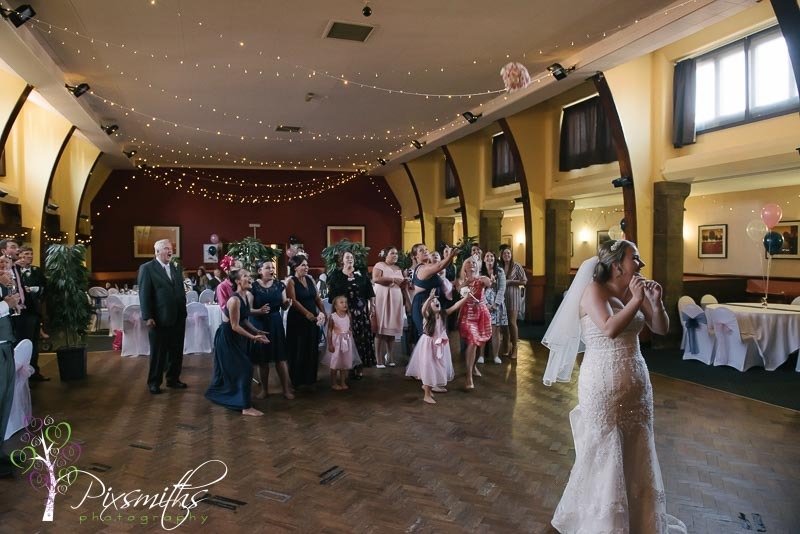 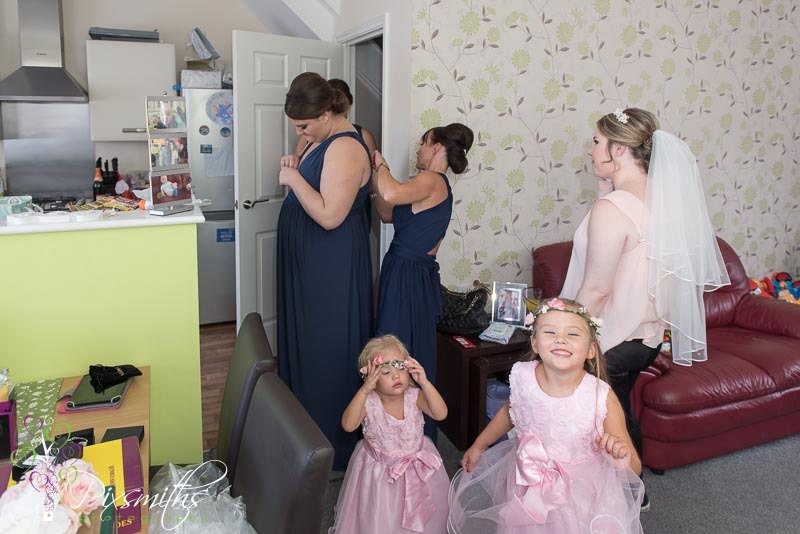 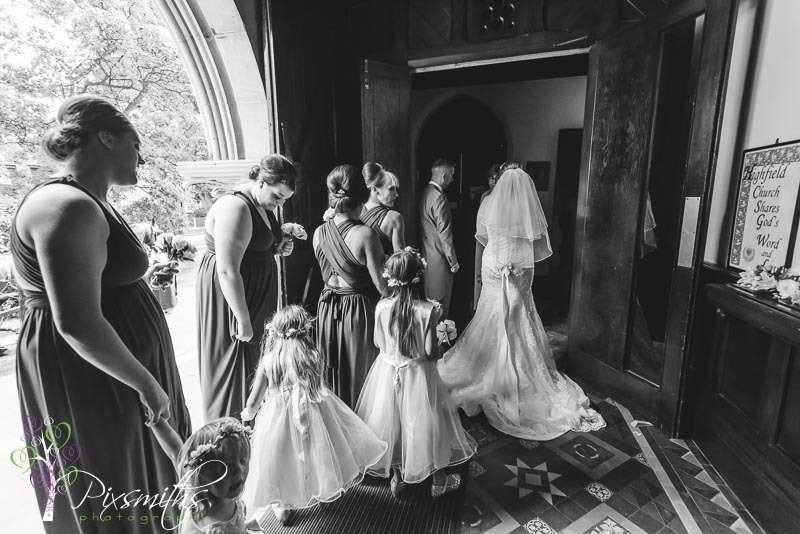 Hannah looked fabulous in her bridal gown as she entered, closely followed by several cute flower girls and bridesmaids and what has to be the cutest ever page boy in tails! 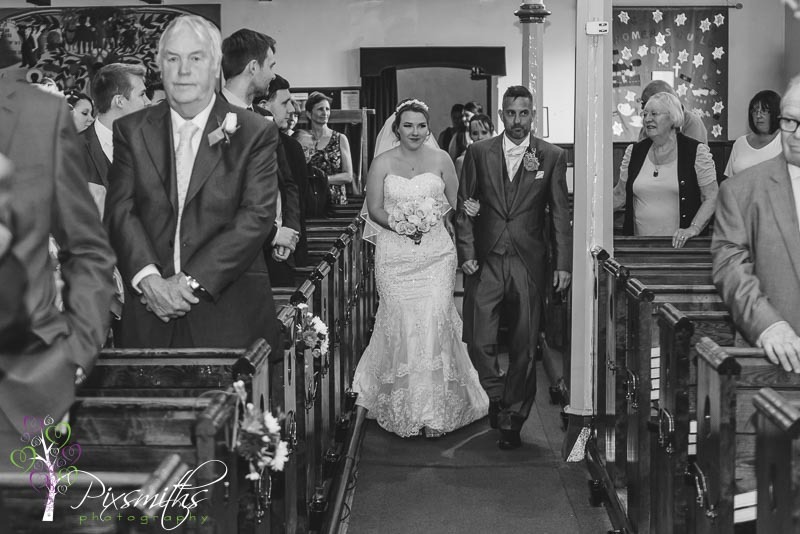 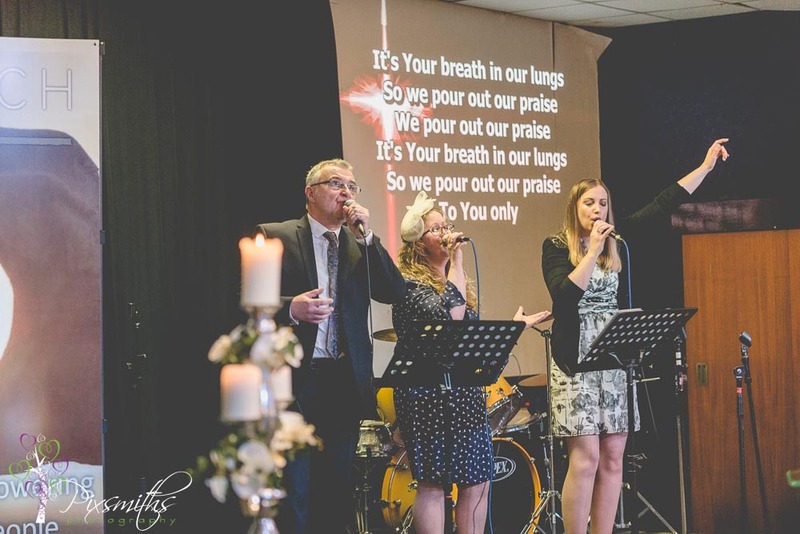 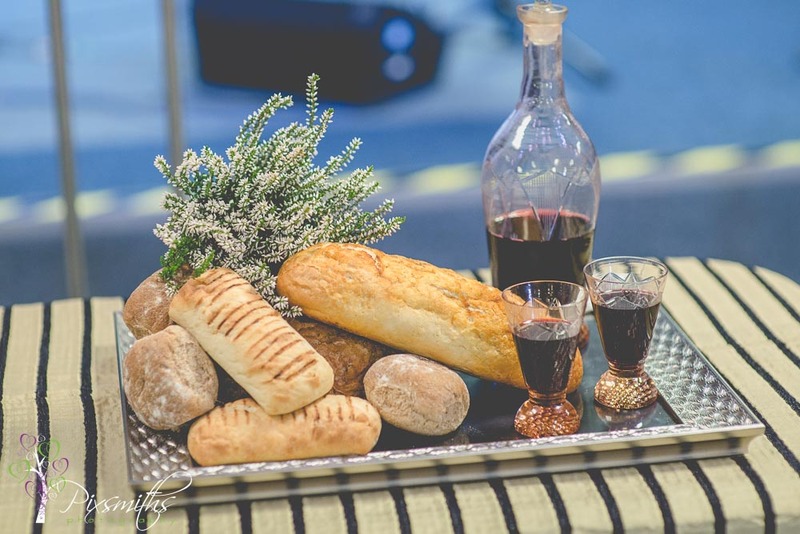 An unusual church in that there is no central aisle but twoside ones, so processional down one and recessional the other one! 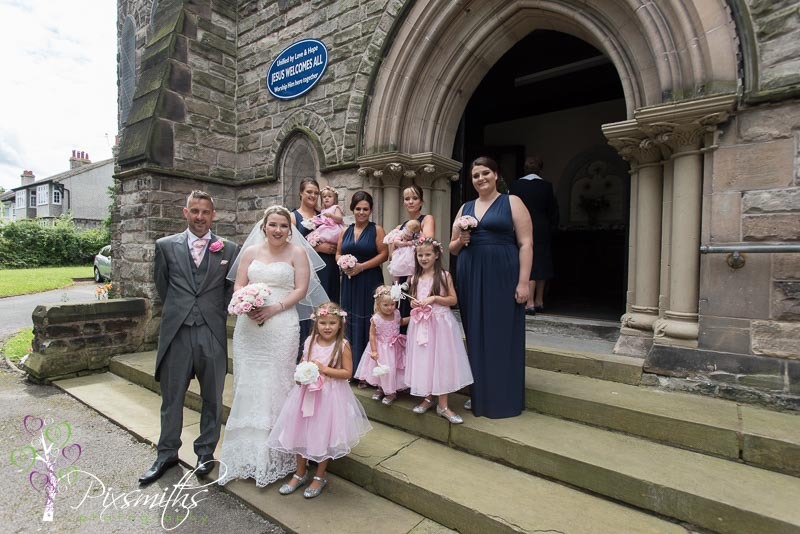 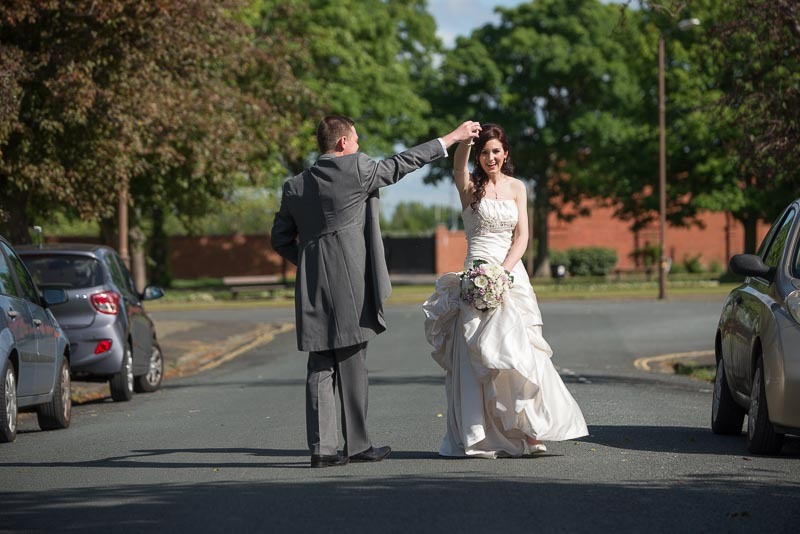 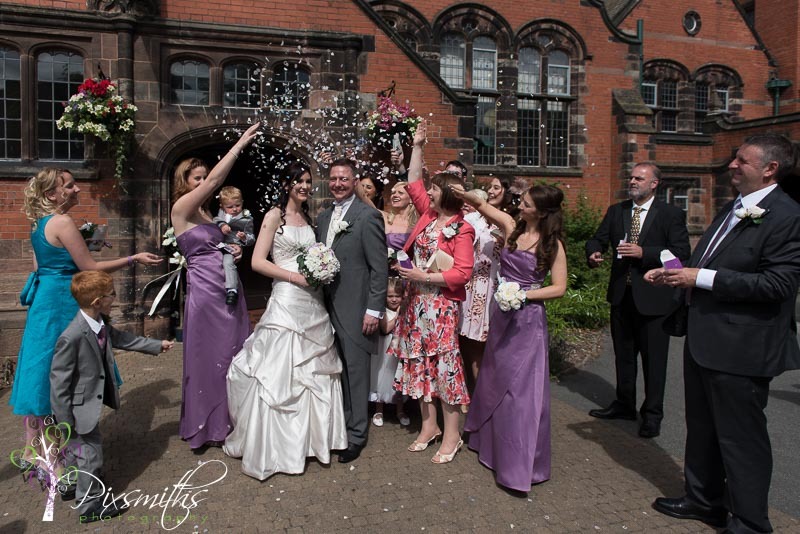 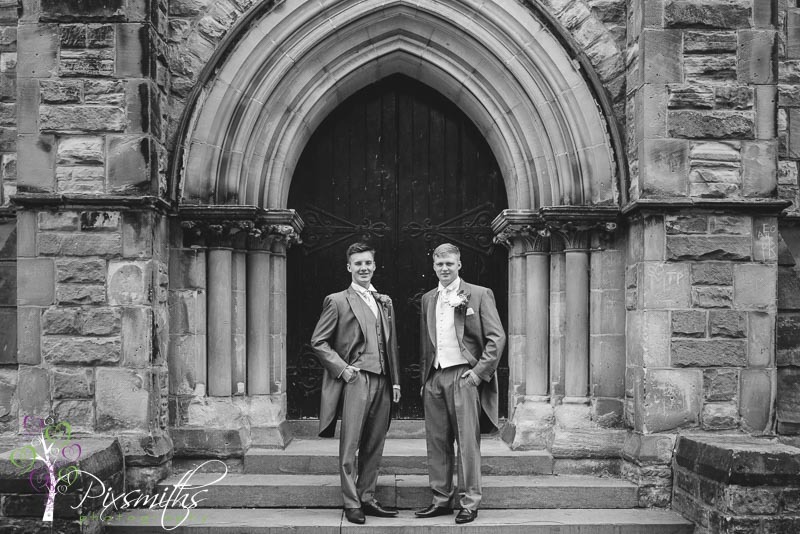 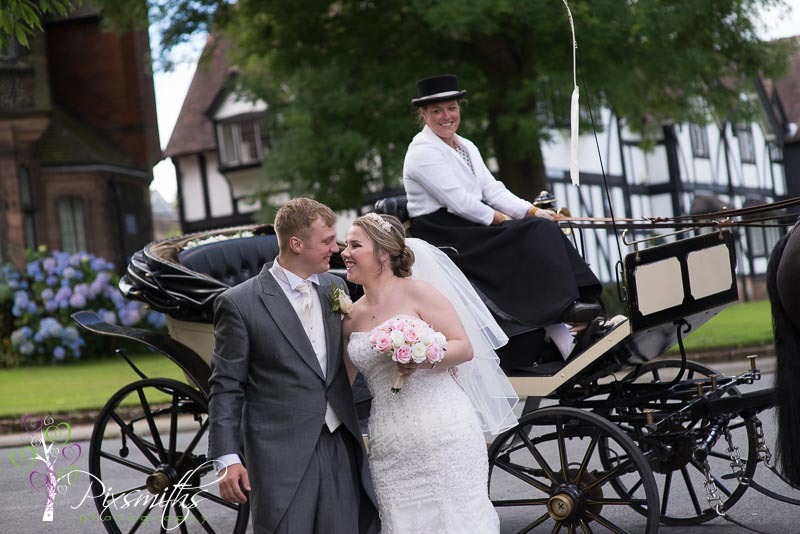 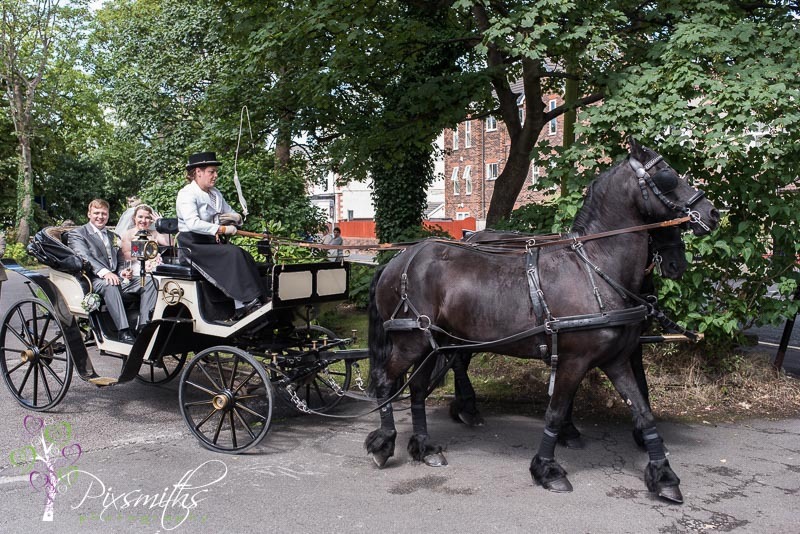 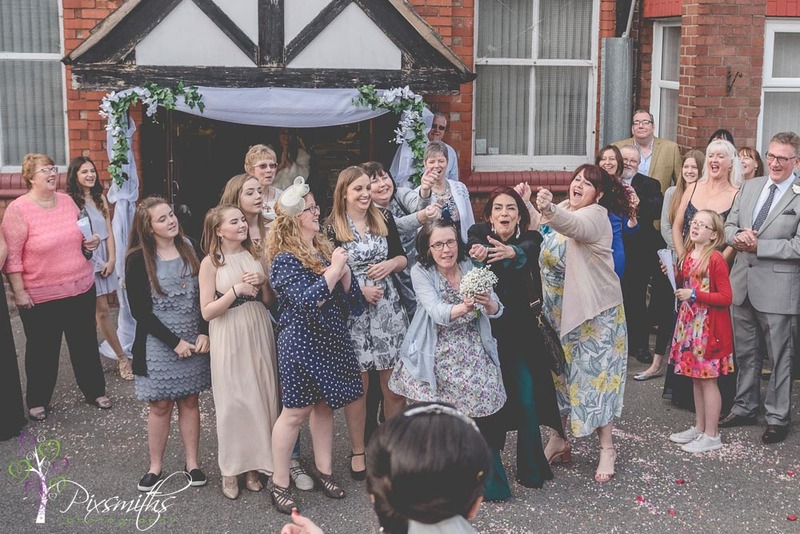 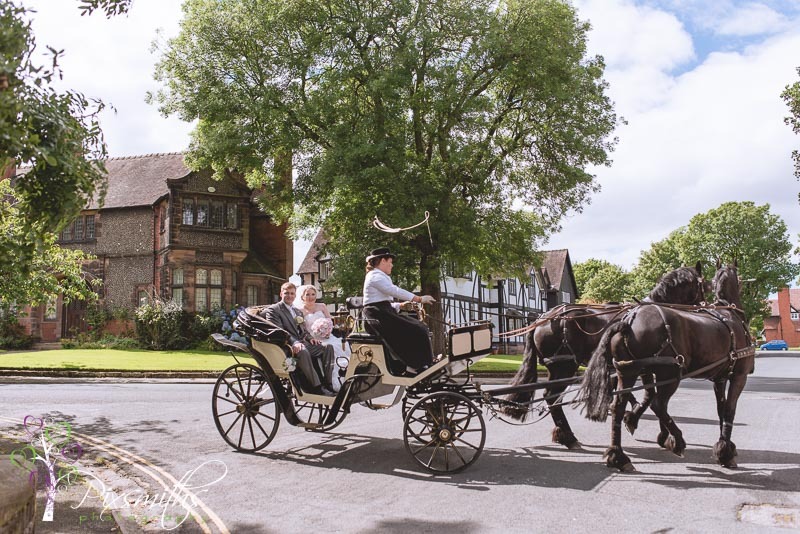 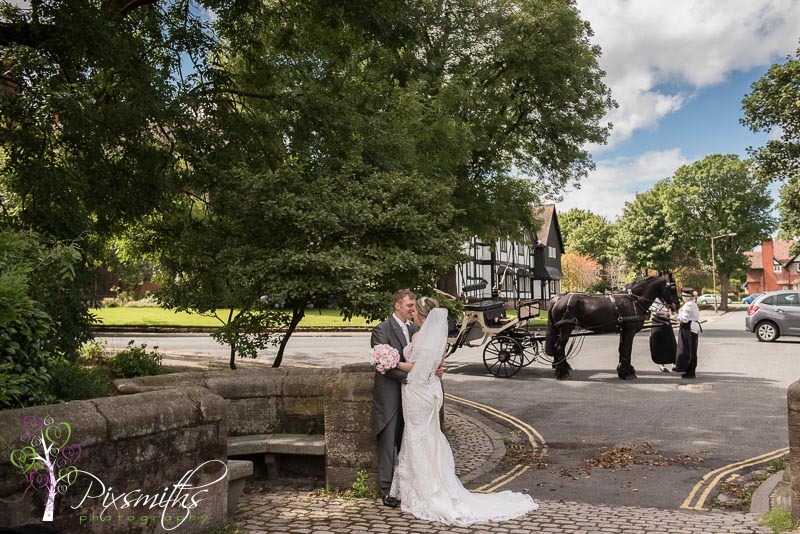 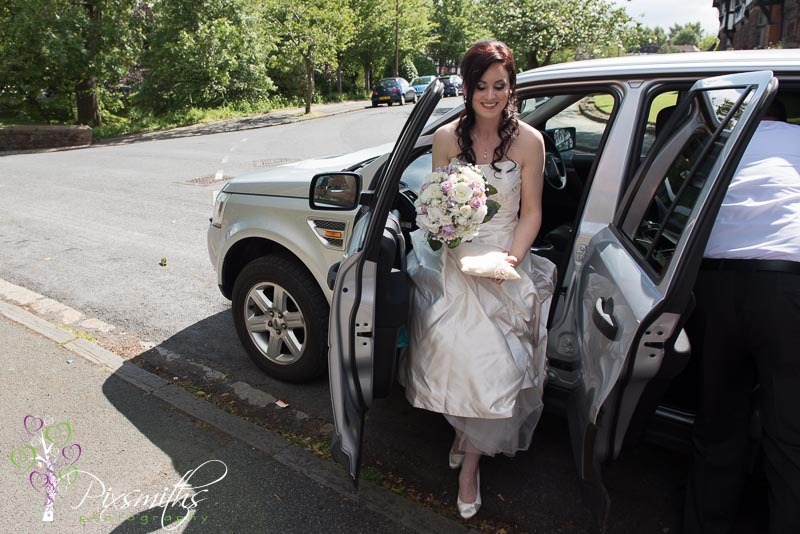 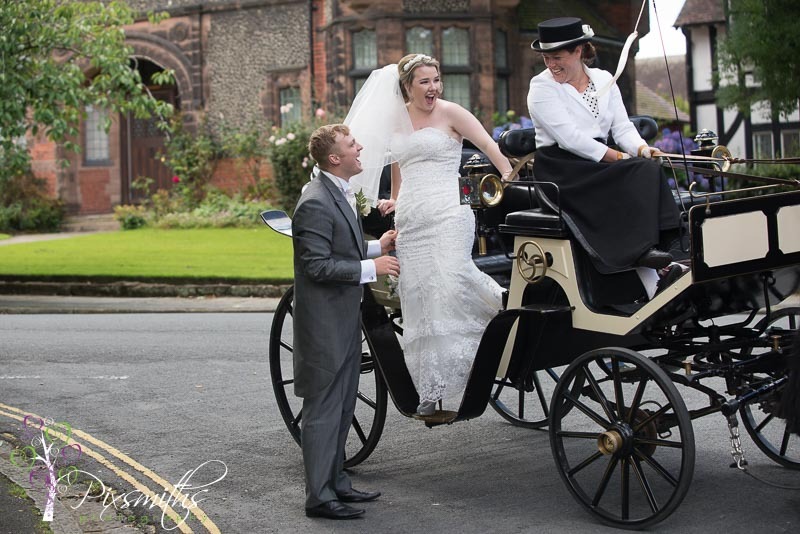 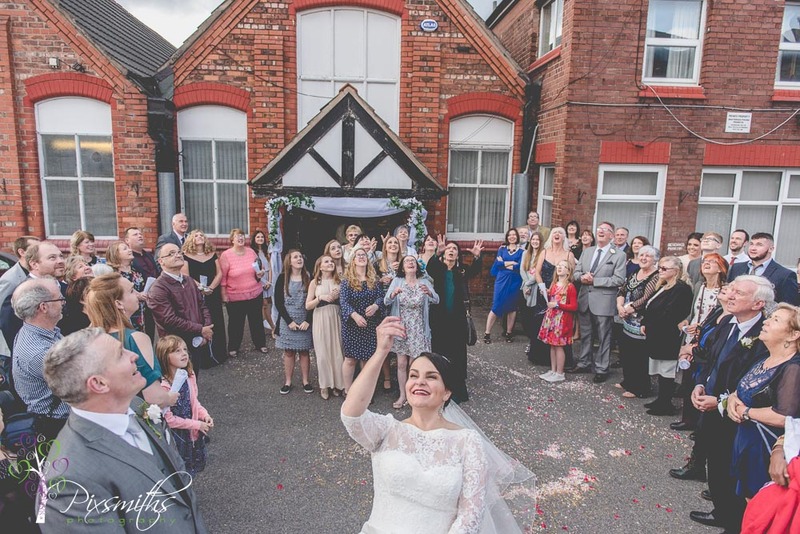 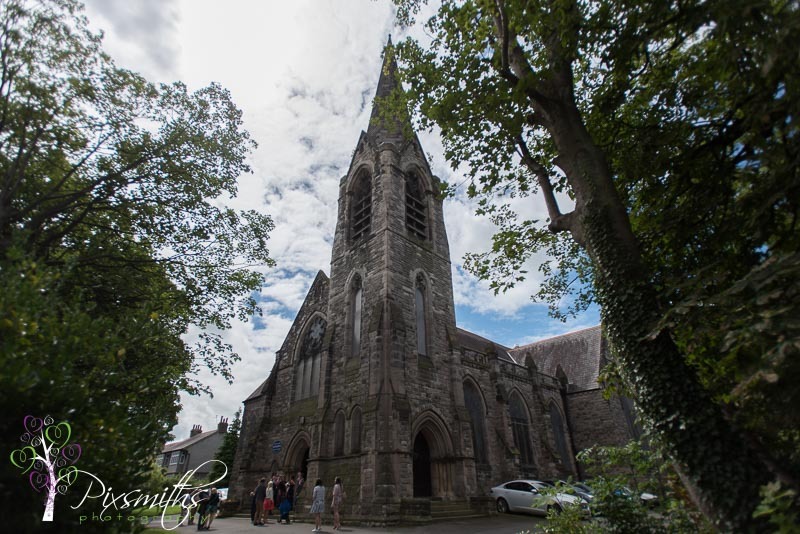 Groups soon accomplished at the church Bride and Groom now husband and wife took the carriage to nearby Port Sunlight for their wedding images. 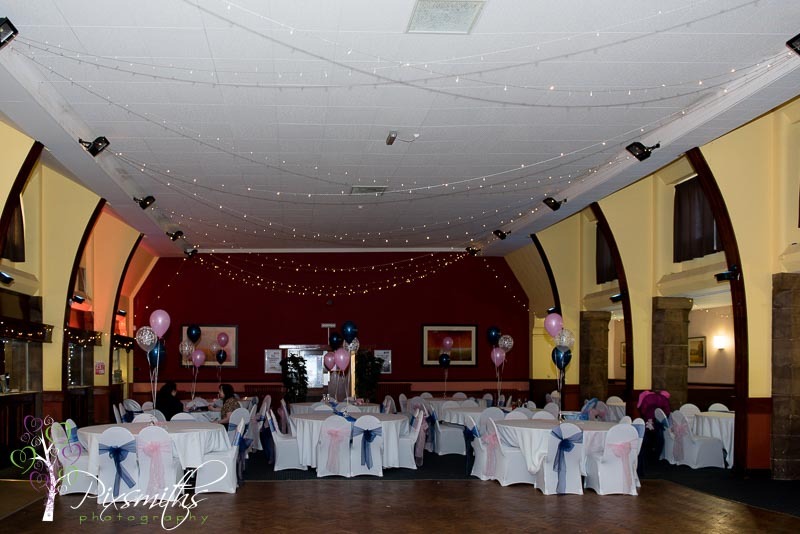 Reception followed at St Anne’s, loved the fairy lights set up and such a spacious room. 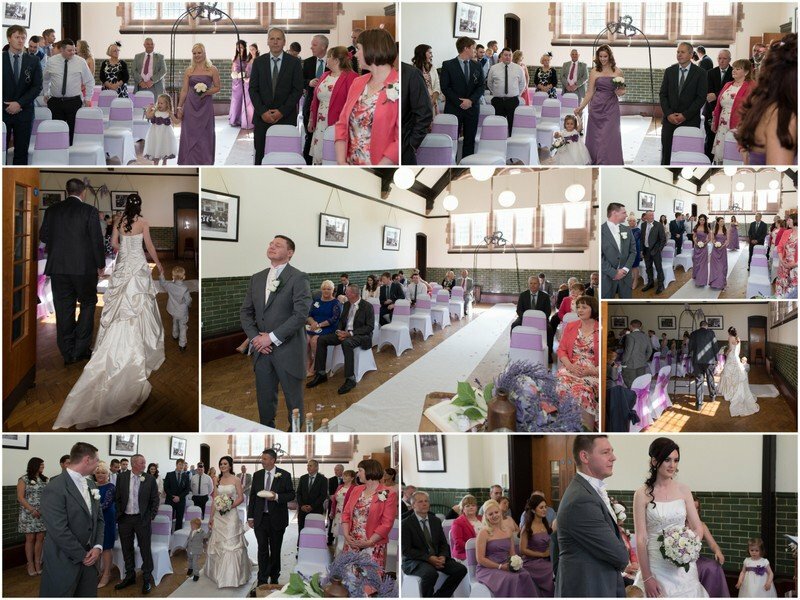 Staff were lovely,looking after everyone, including us, so well. 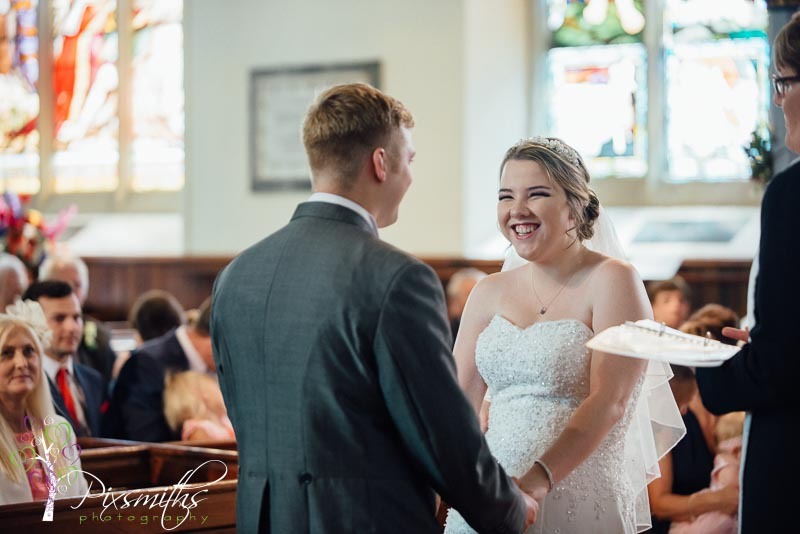 Just loved Hannah’s beaming smile. 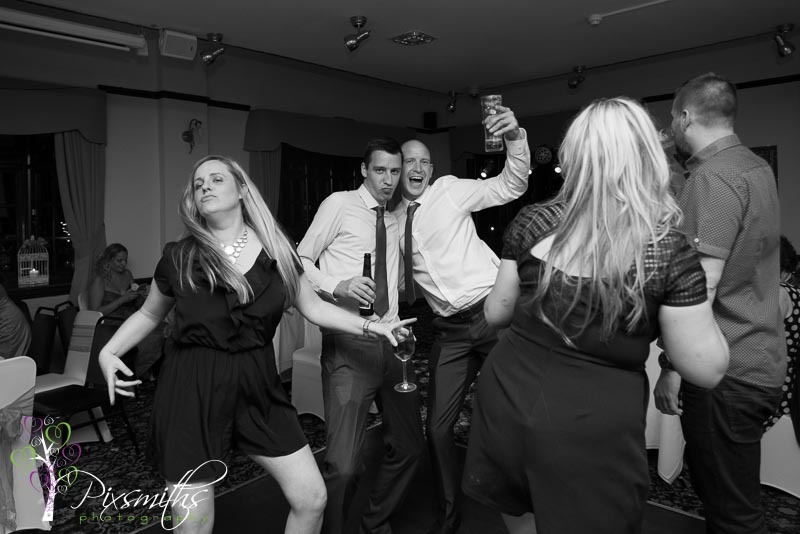 Lots of action on the dance floor in teh evening, a wonderful day had by all. 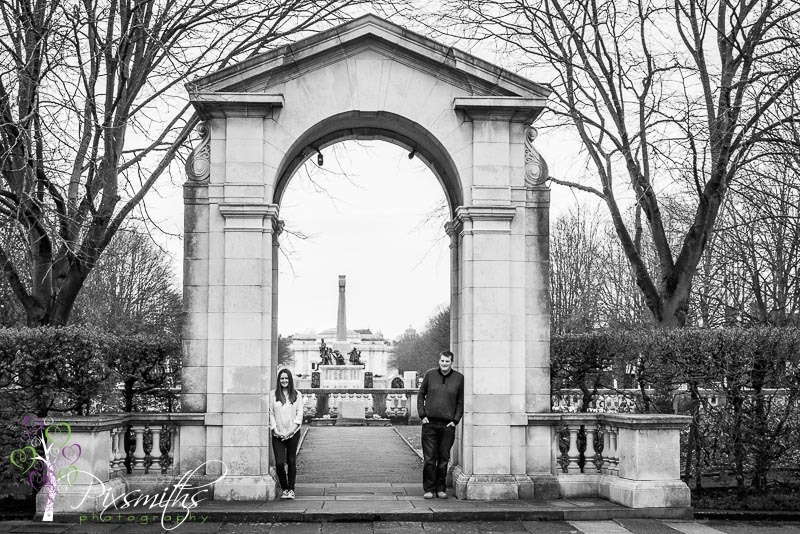 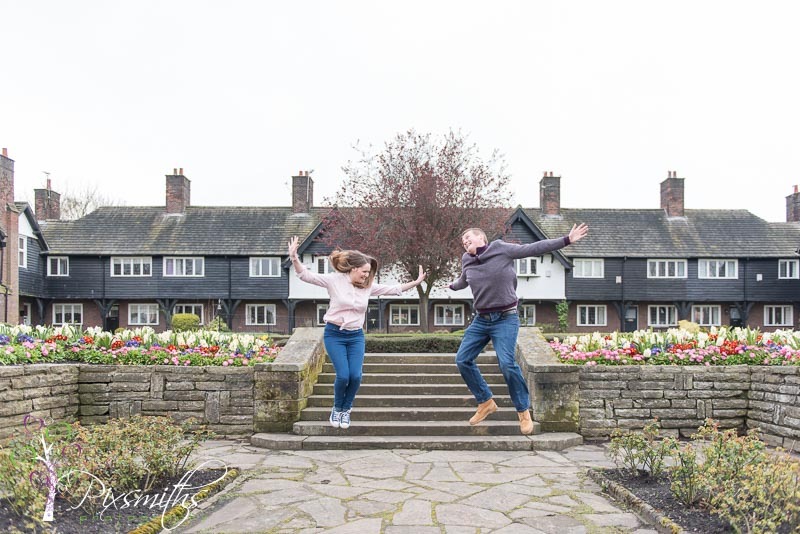 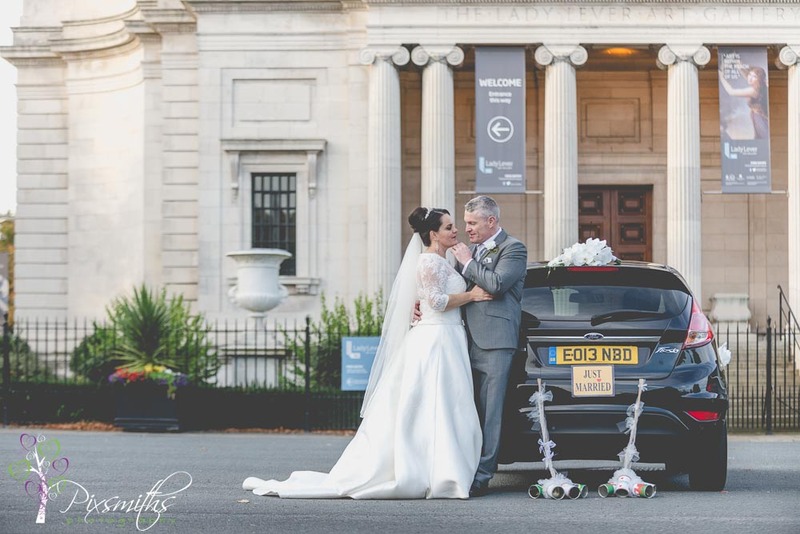 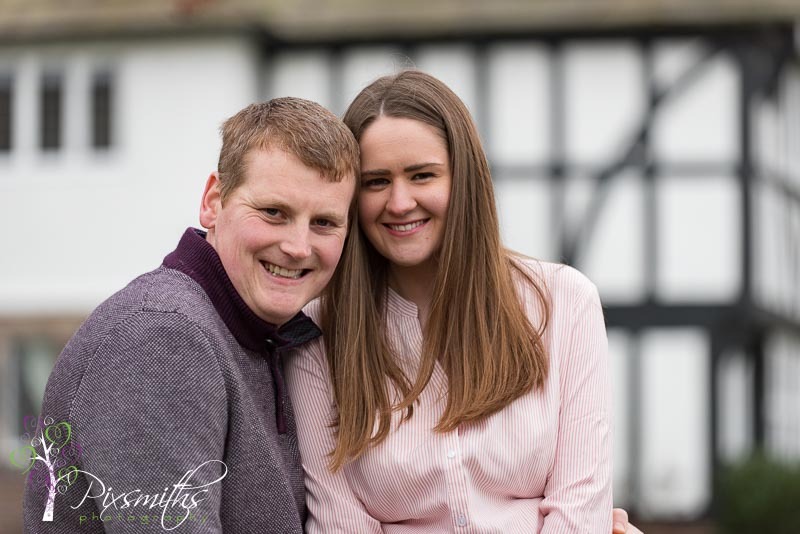 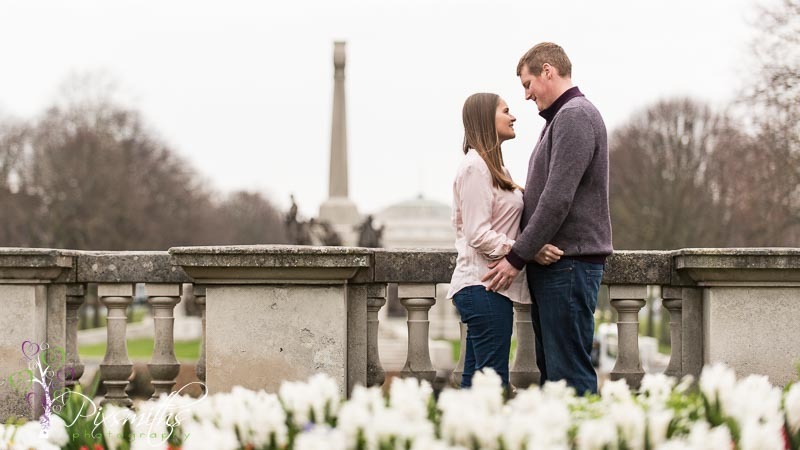 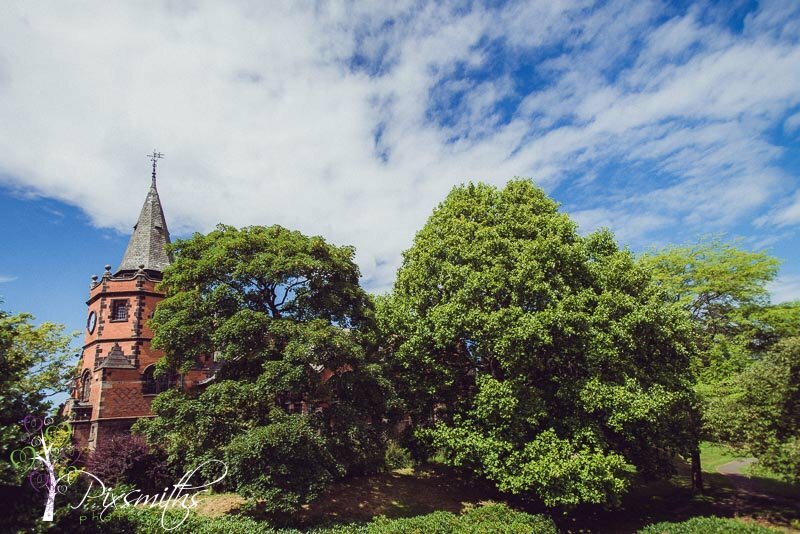 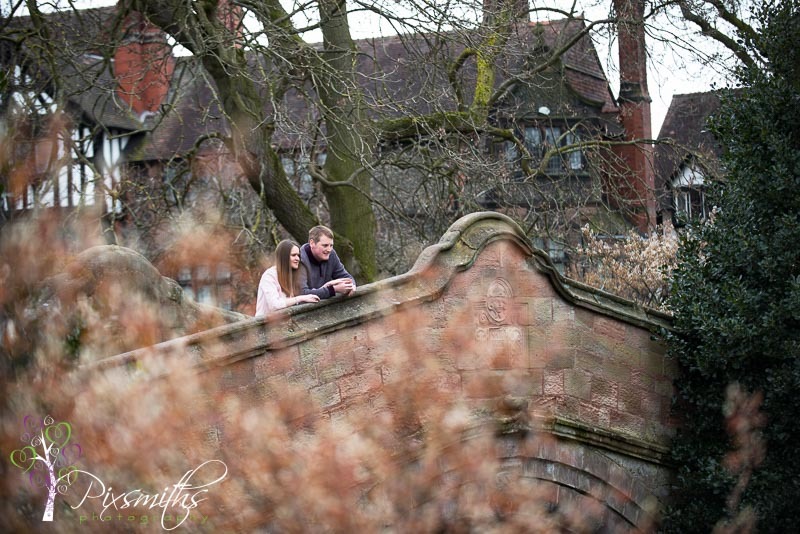 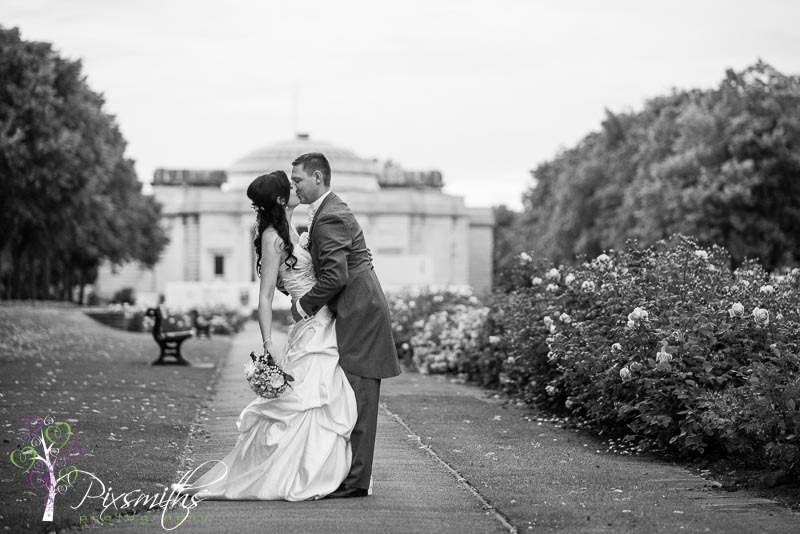 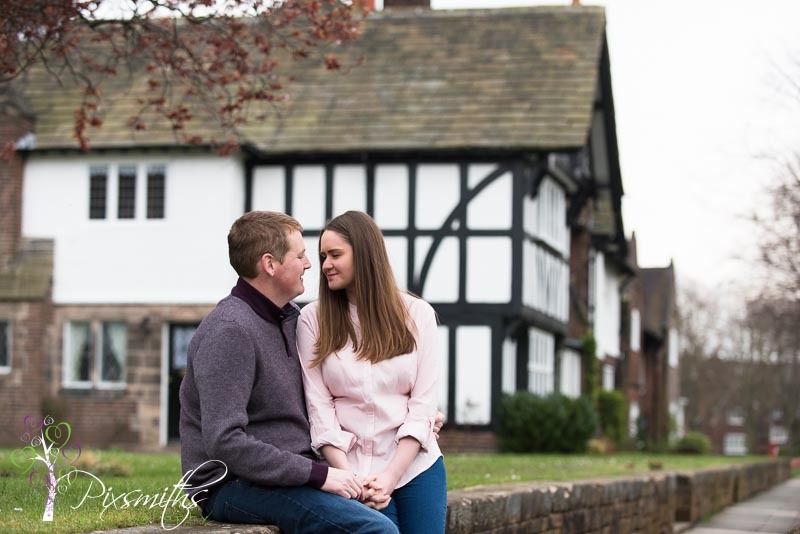 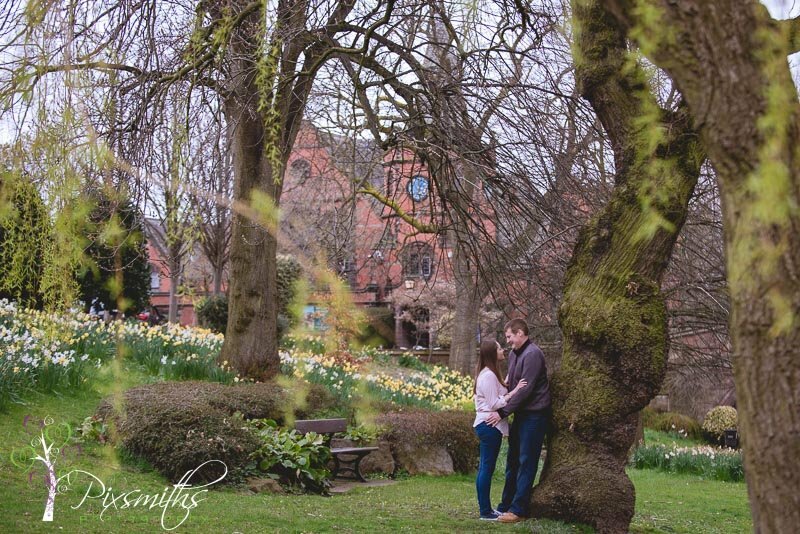 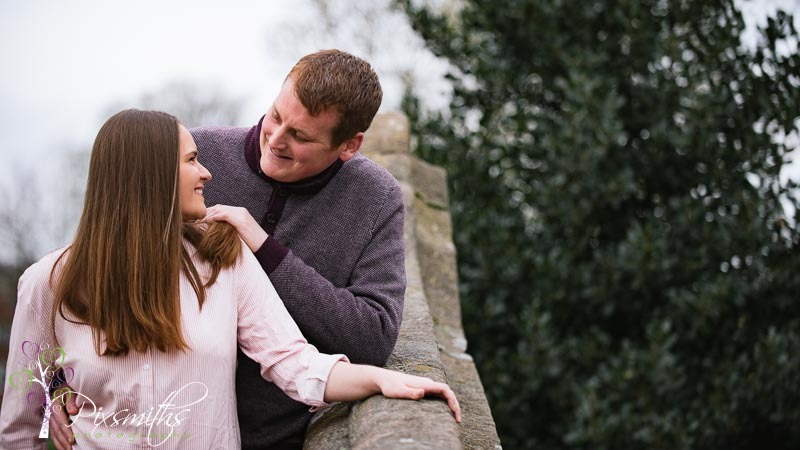 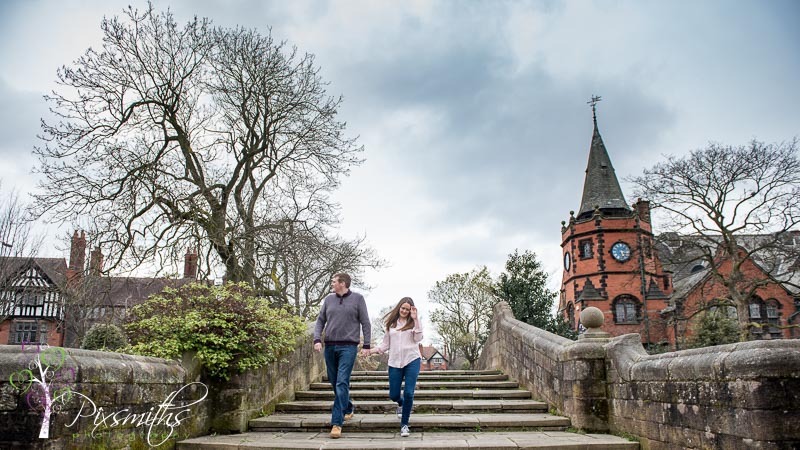 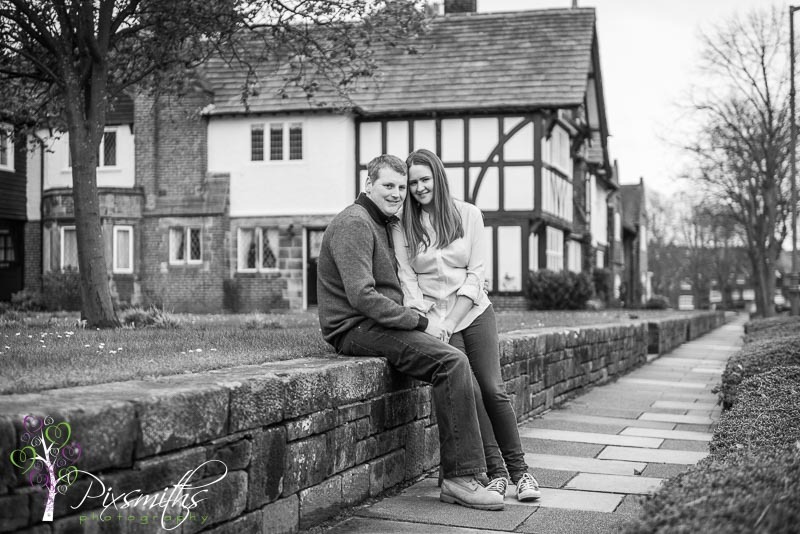 Evelyn and Lewis chose historic village of Port Sunlight for their pre wedding shoot – first time Lewis had been there and they loved it! 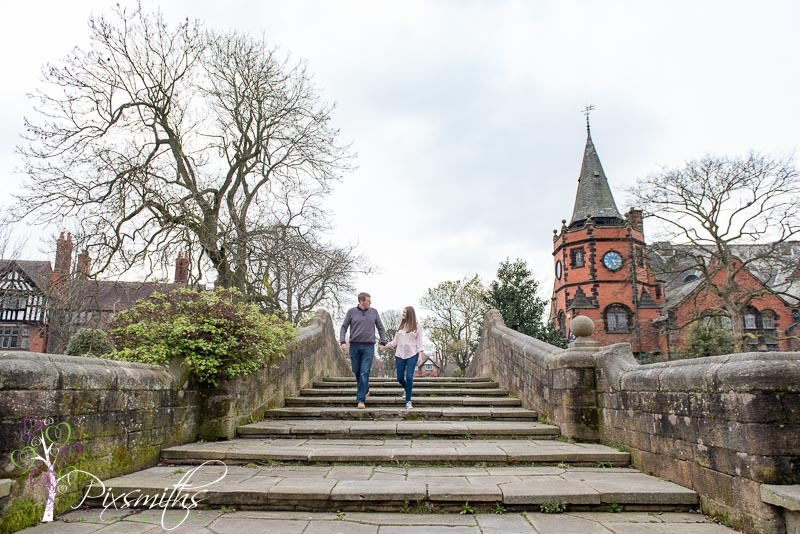 The Dell at Port Sunlight is always a popular choice for a shoot and one we also enjoy this location., so much choice and always different in the changin seasons. 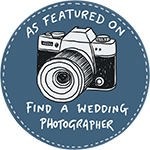 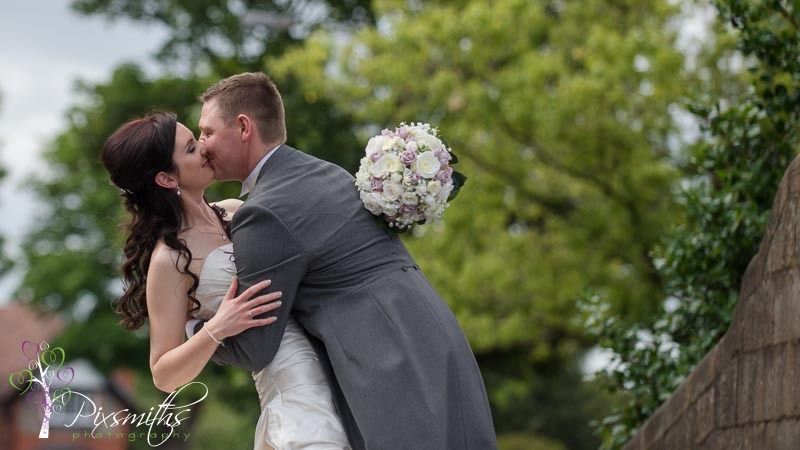 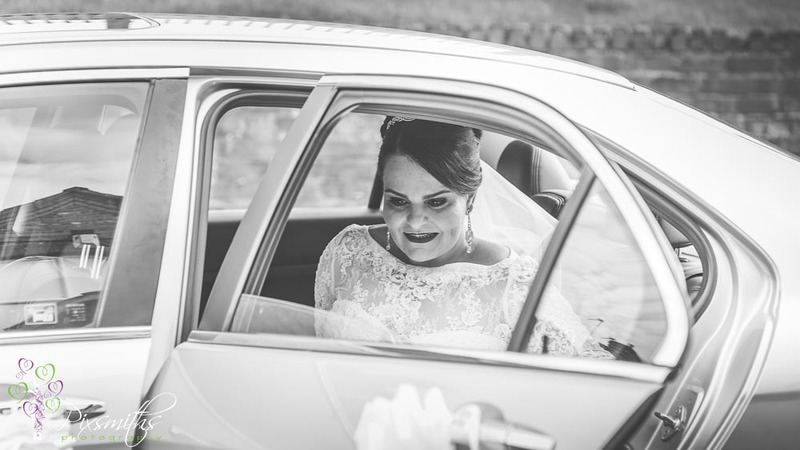 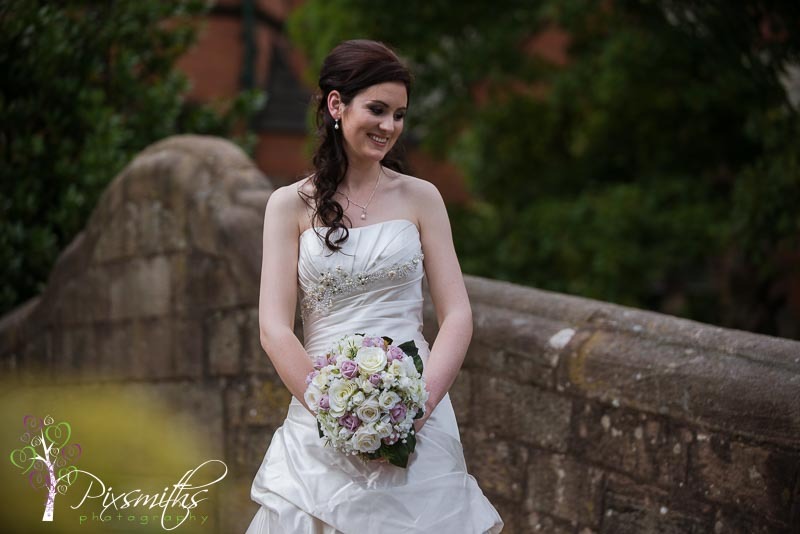 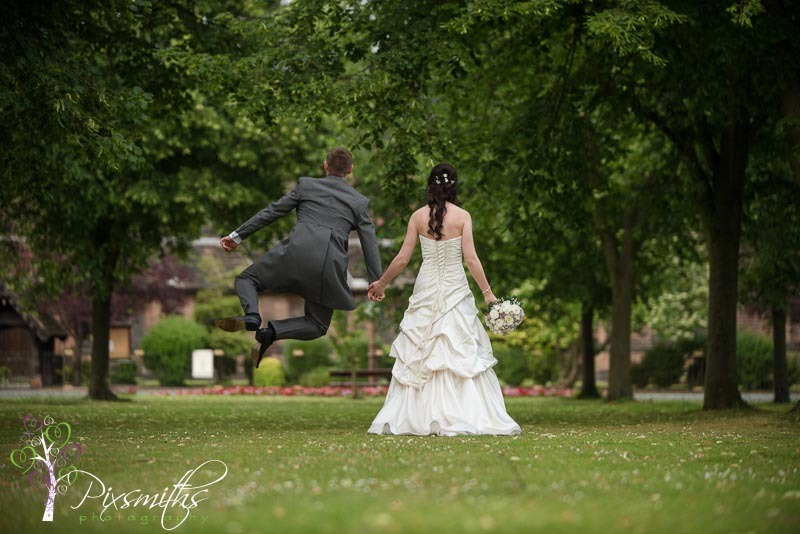 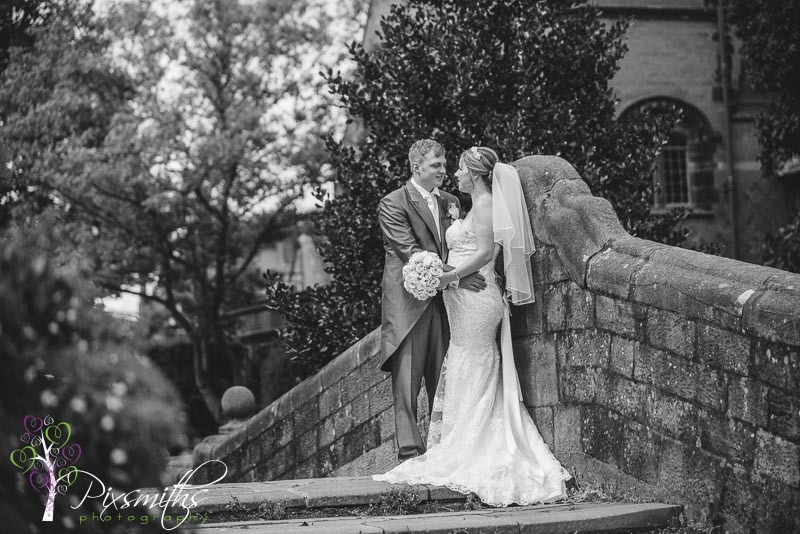 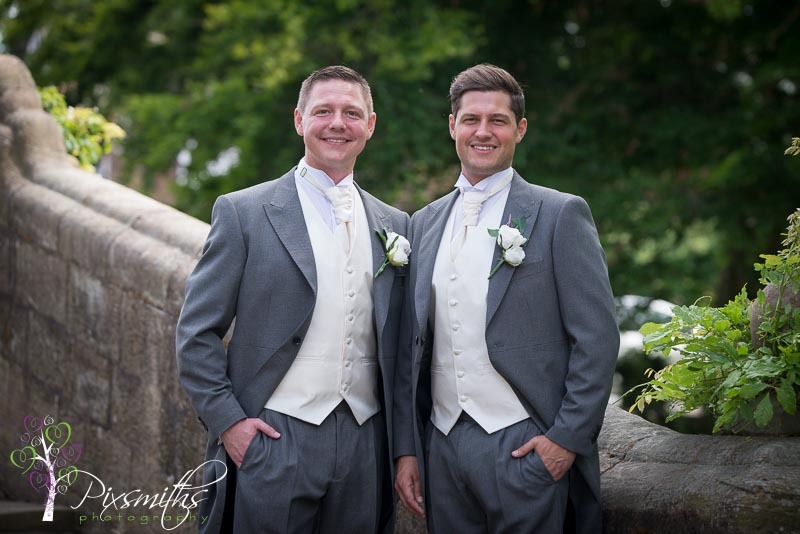 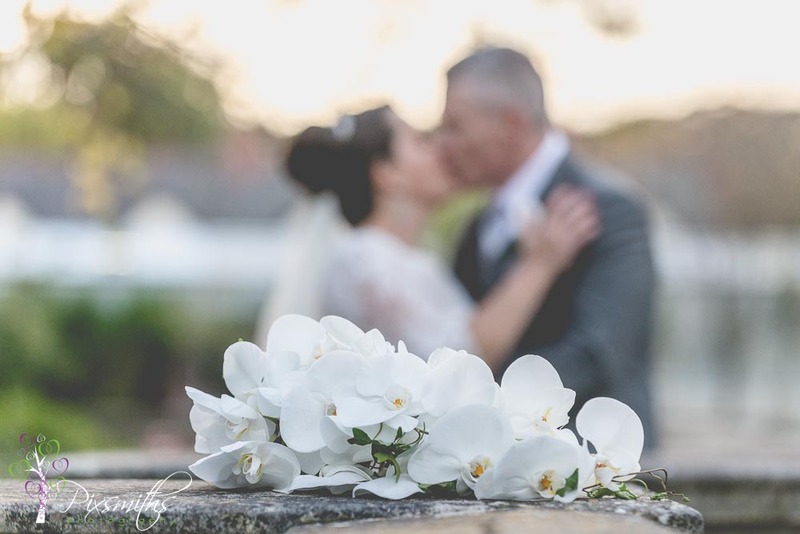 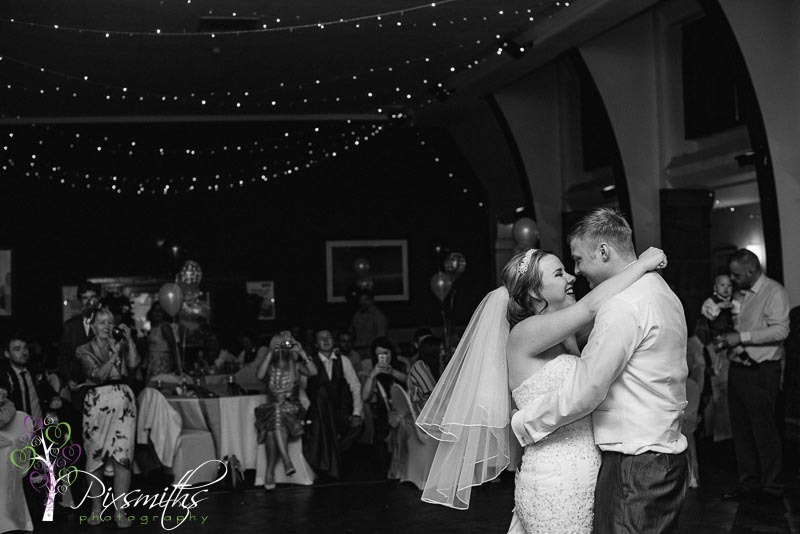 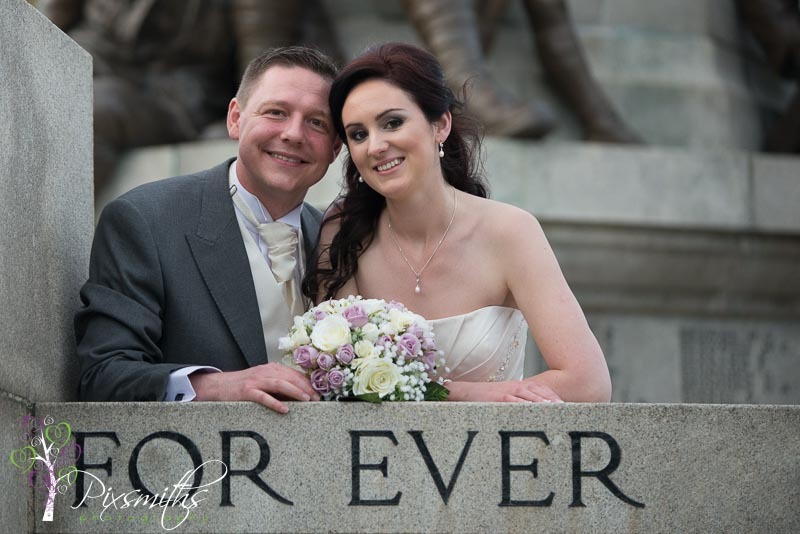 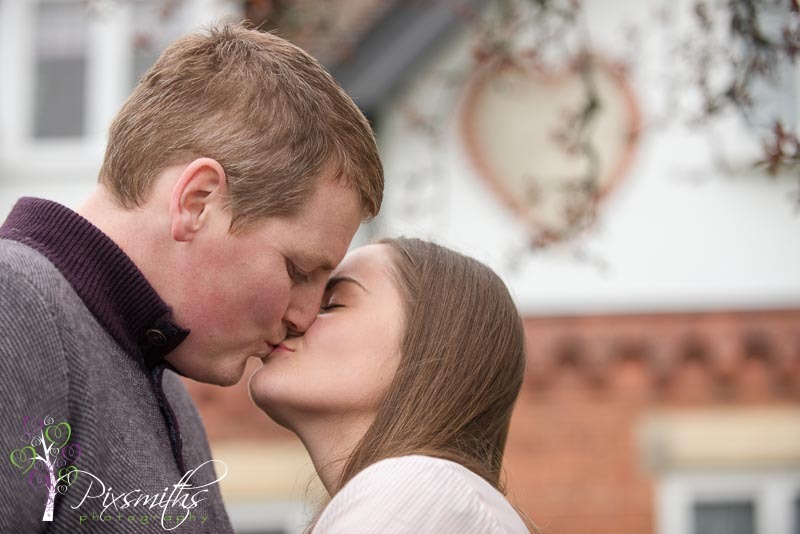 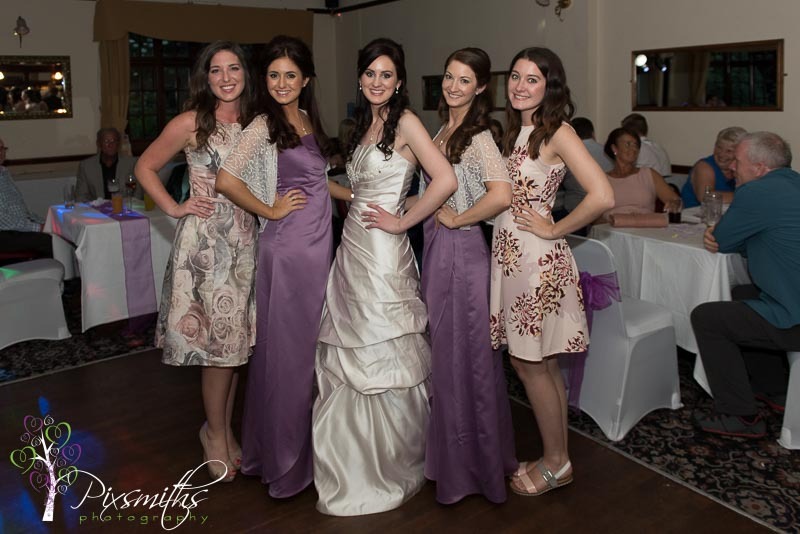 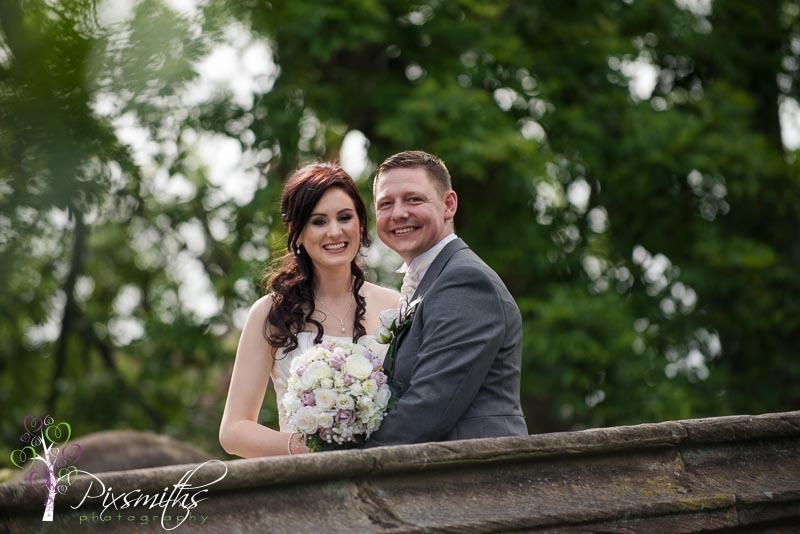 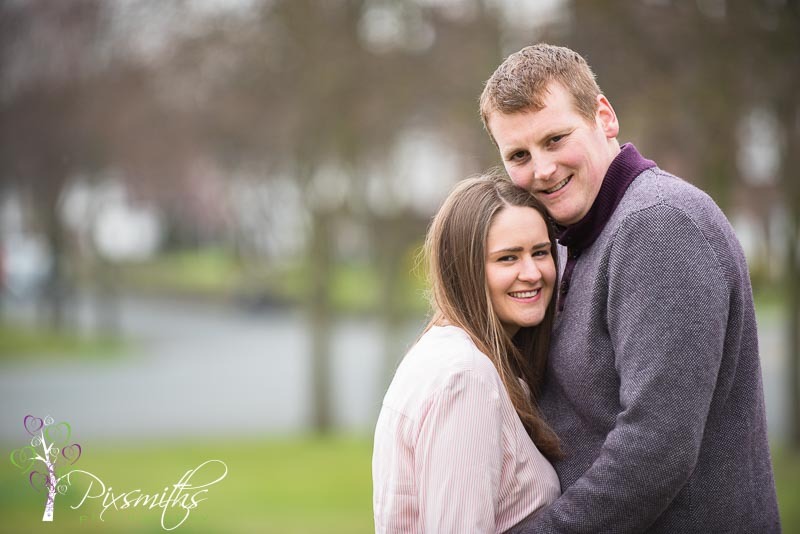 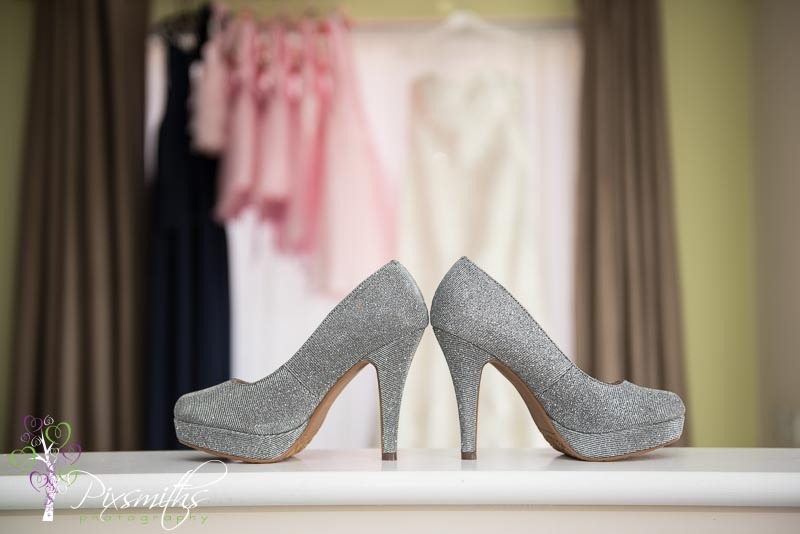 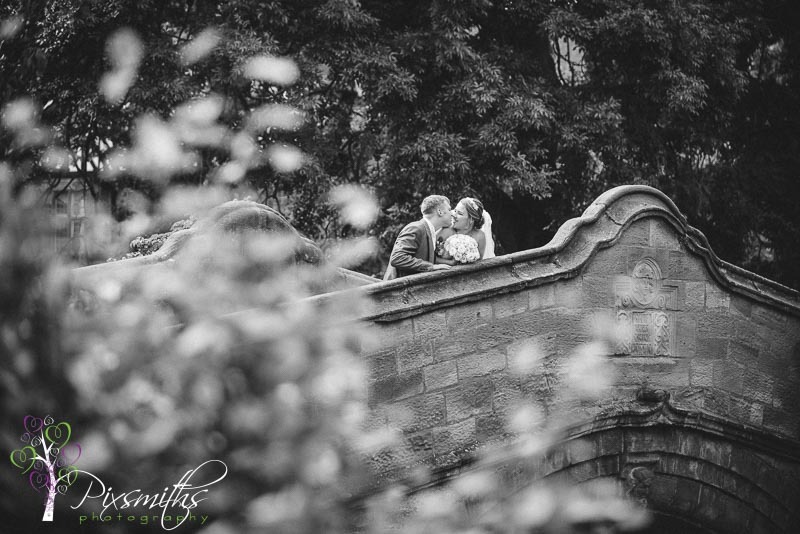 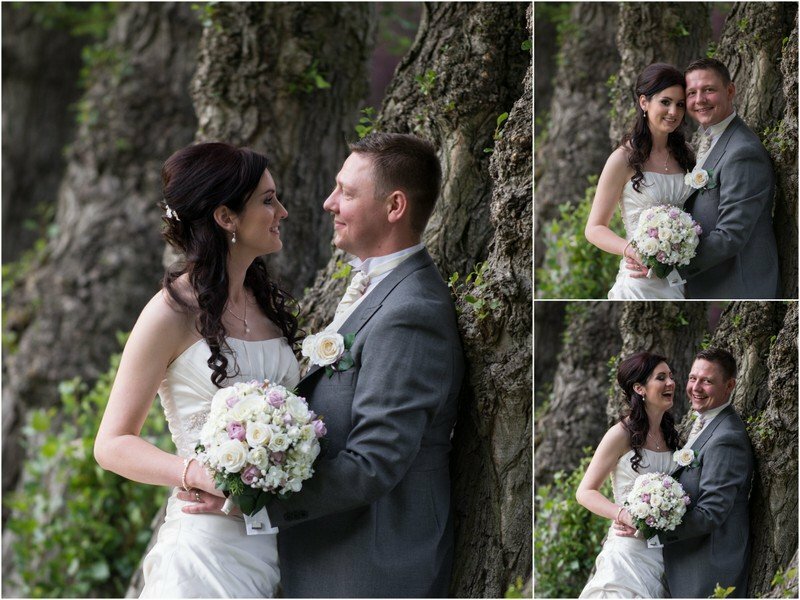 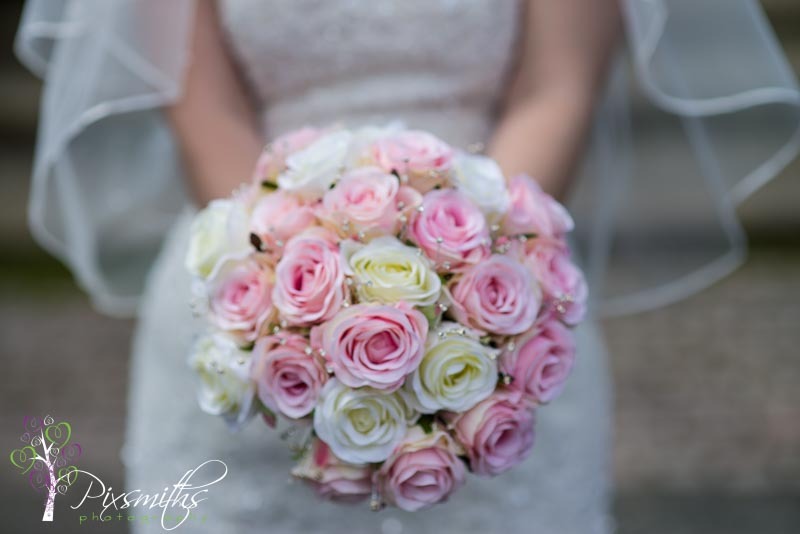 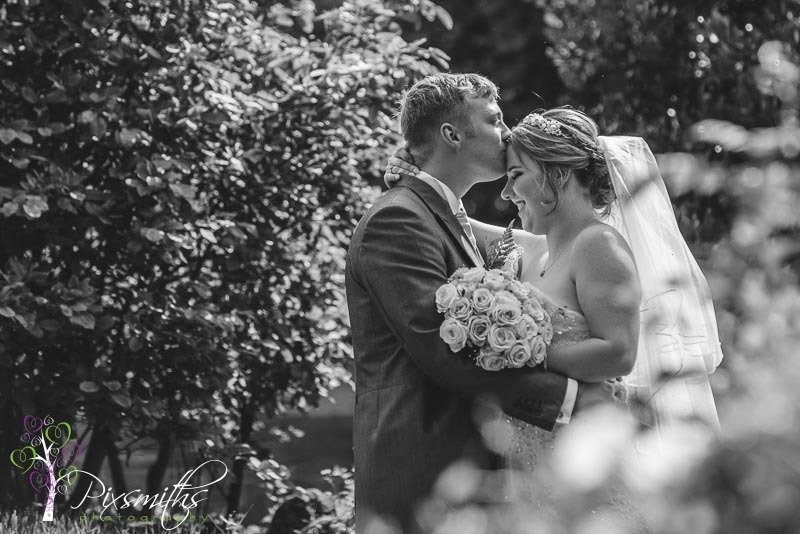 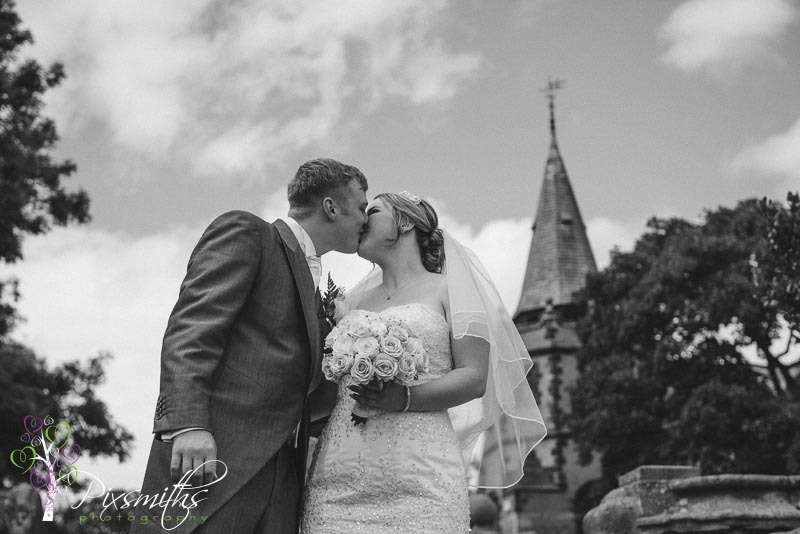 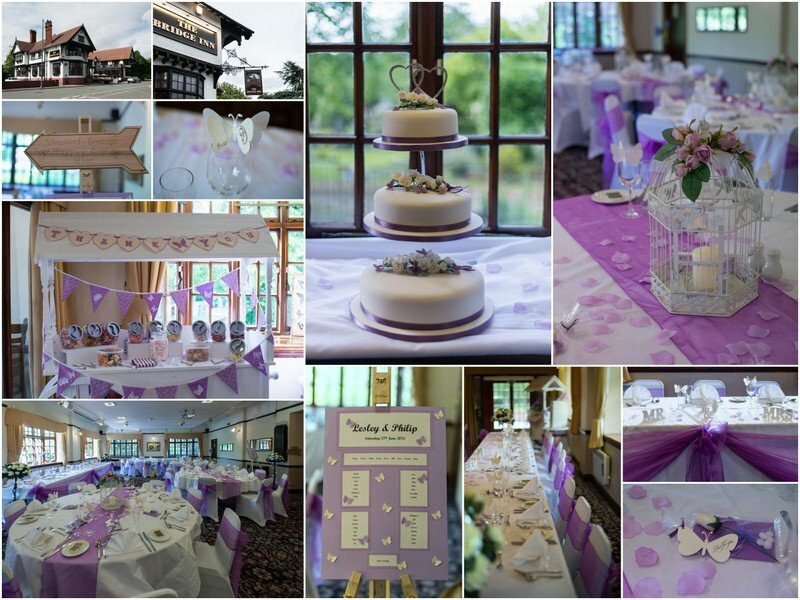 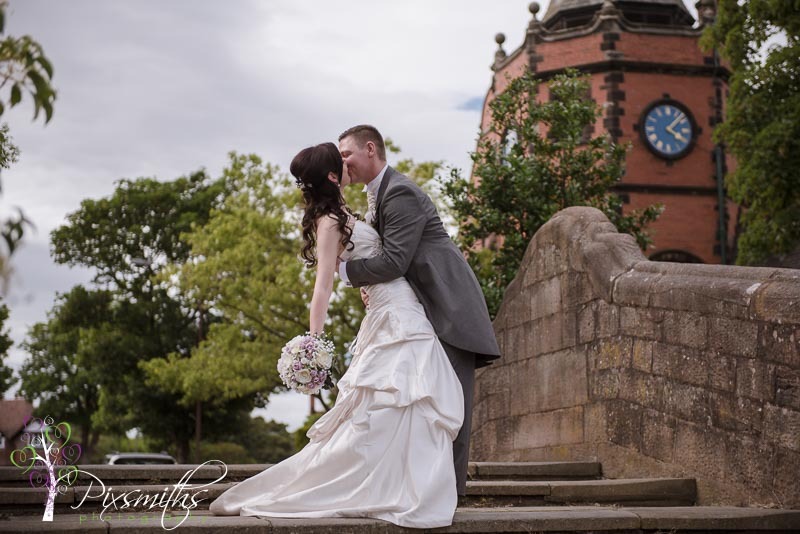 Pixsmiths Creative Photography are so looking forward to their summer wedding at Crabwall Manor. 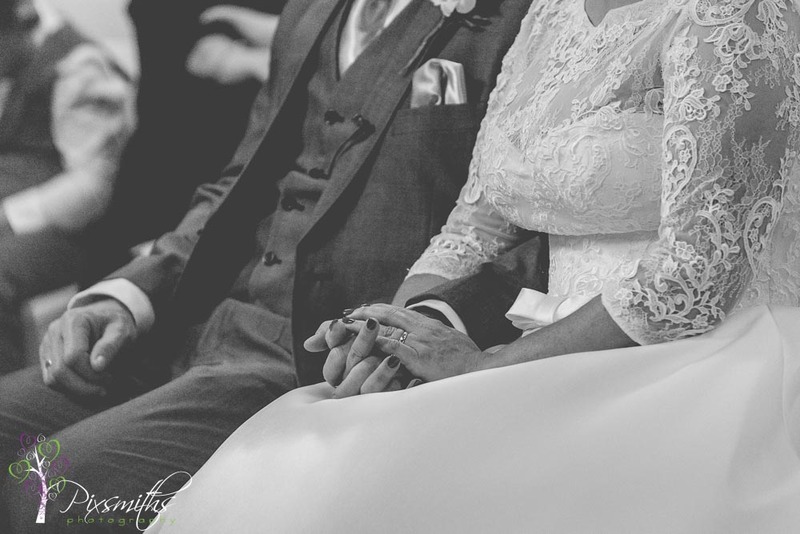 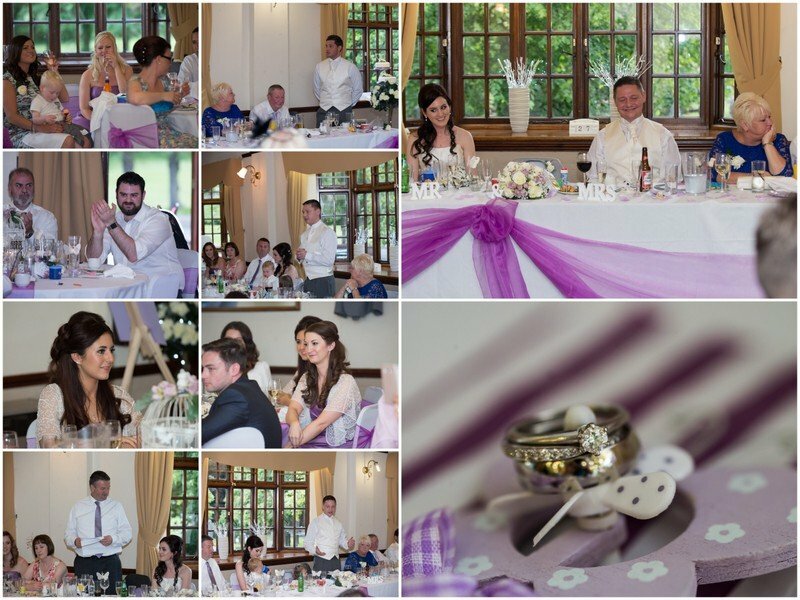 ..these two are just so meant for each other- you can see in these pics..and how gorgeous is Evelyn’s ring! 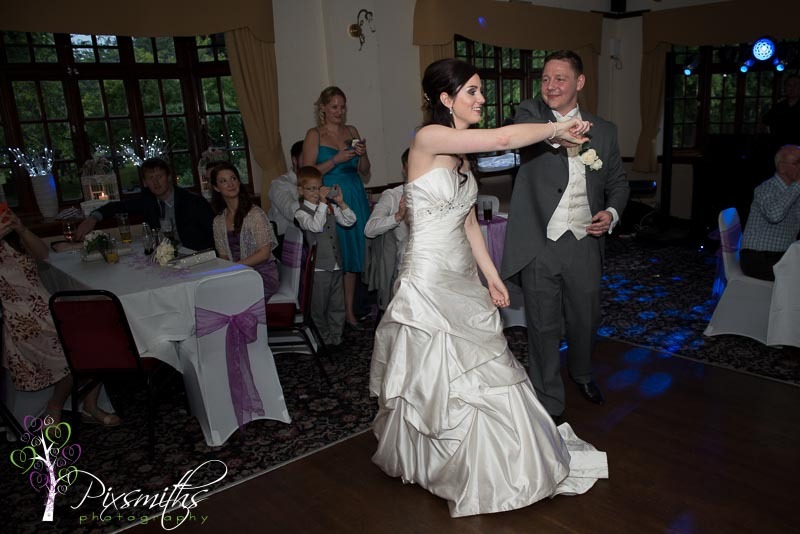 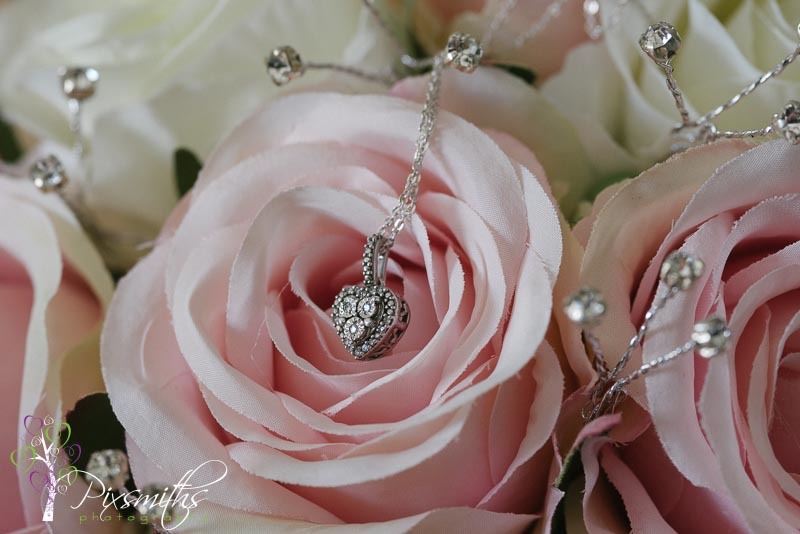 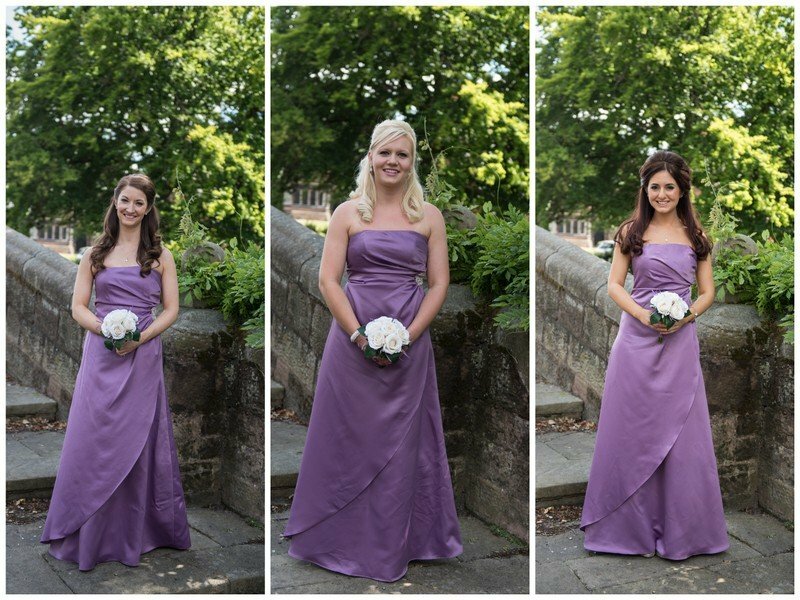 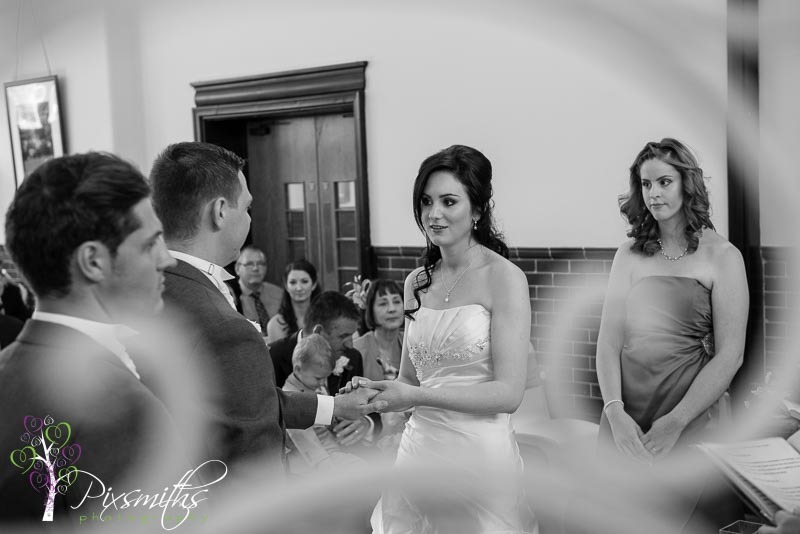 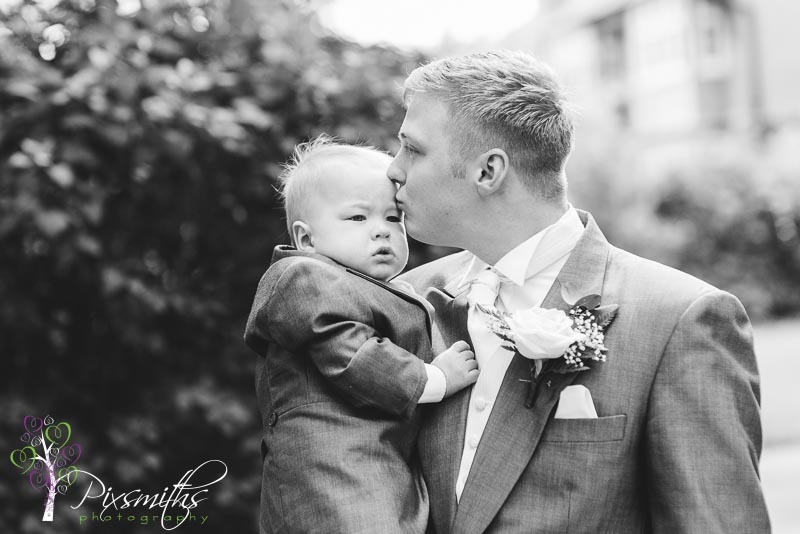 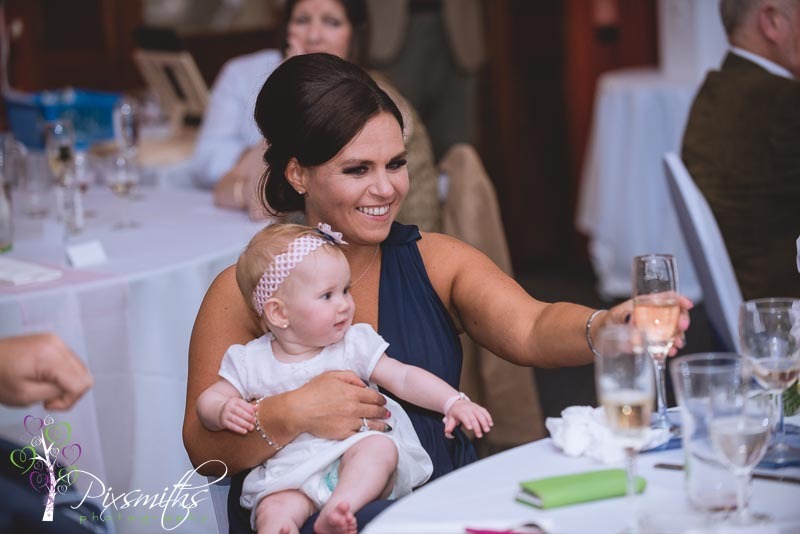 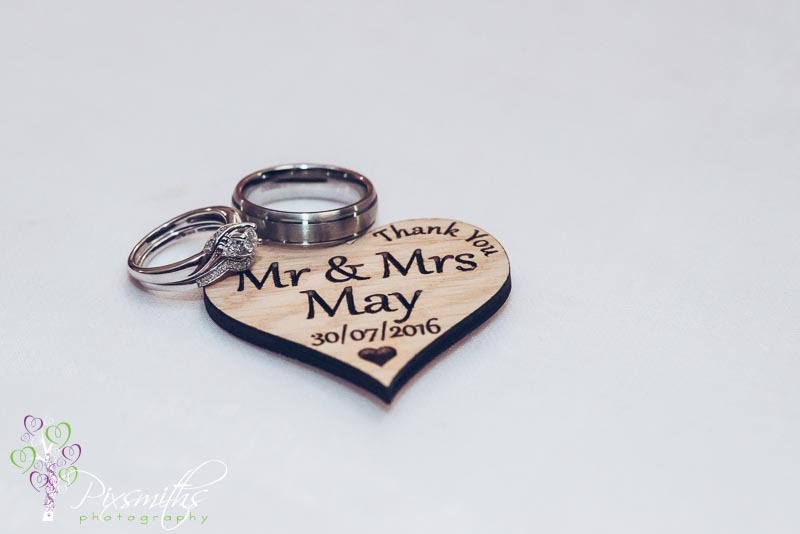 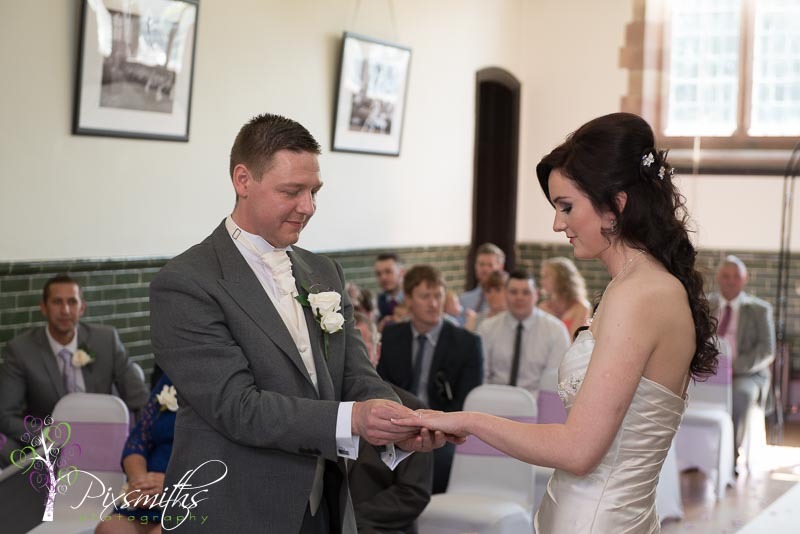 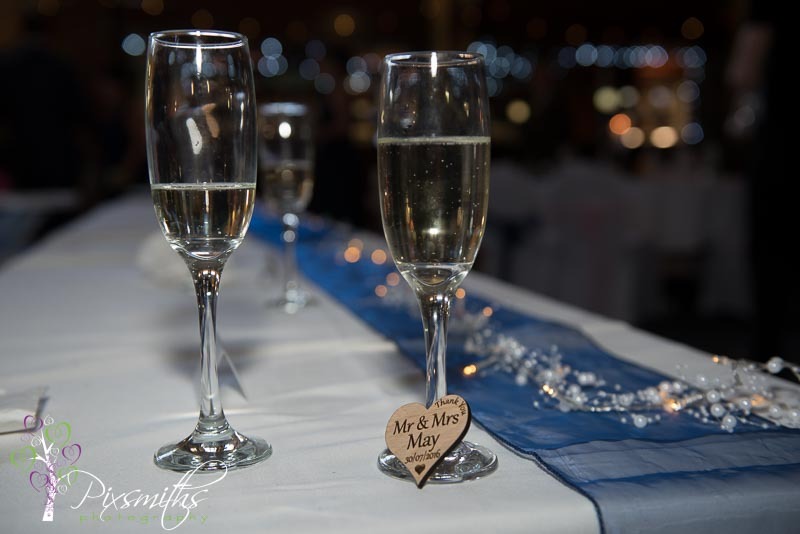 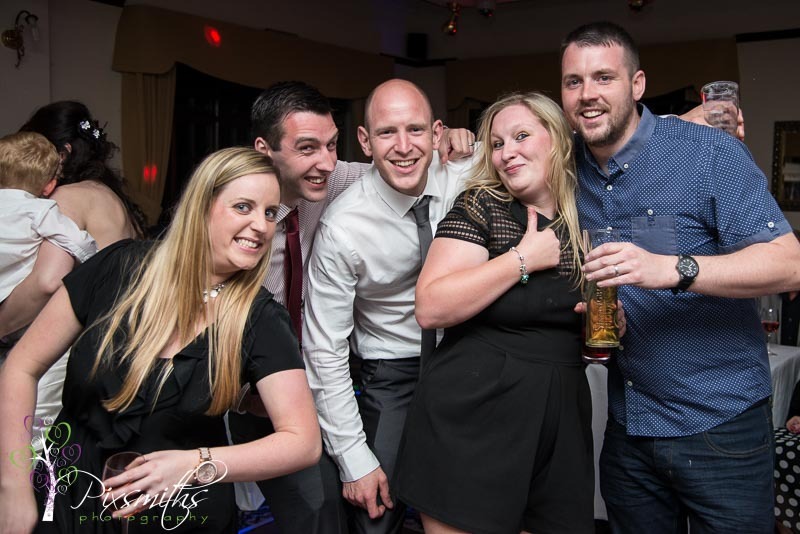 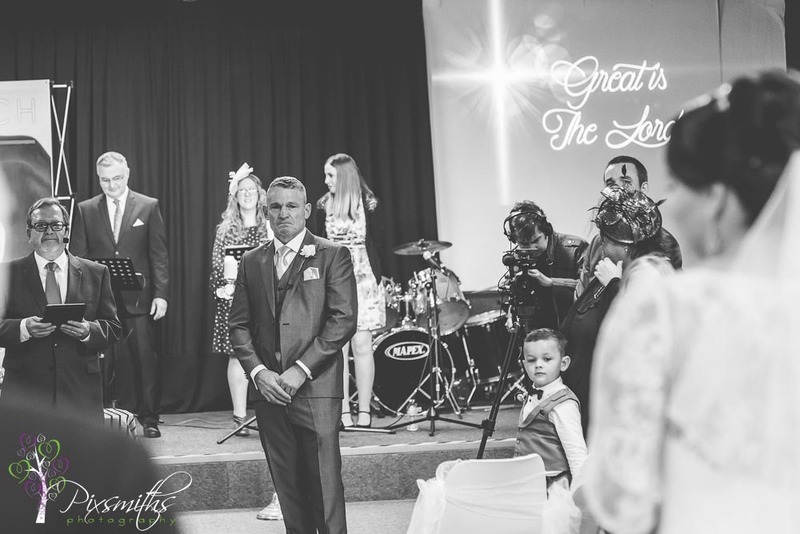 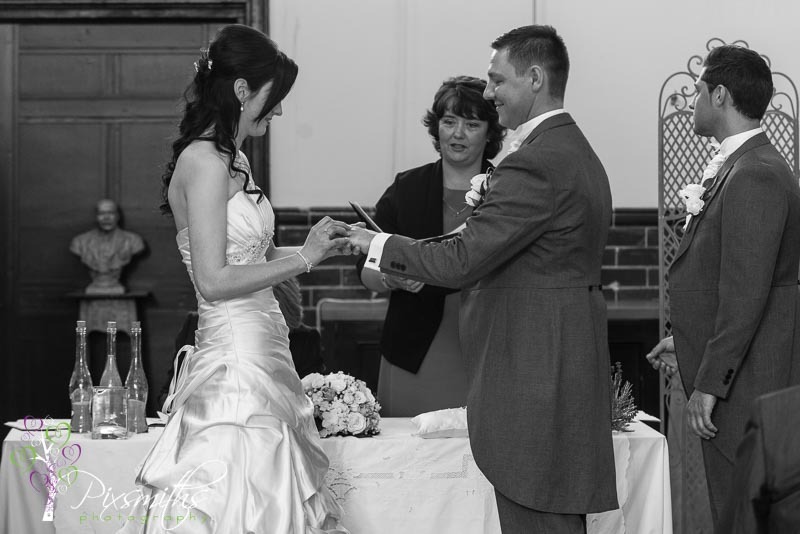 All our engagemt images are provided with the wedding images on our personalised USB. 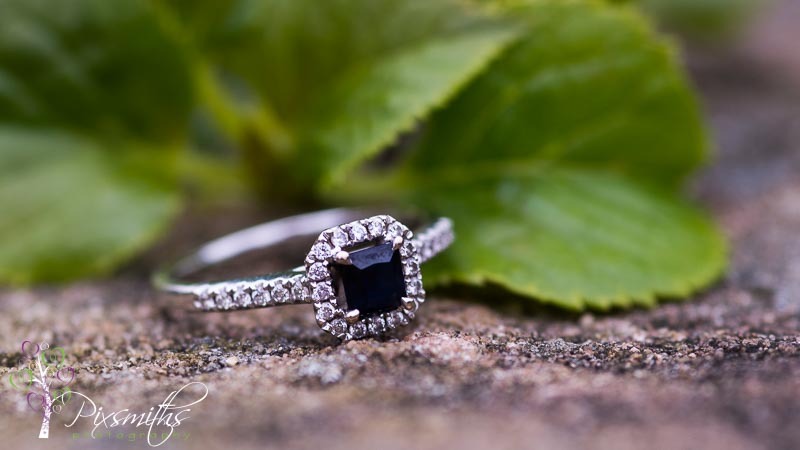 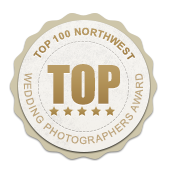 Natural photography is what we do! 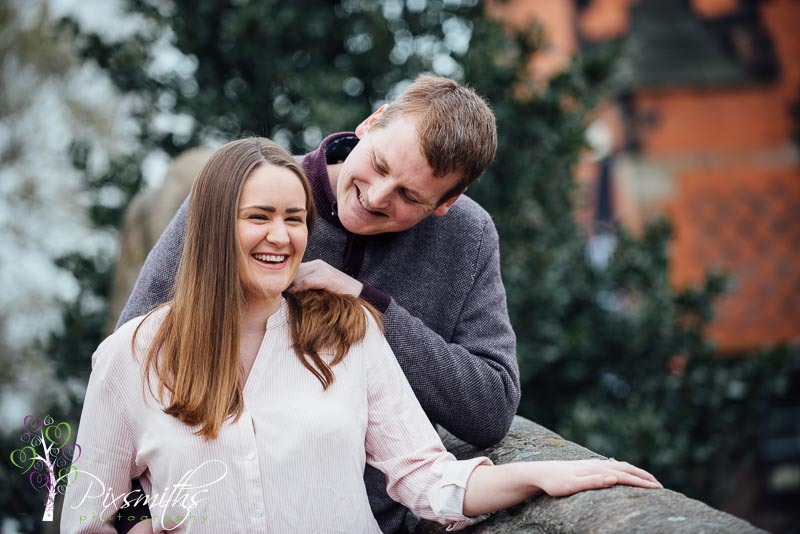 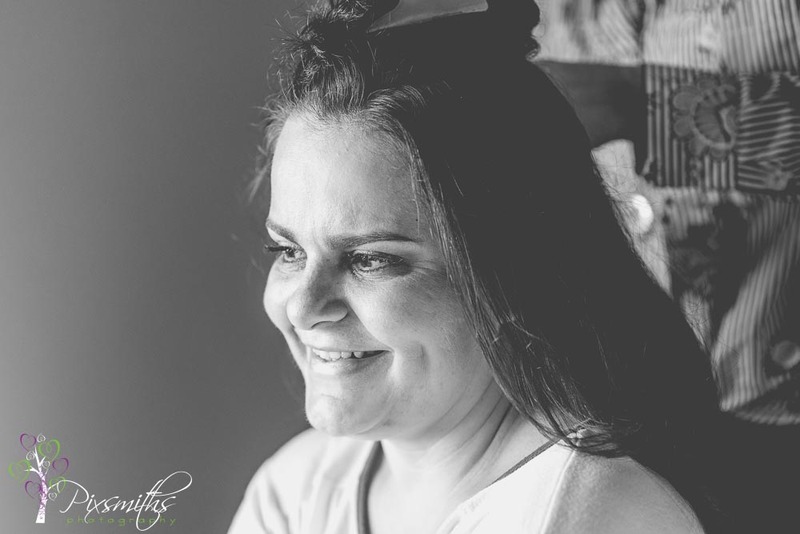 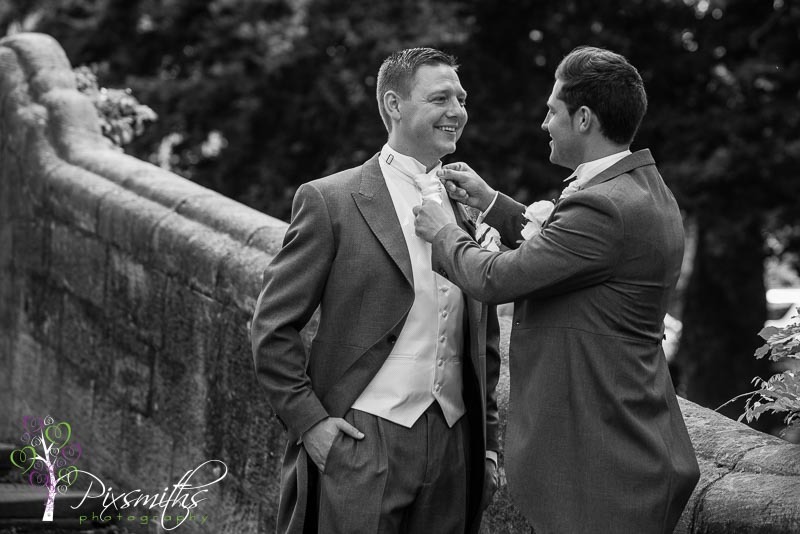 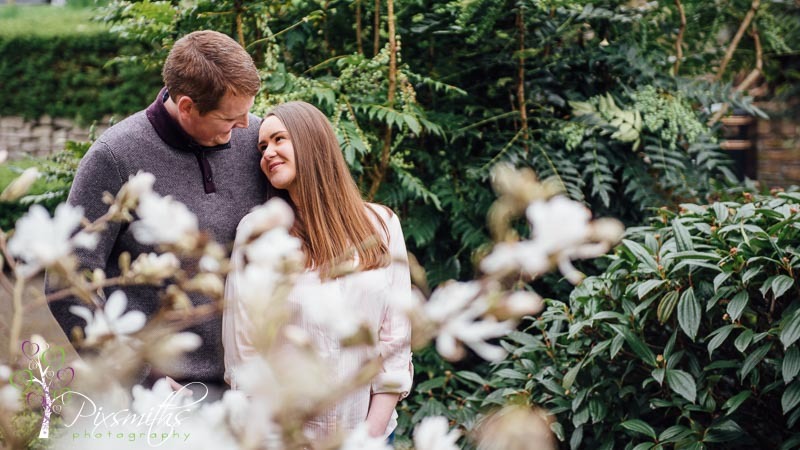 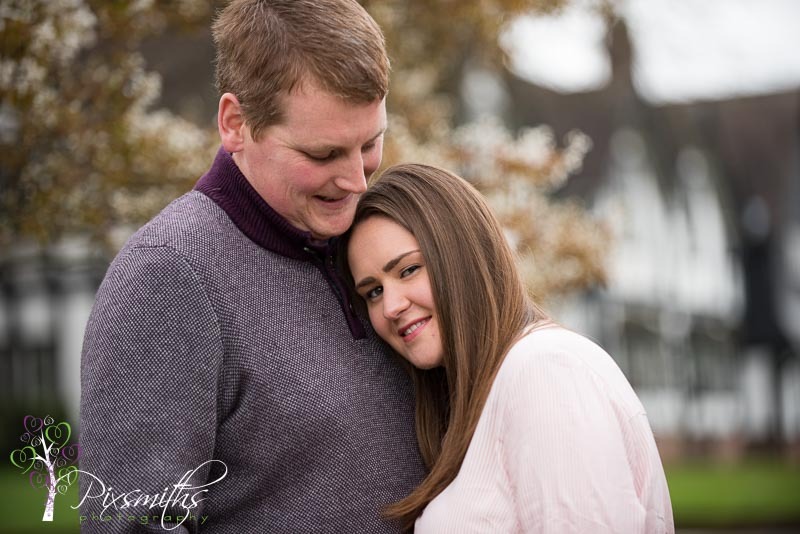 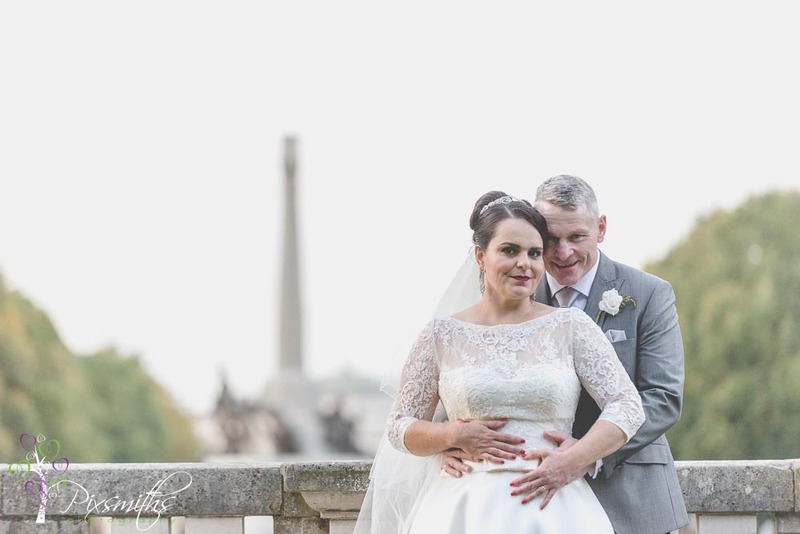 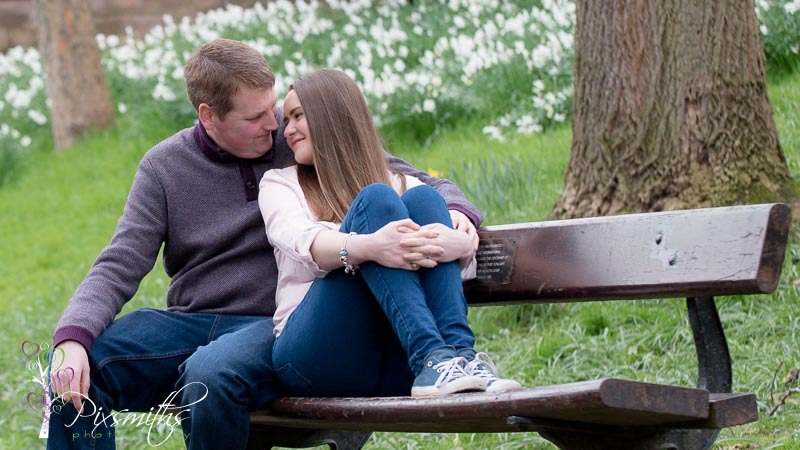 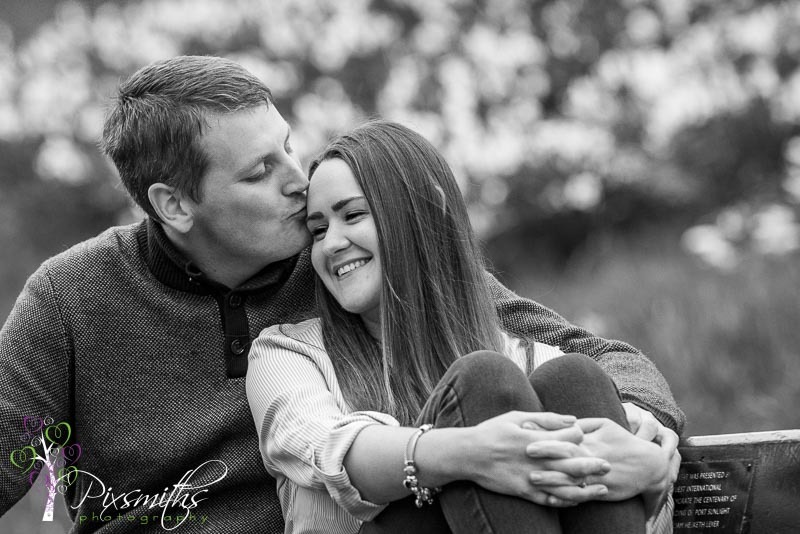 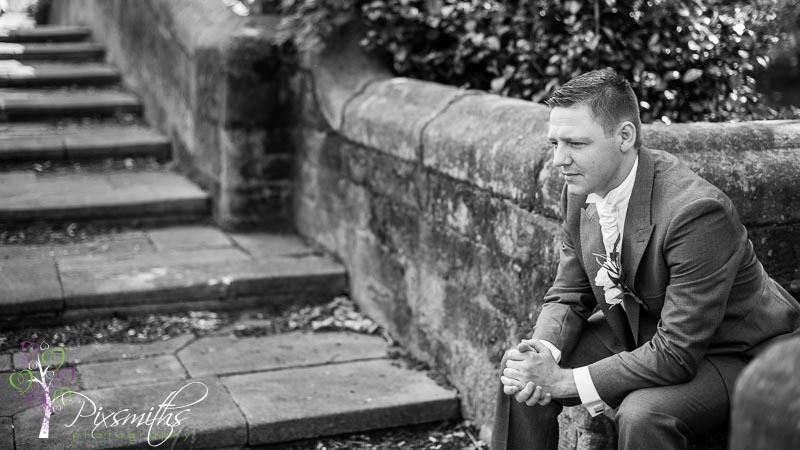 We love to capture the romance and laughter so if this is you you contact us to arrange a session for you. 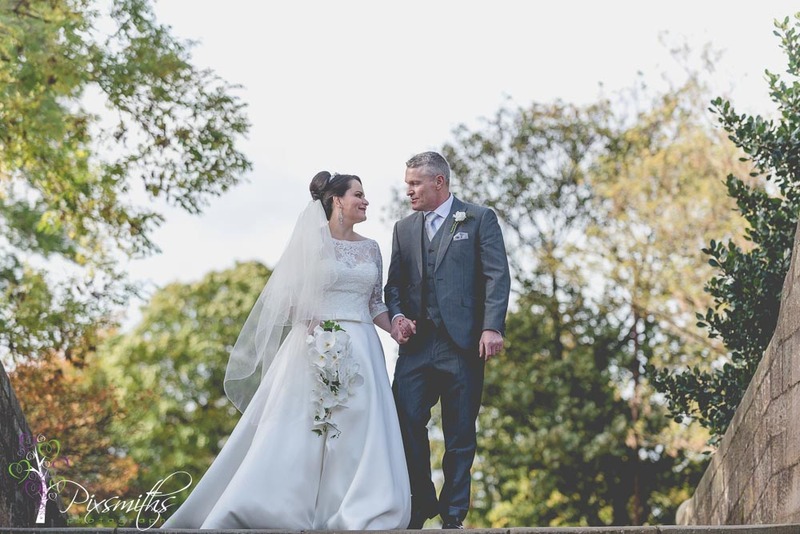 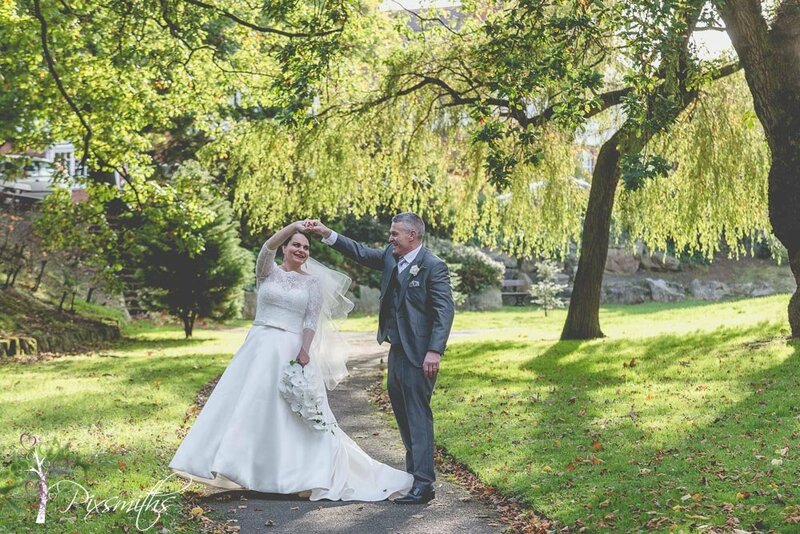 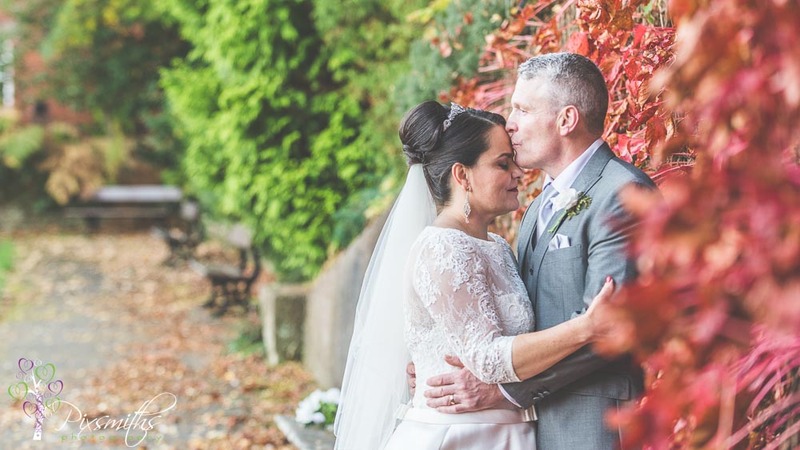 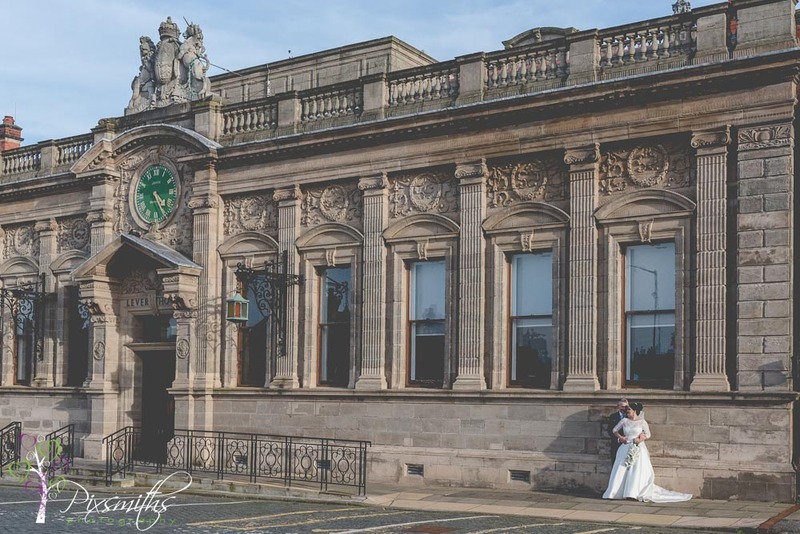 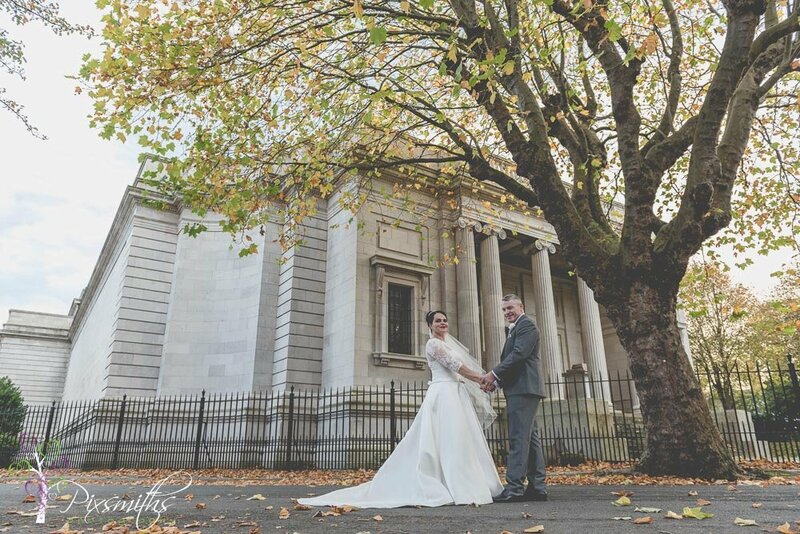 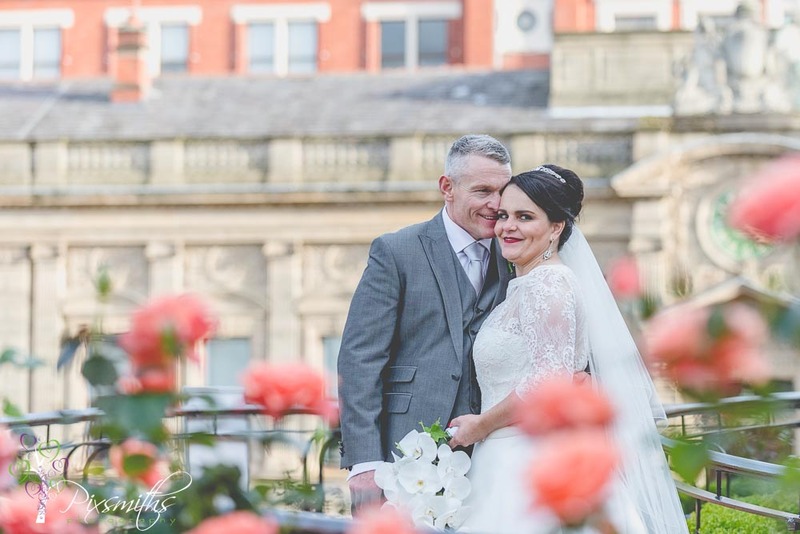 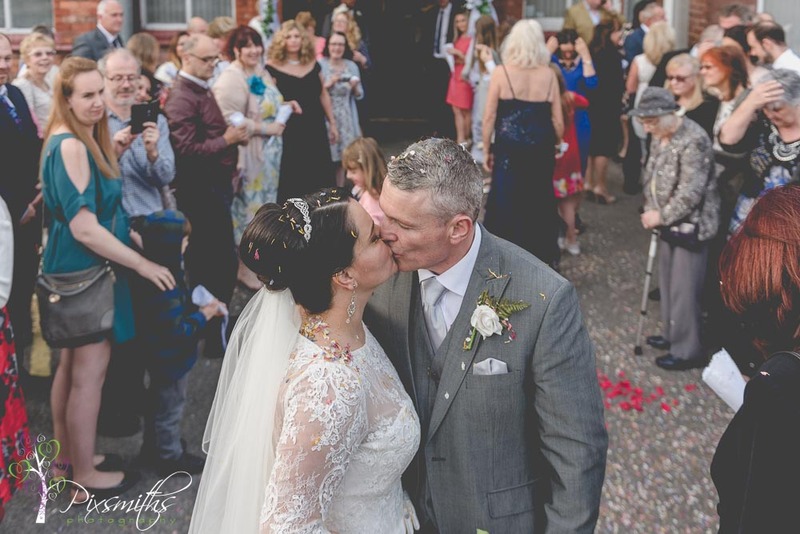 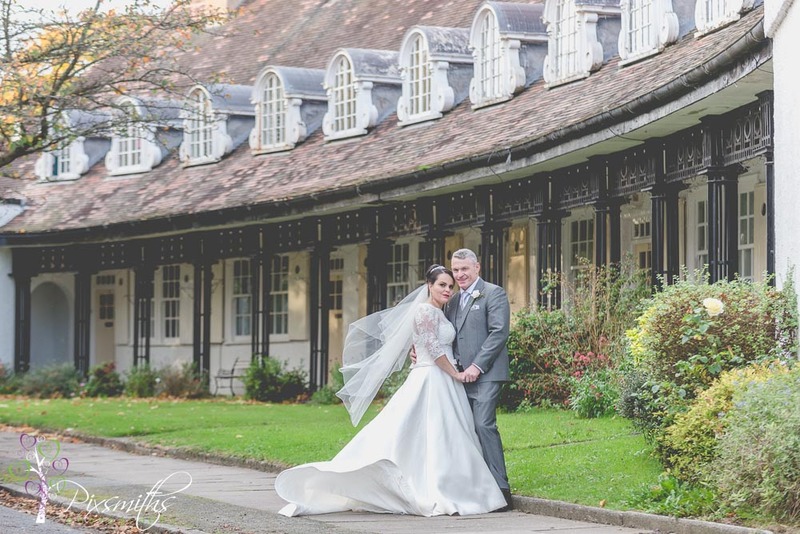 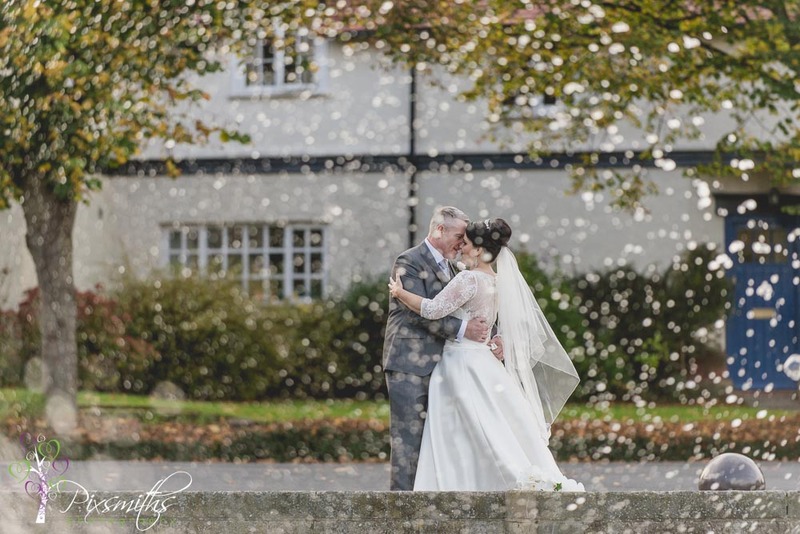 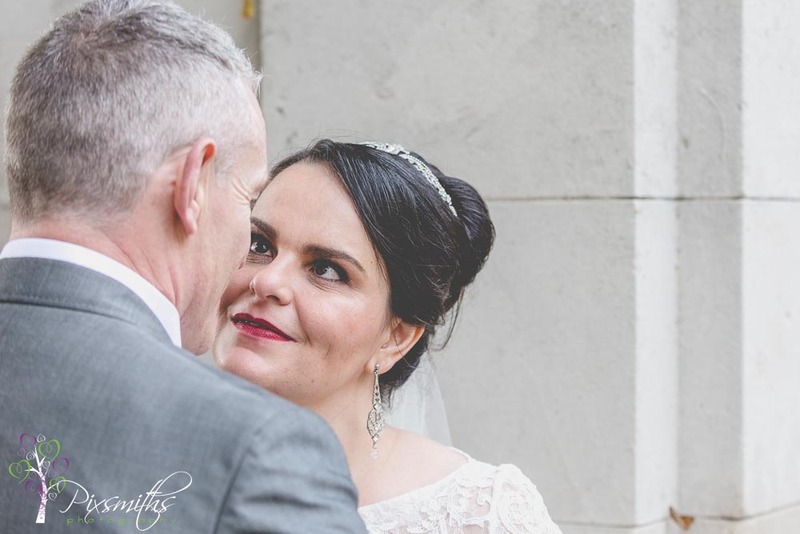 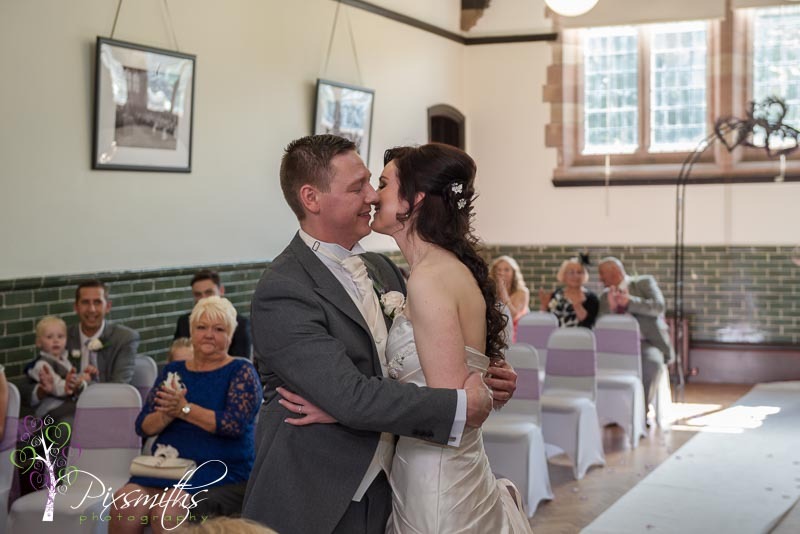 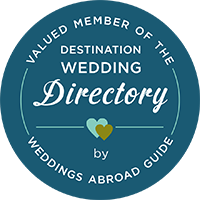 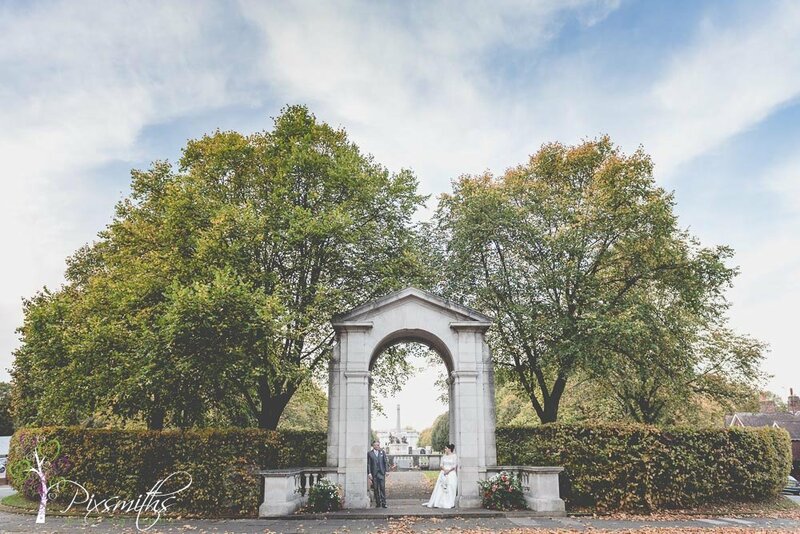 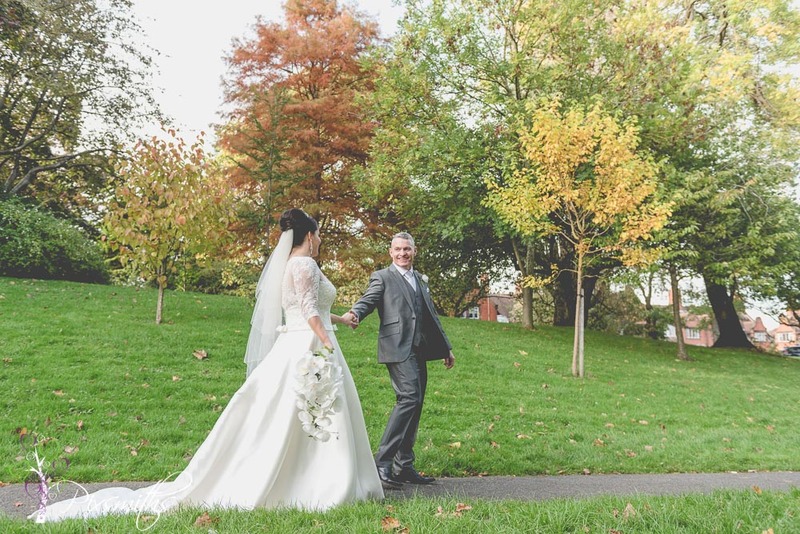 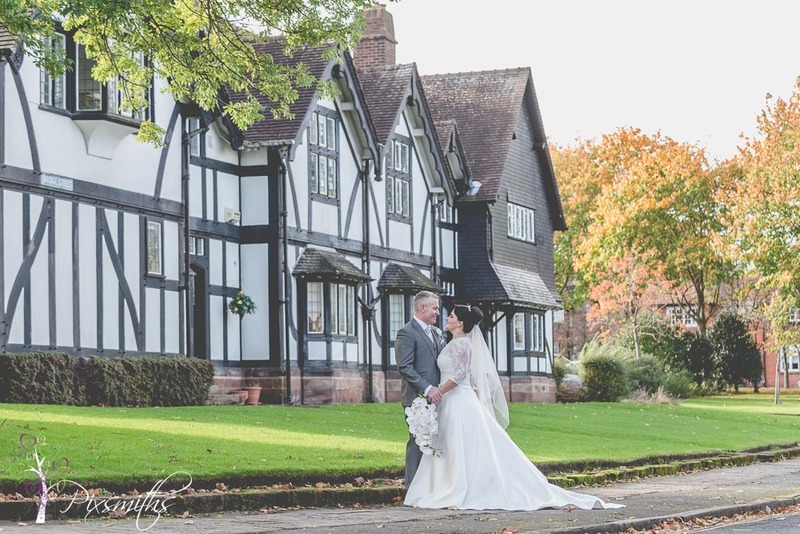 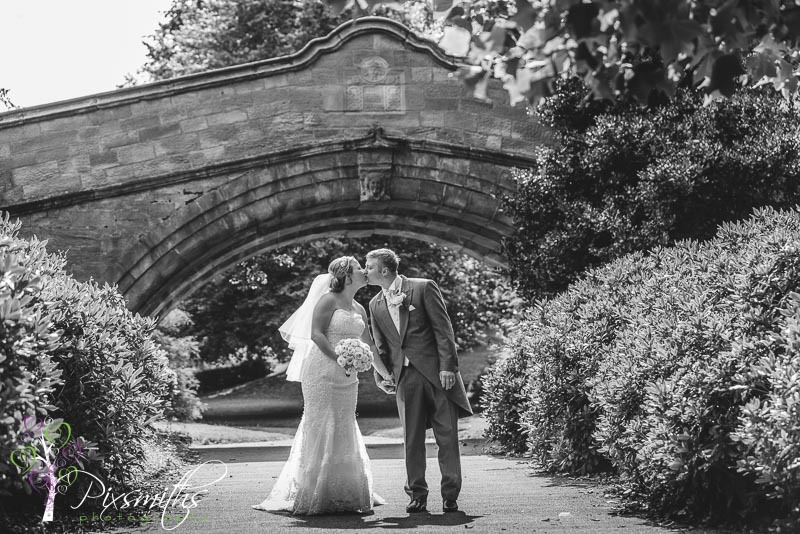 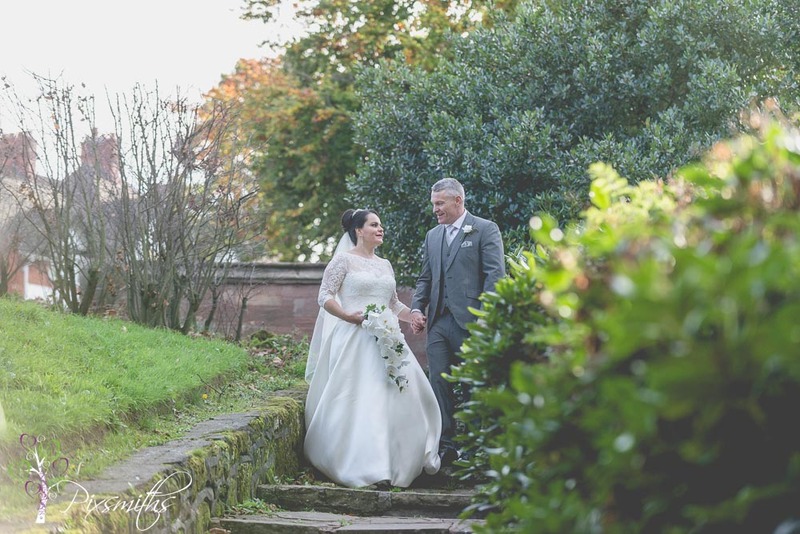 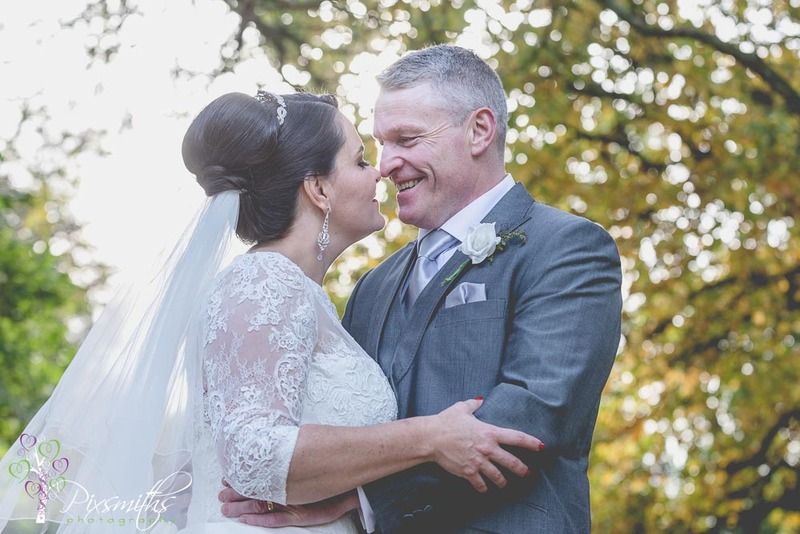 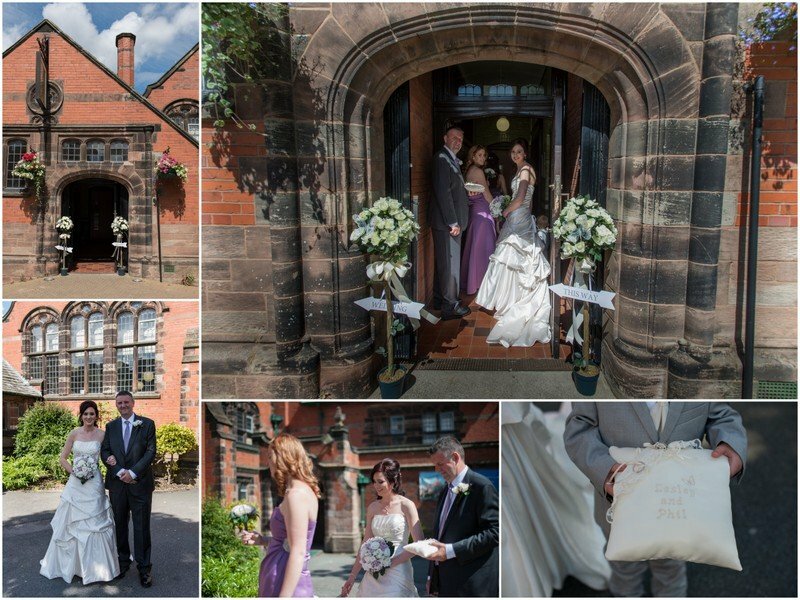 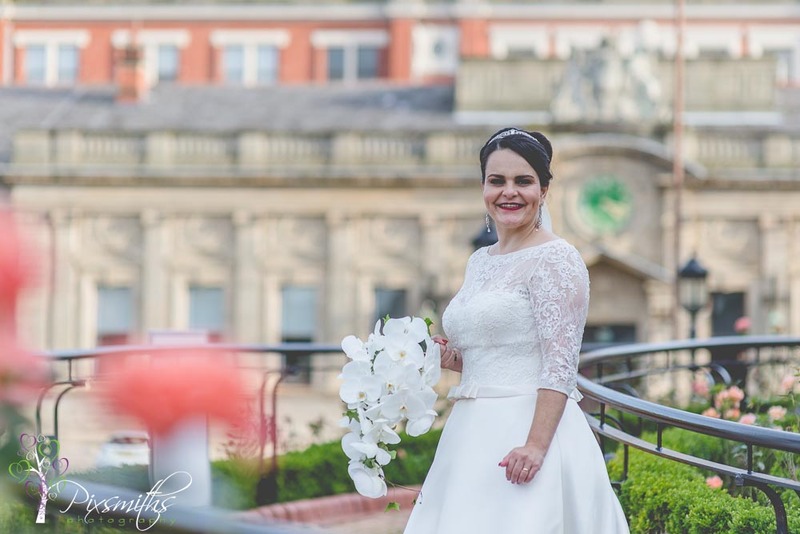 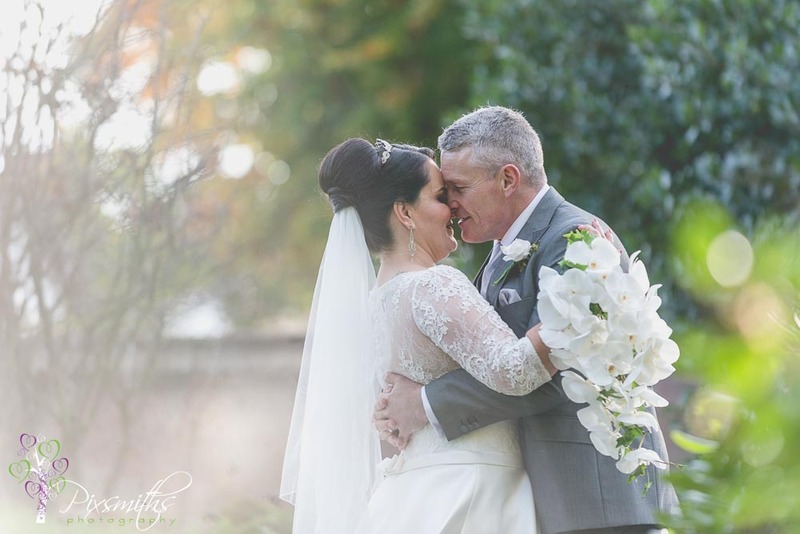 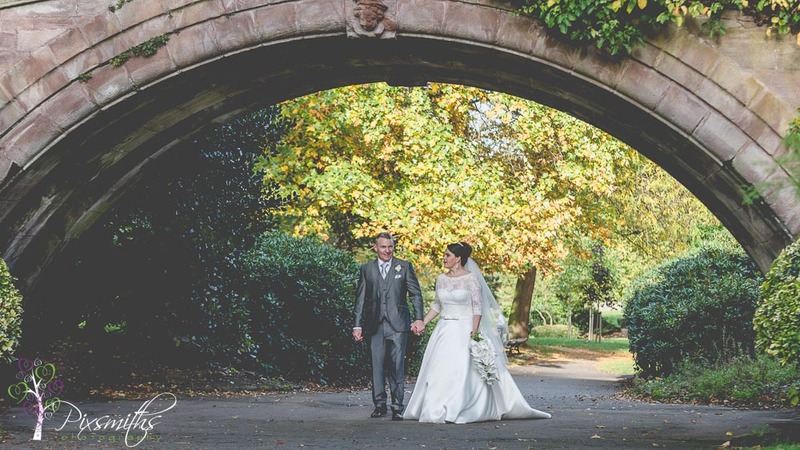 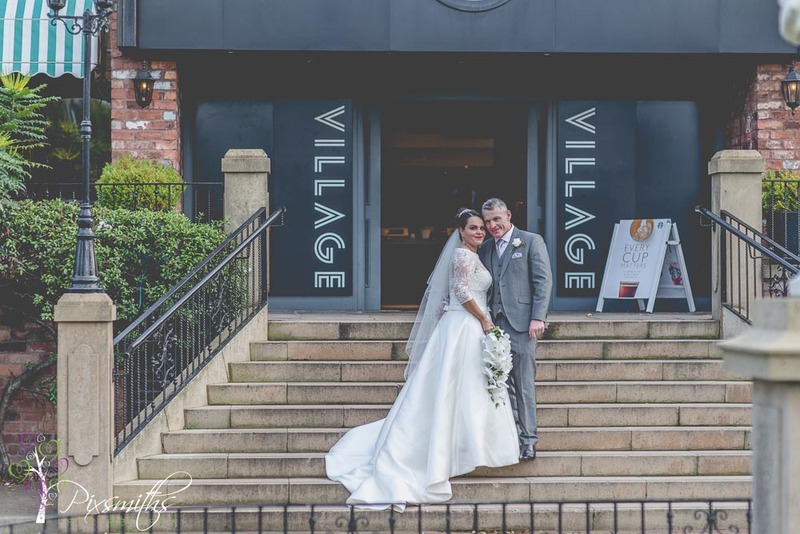 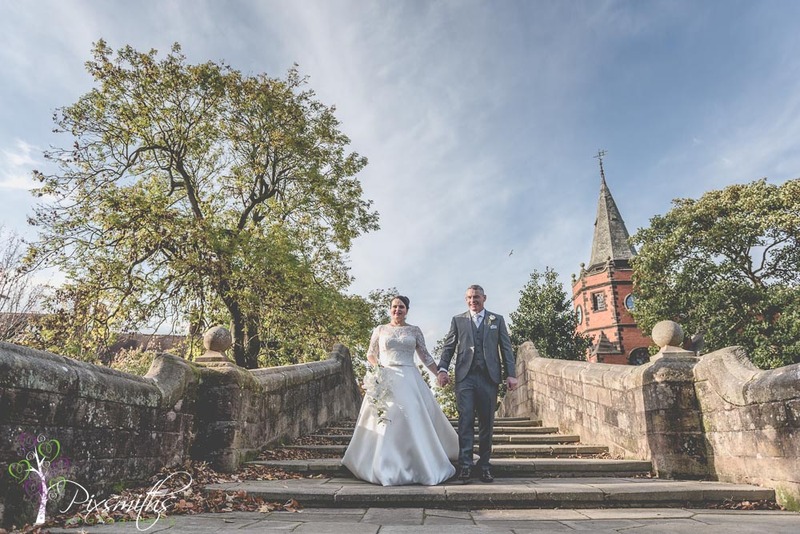 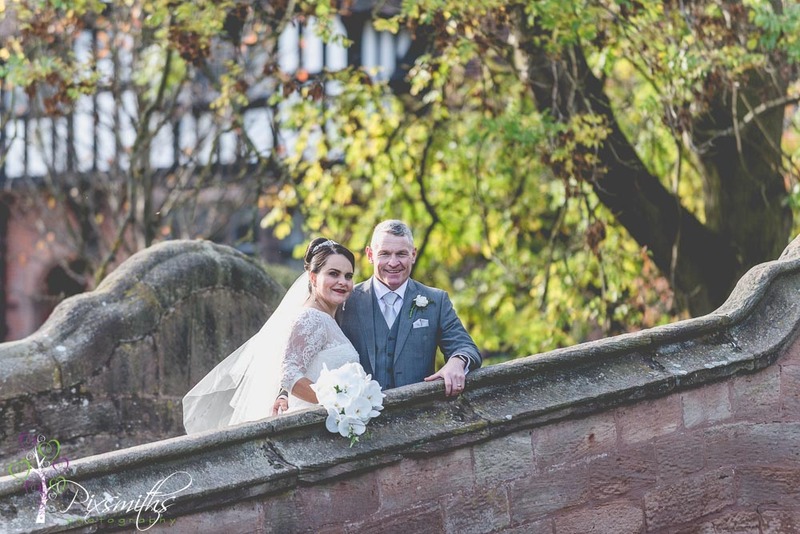 Lesley and Phil’s Port Sunlight wedding was perfectly planned for ease of locations for their guests and the day just flowed. 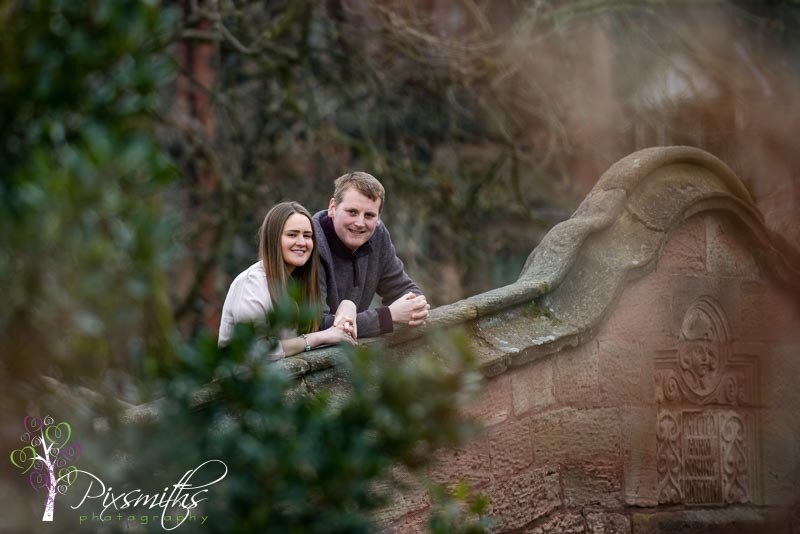 Phil had proposed to Lesley on the sky walk on the Grand Canyon during a holiday there, so romatic and what a setting! 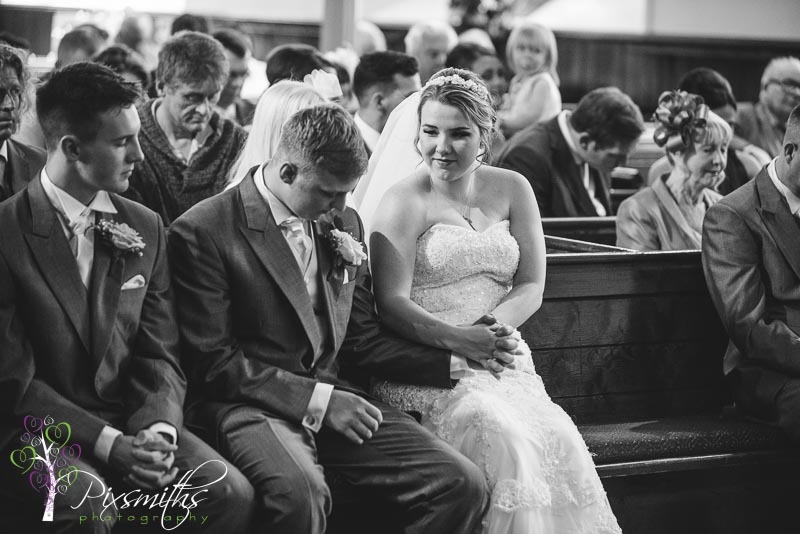 The sun obligingly shone on their wedding day and their own joy was evident, radiant smiles on their faces. 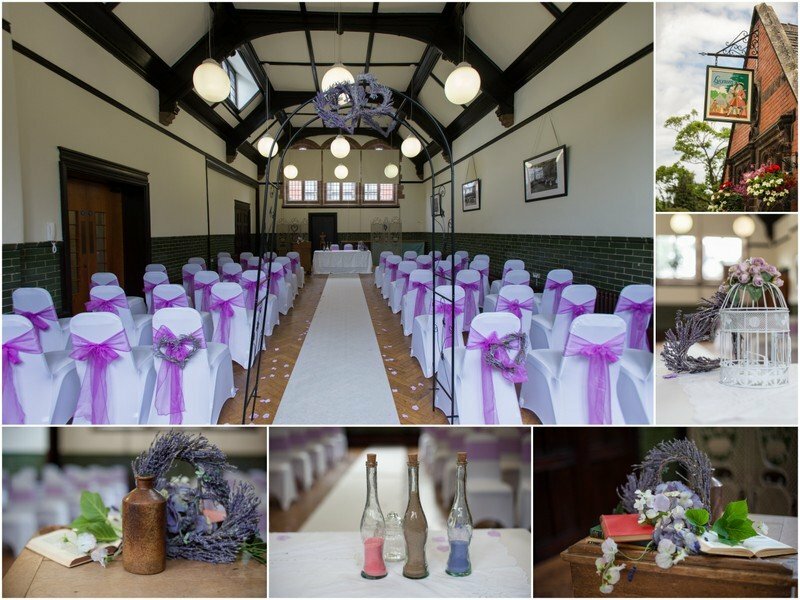 A ceremony in the old schoolhouse, pretiily decorated themselves the night before with their purple, lavendar and butterfly motifs. 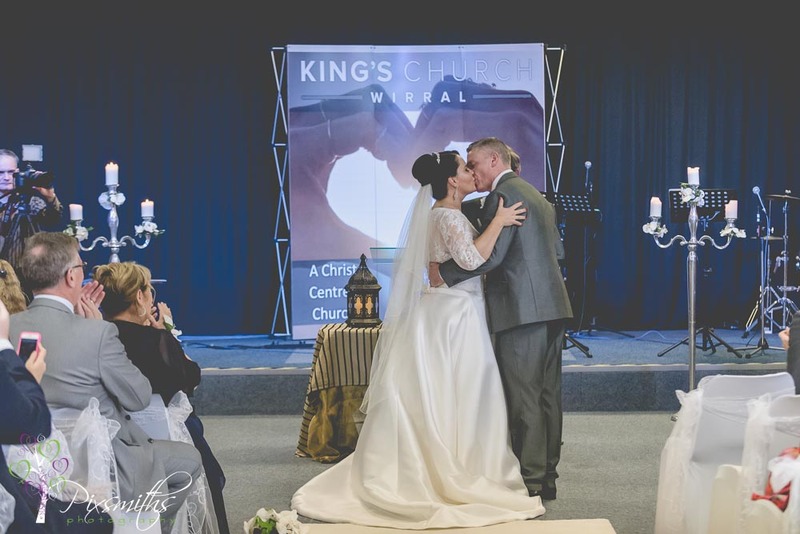 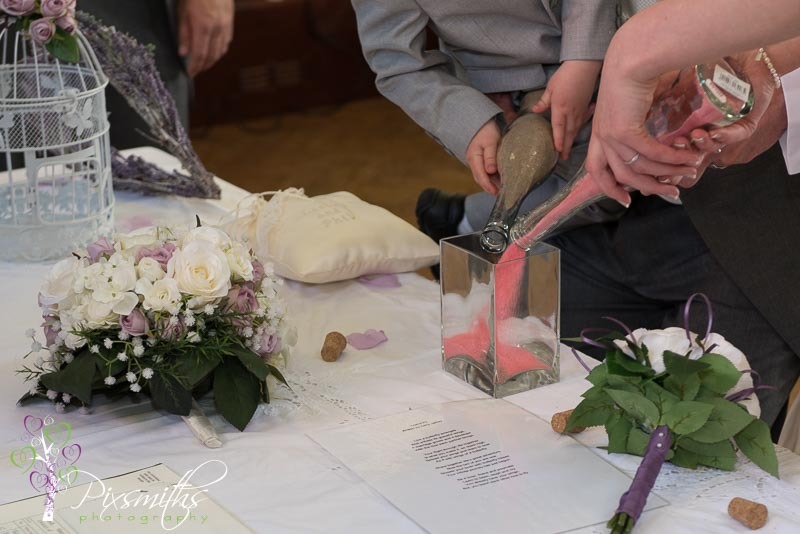 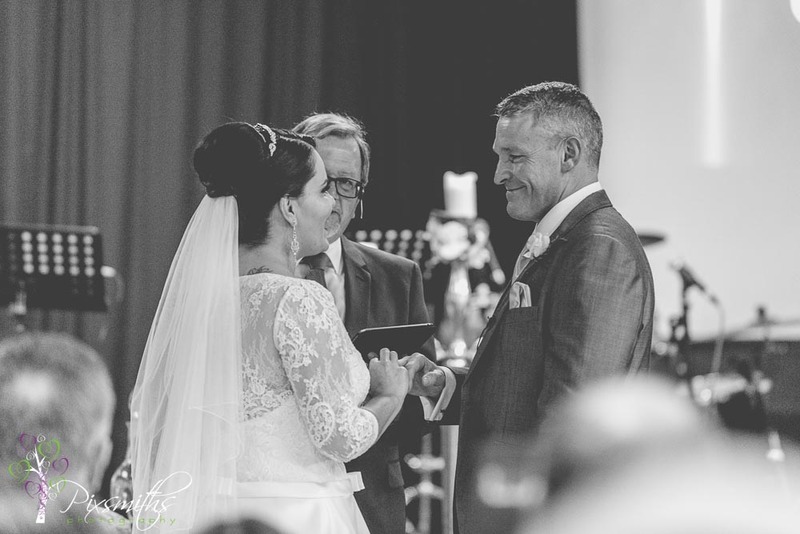 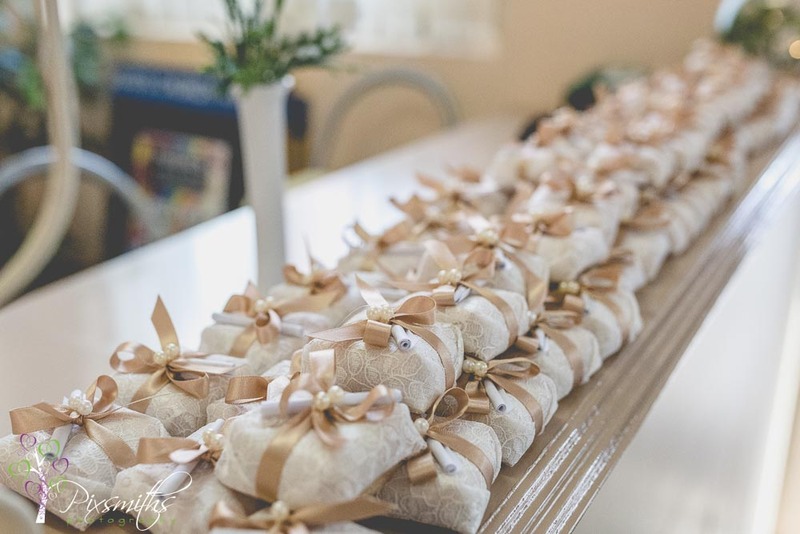 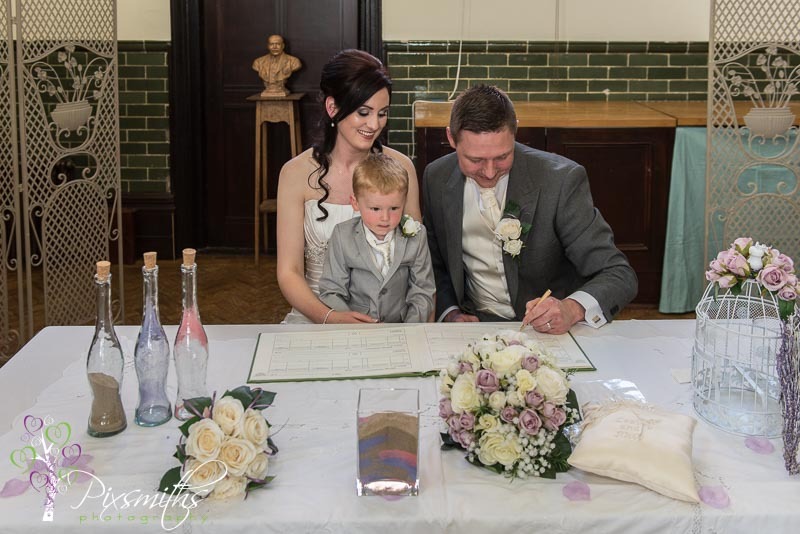 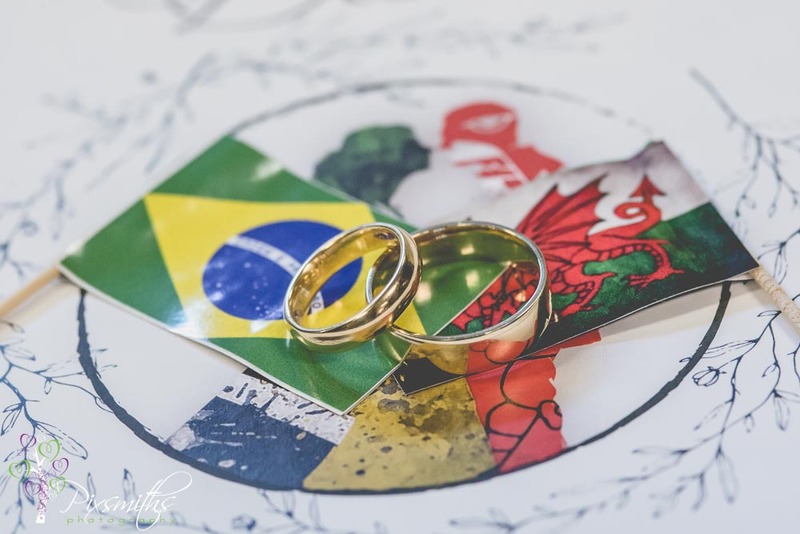 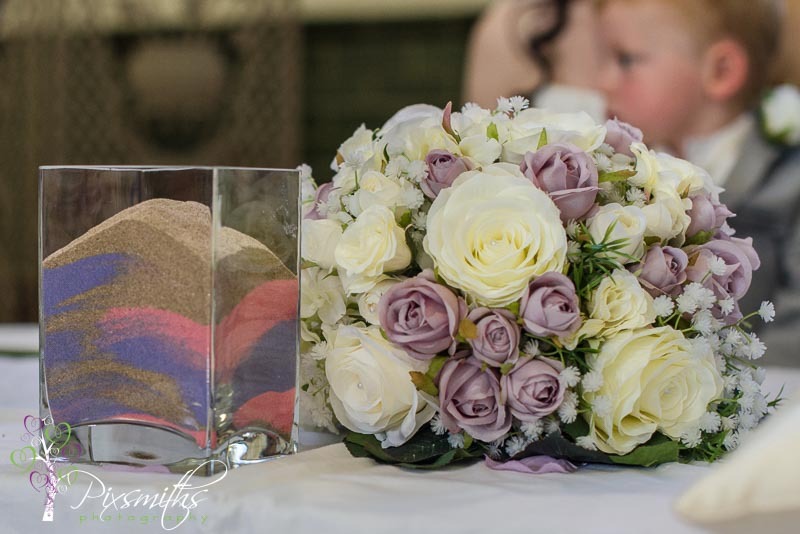 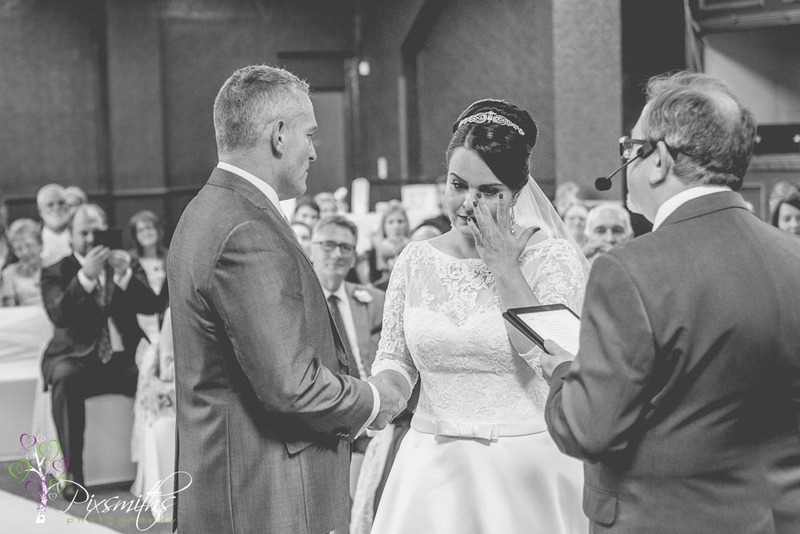 A touching sand ceremony after the vows was made with their young son, adeptly mixing the three coloured sands together as one – forming a beautiful momento of their day. 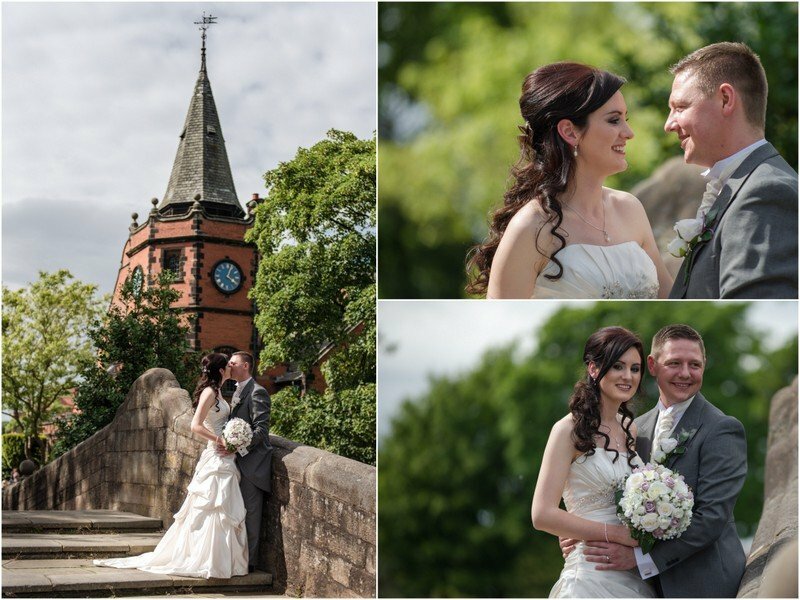 A drinks reception whilst Lesley and Phil had a few pictures taken on the bridge at the ever popular Dell. 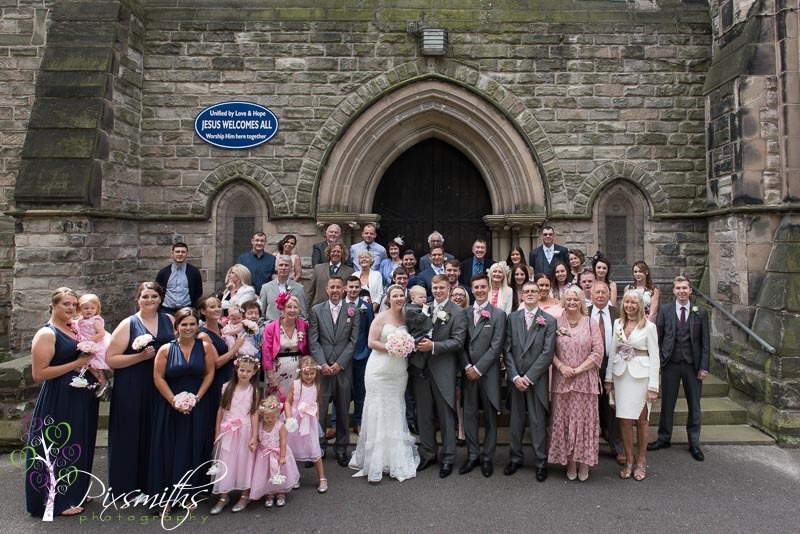 The guests then followed down to the end of the dell for the group pics. 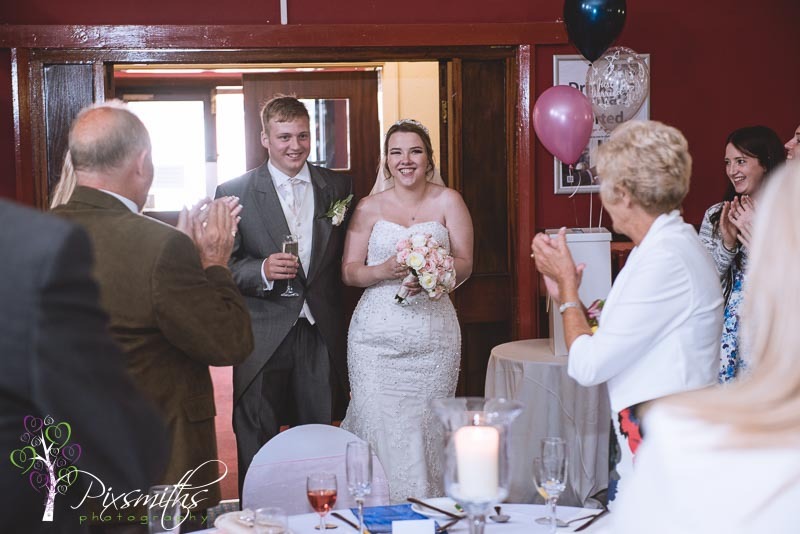 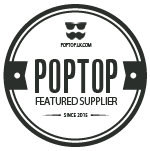 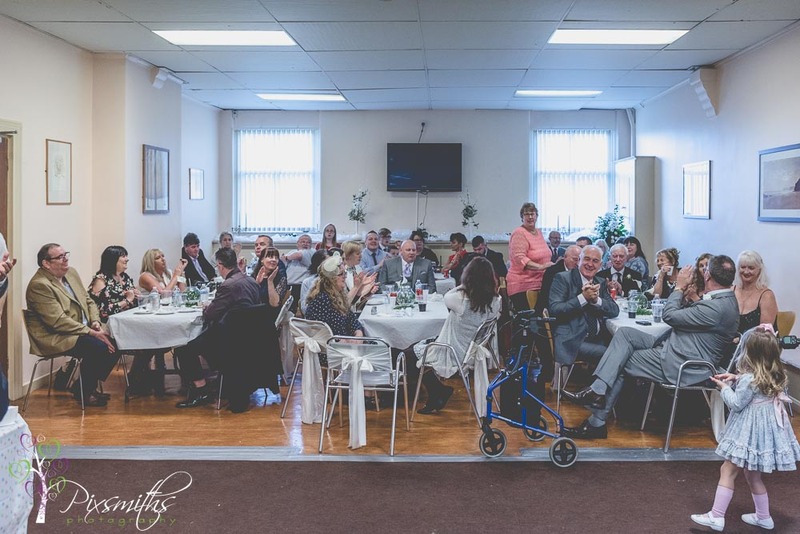 With the weather being so kind guests could opt to carry on walking to the nearby Bridge Inn for a tasty reception in their function room. 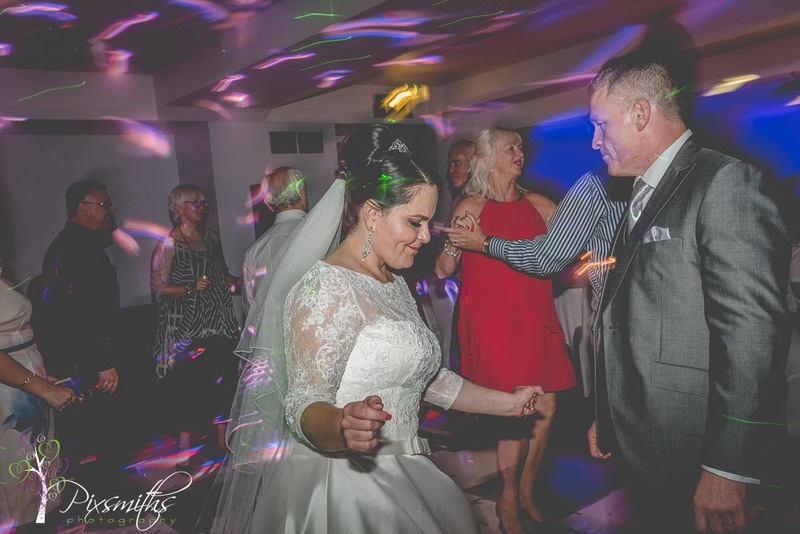 Well actually Lesley and Phil danced their way down the road! 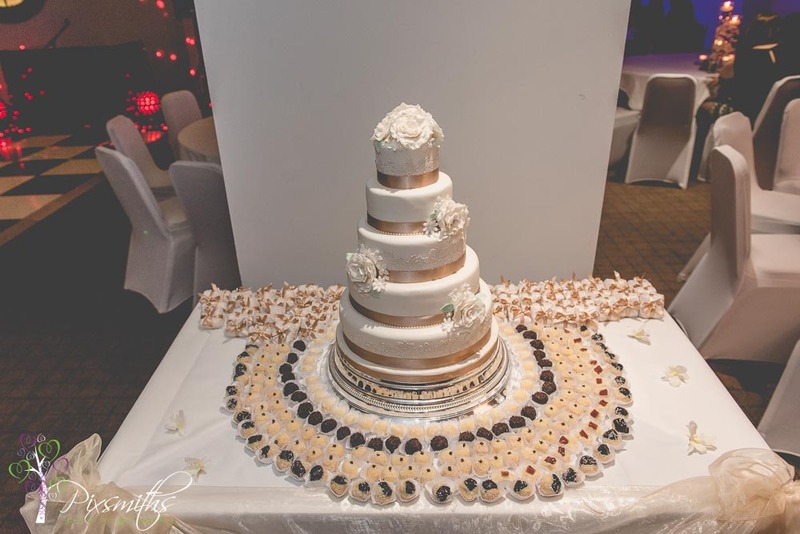 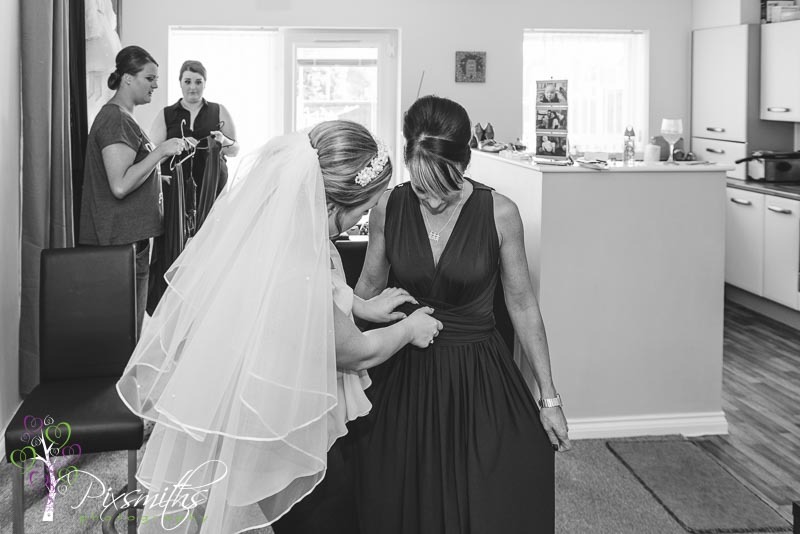 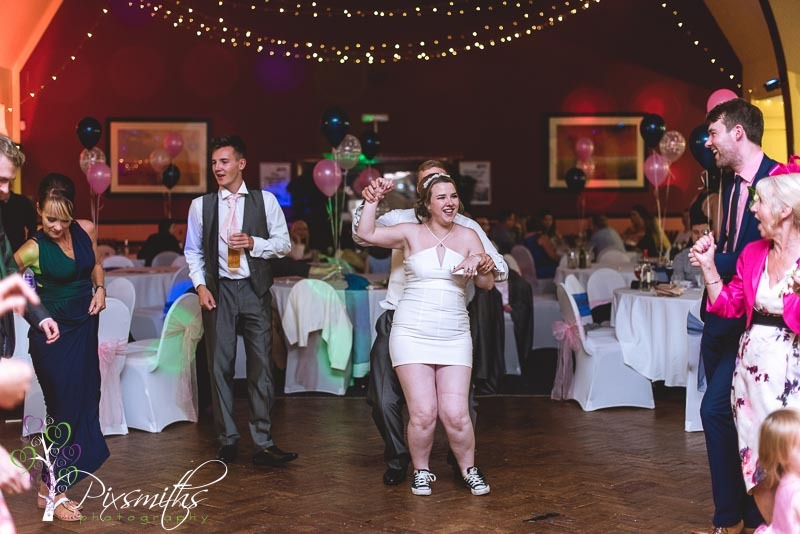 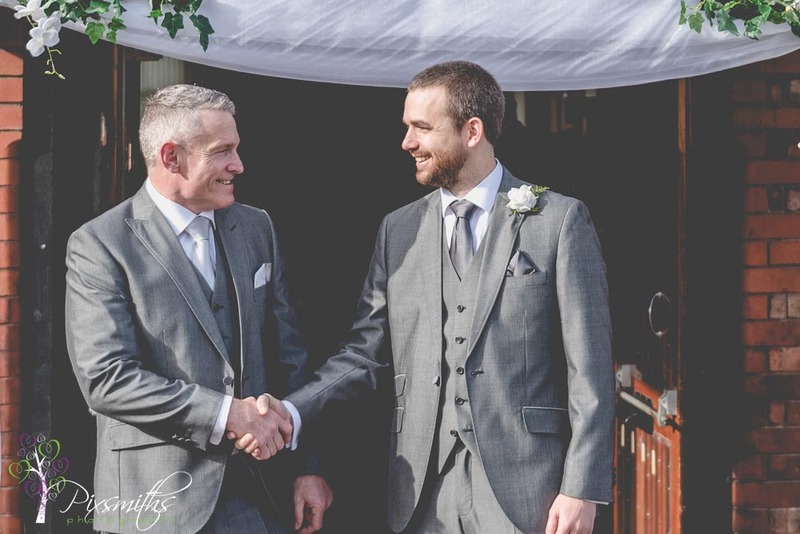 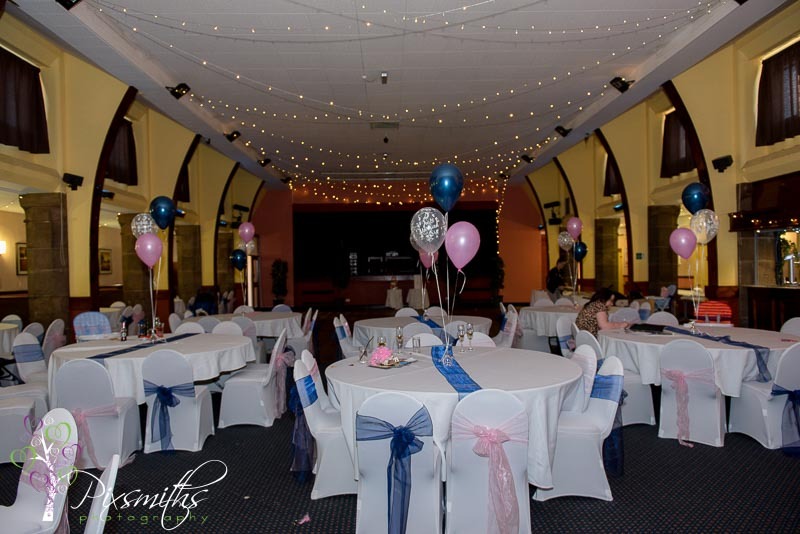 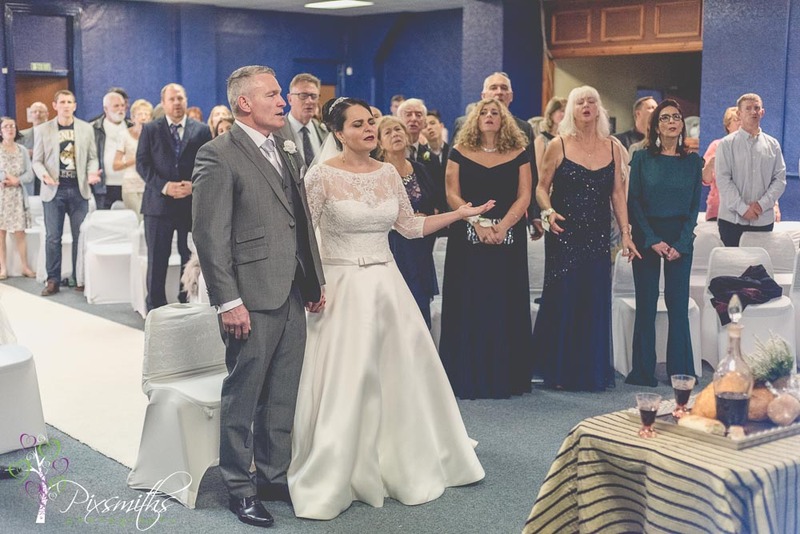 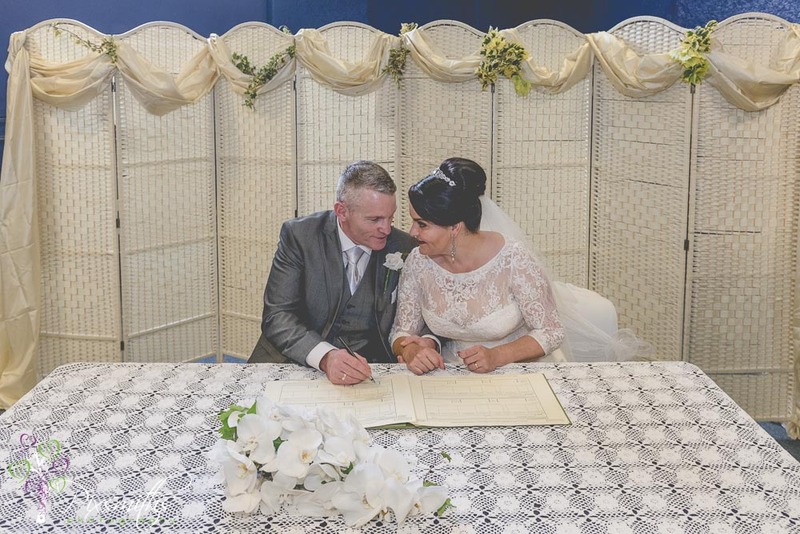 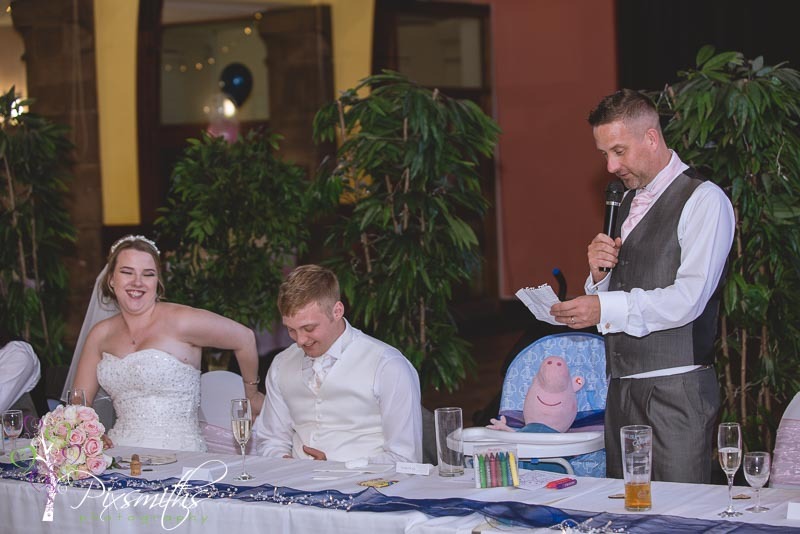 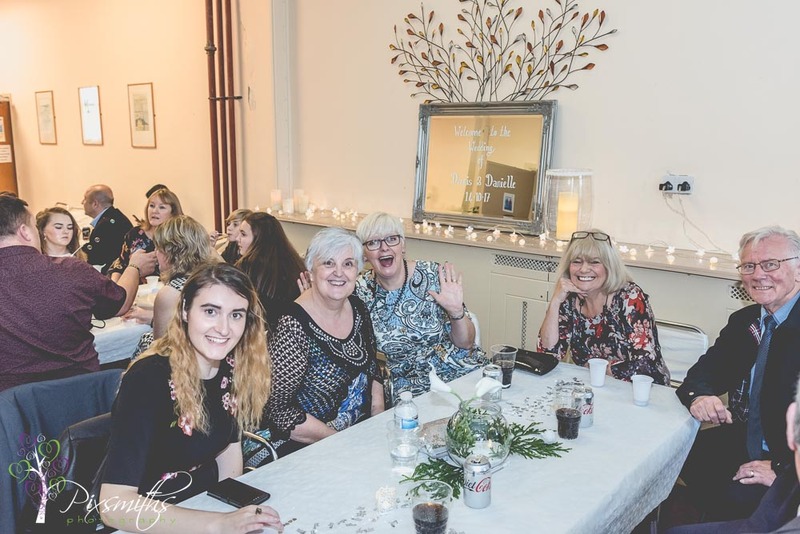 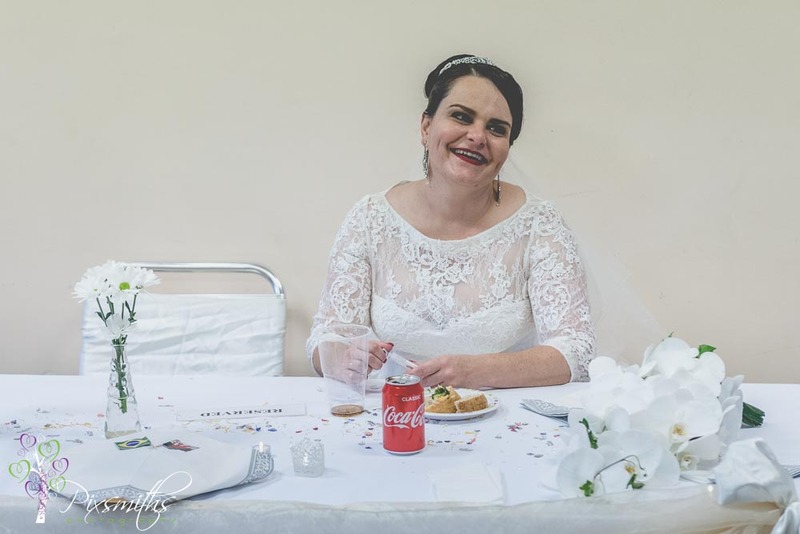 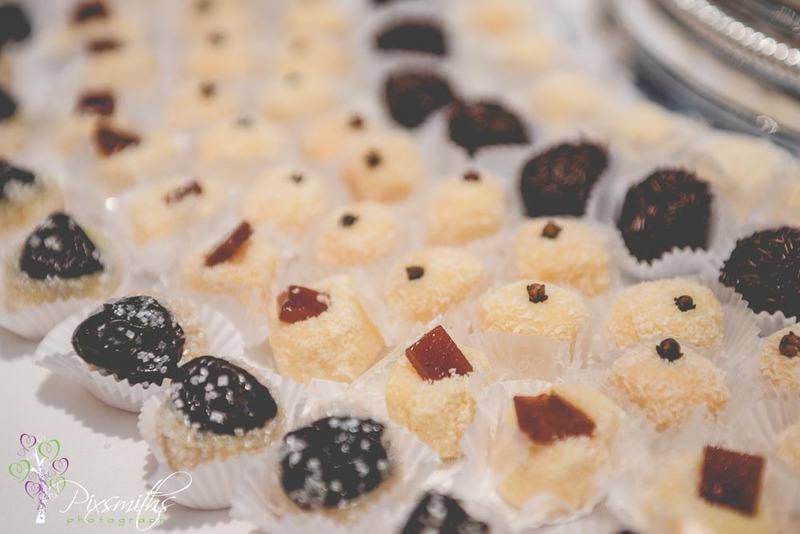 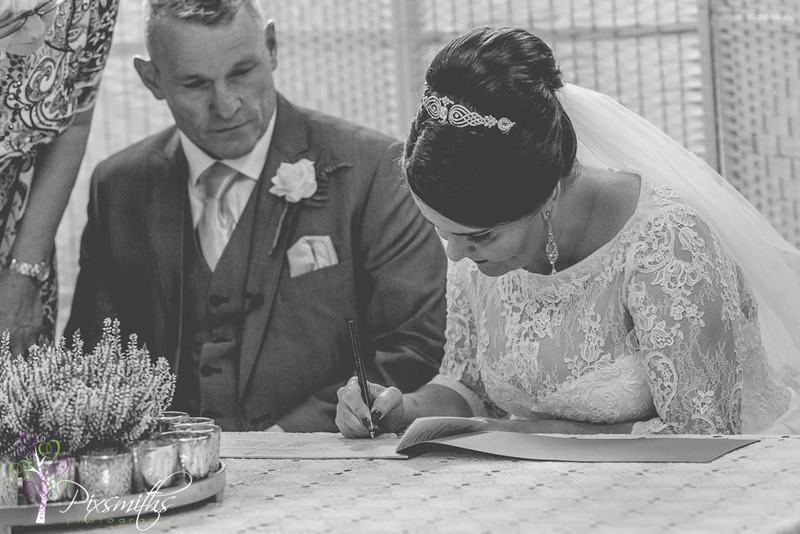 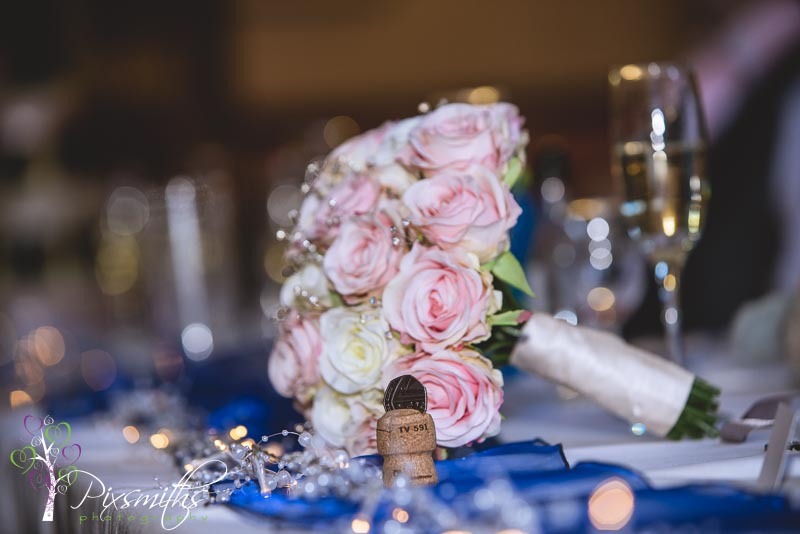 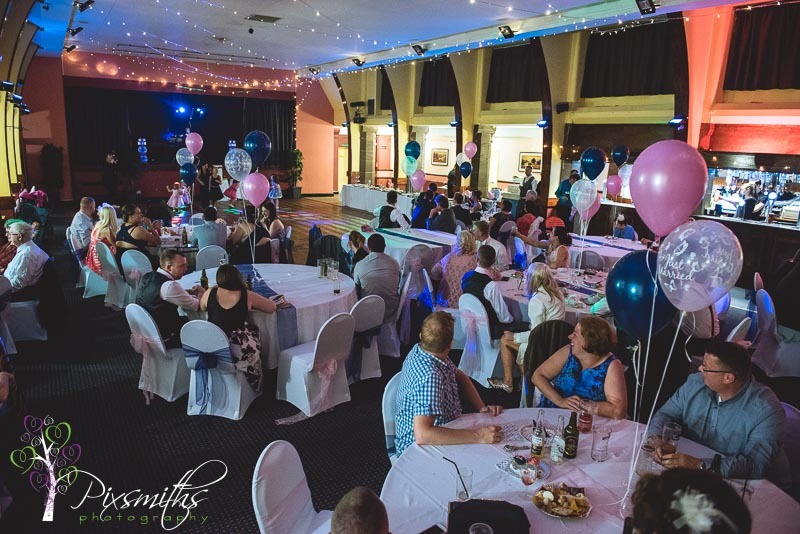 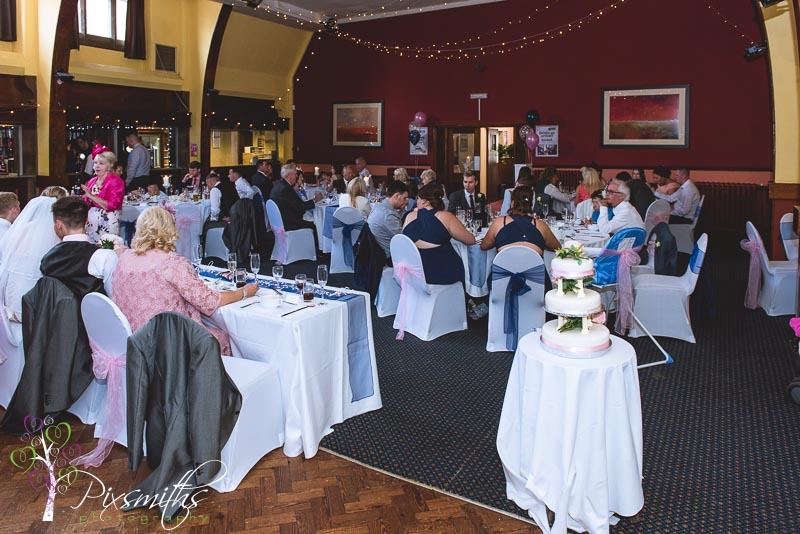 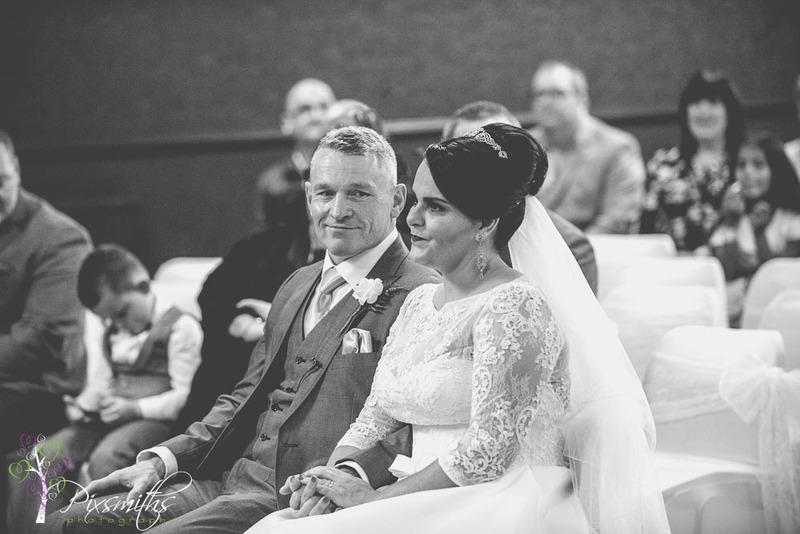 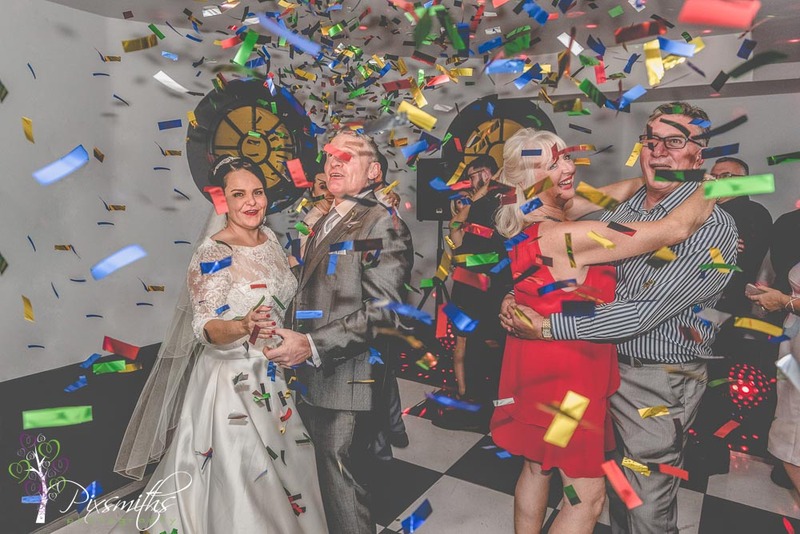 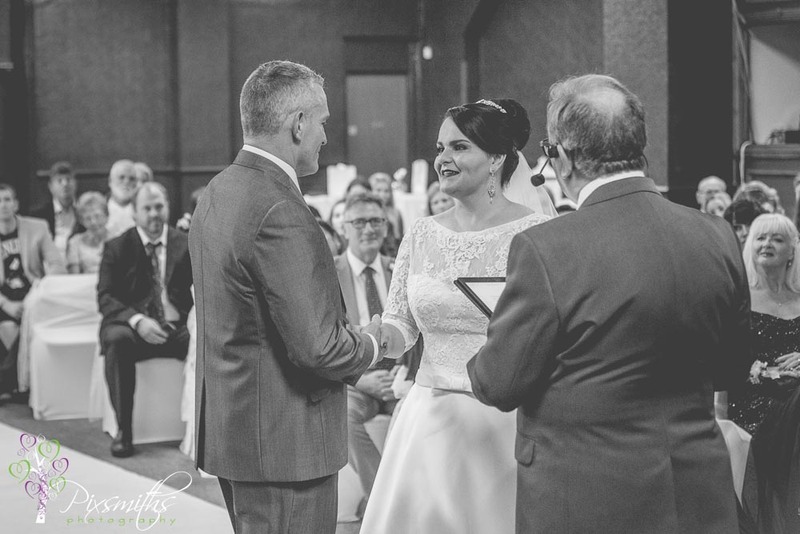 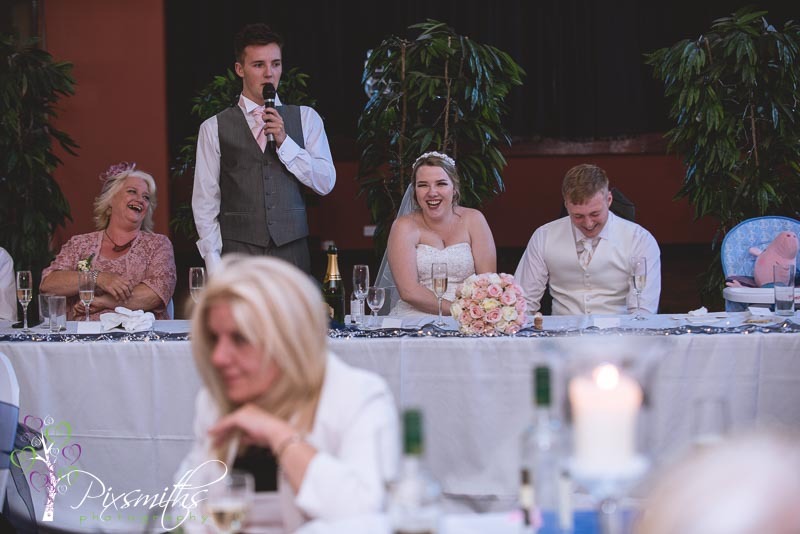 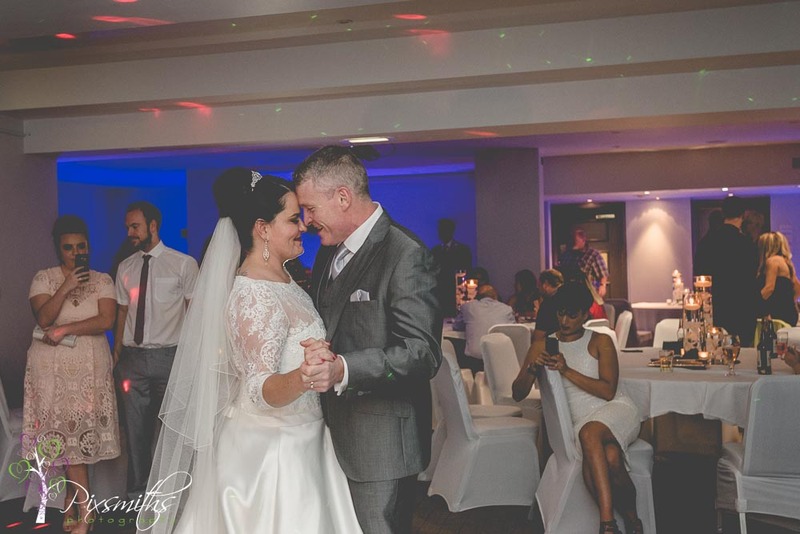 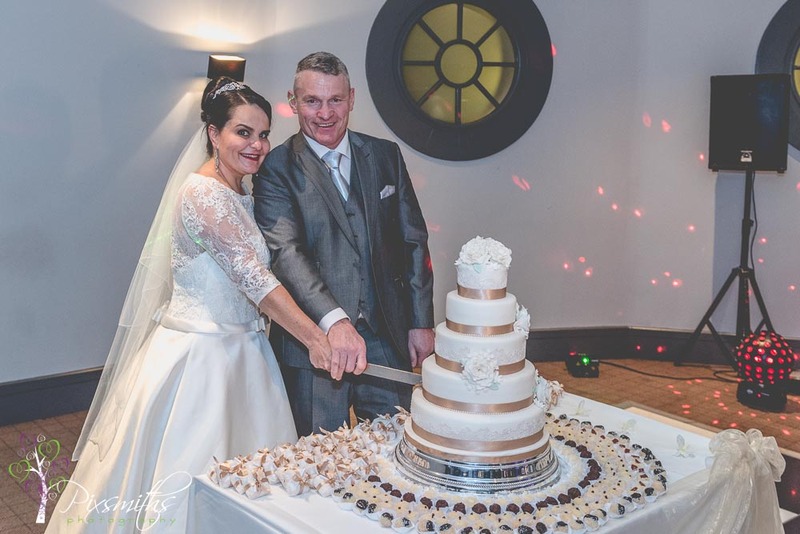 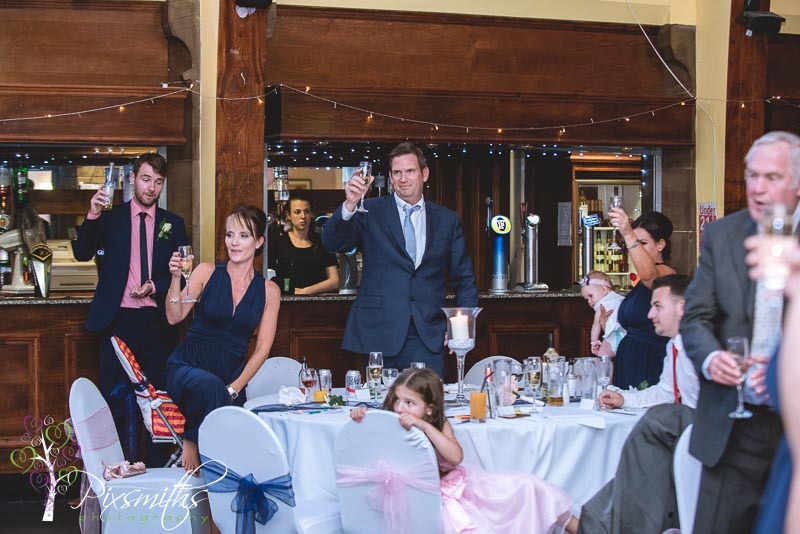 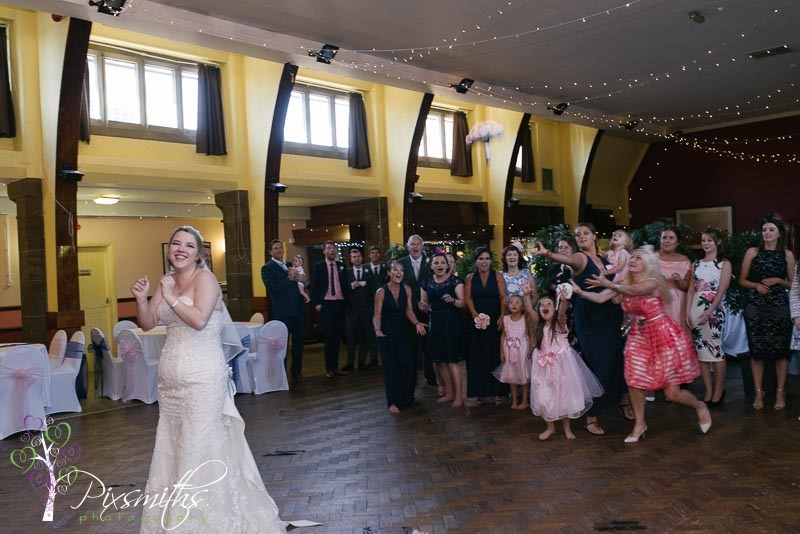 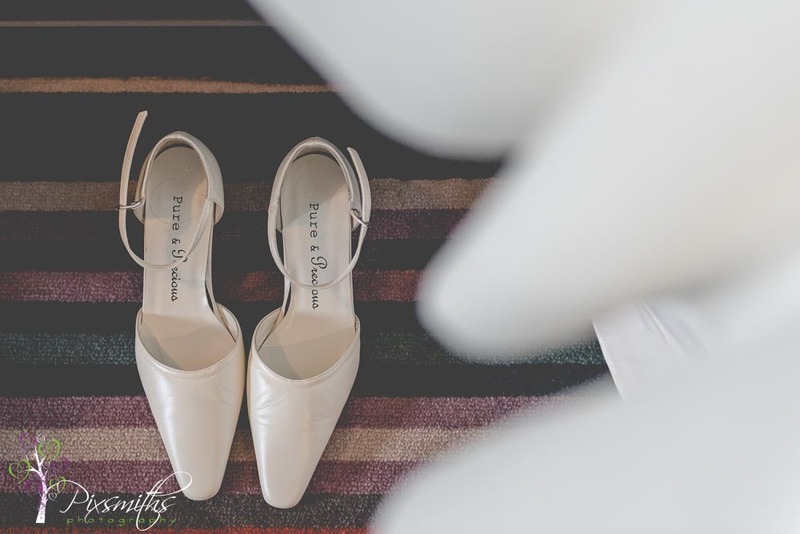 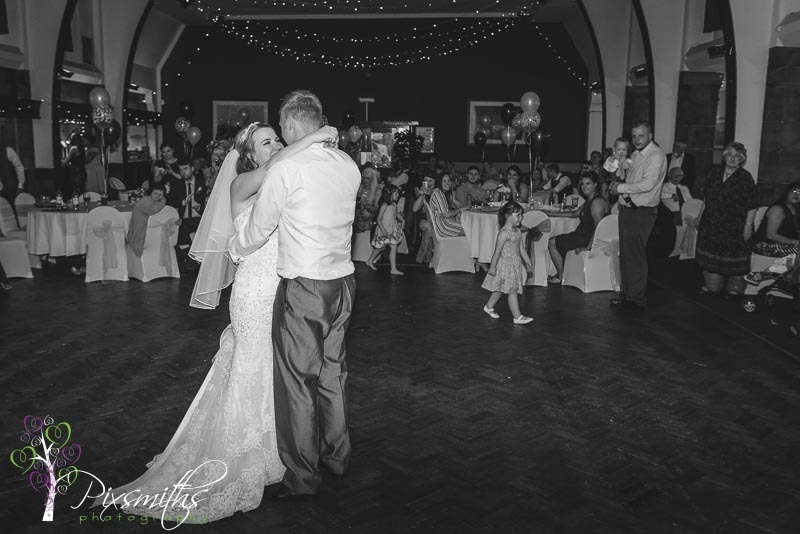 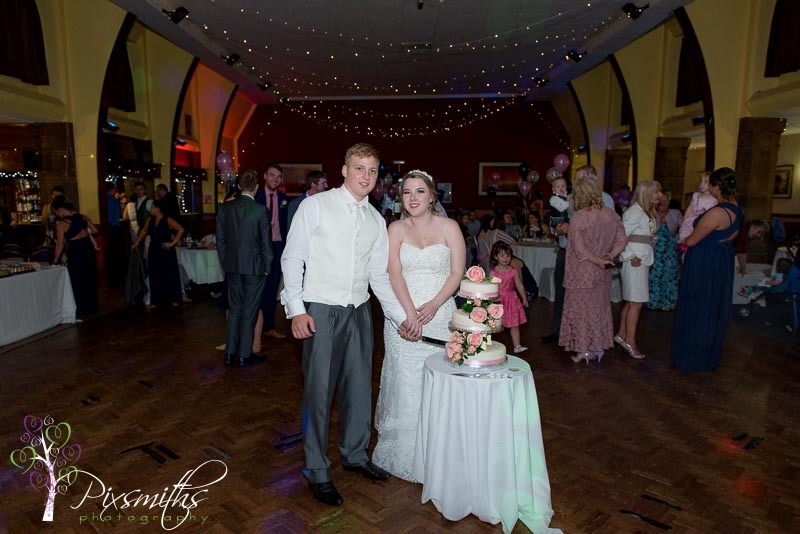 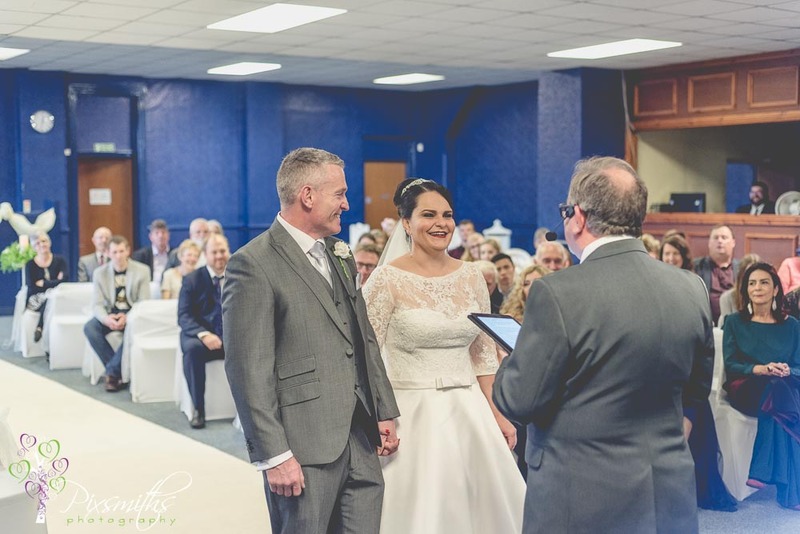 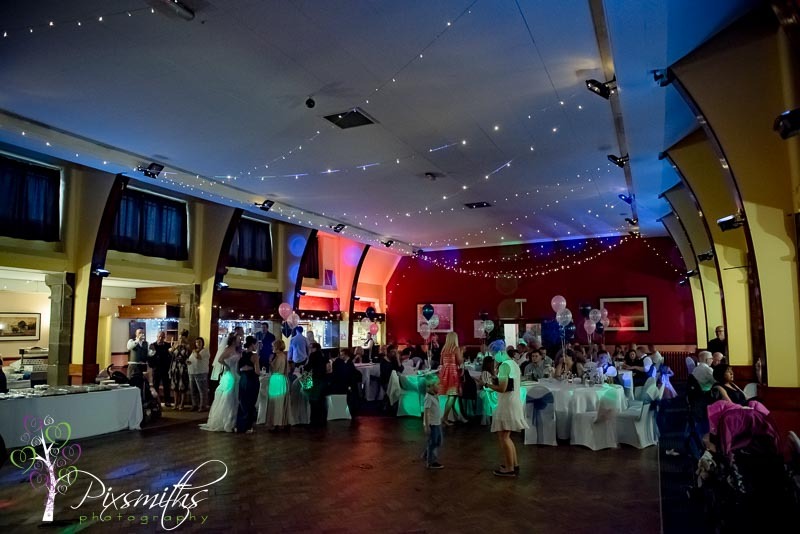 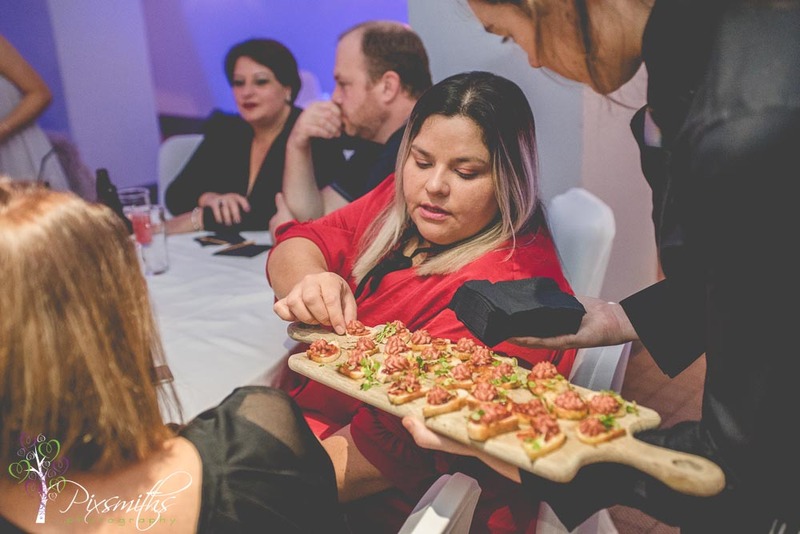 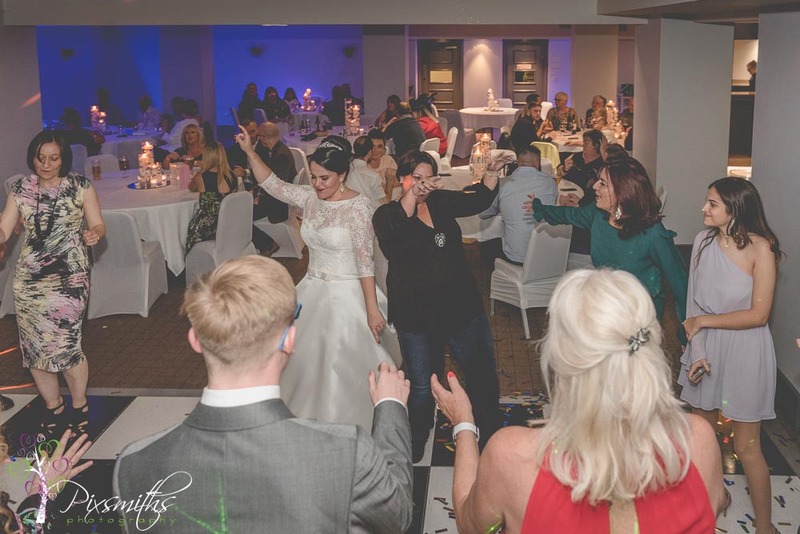 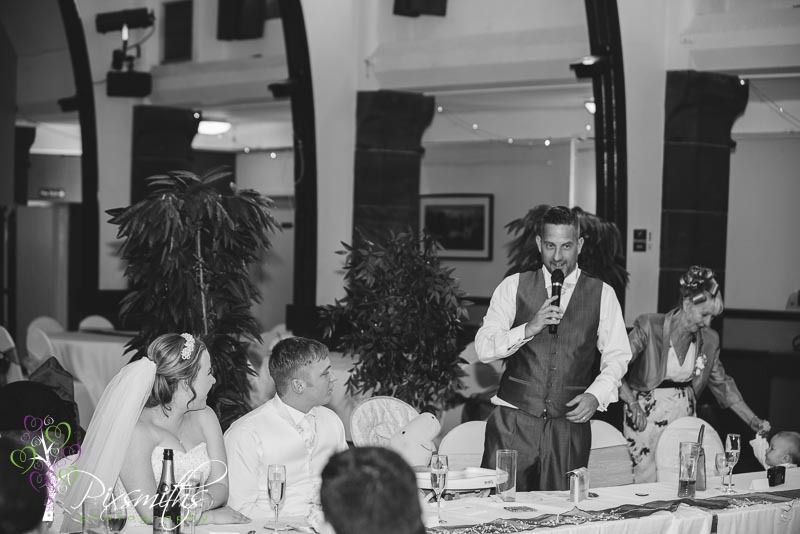 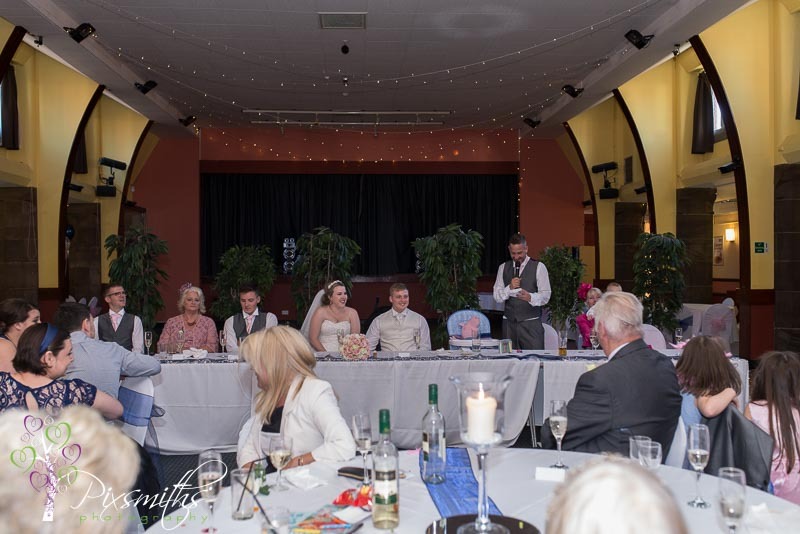 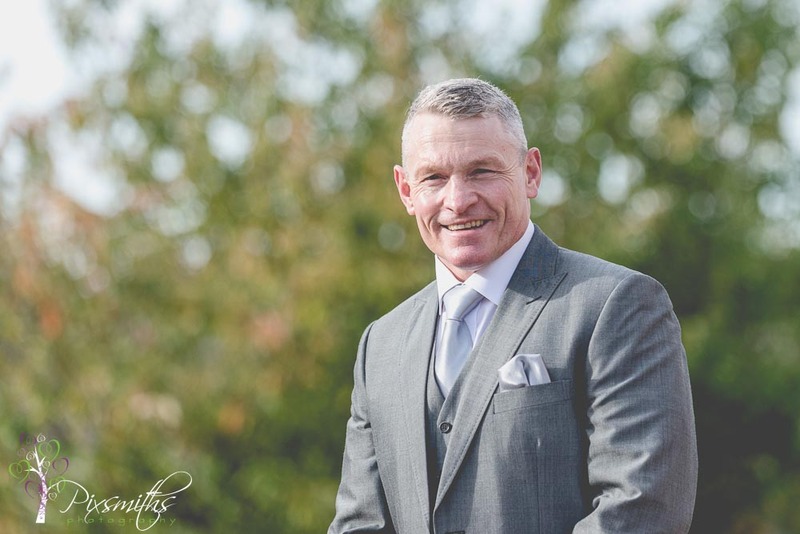 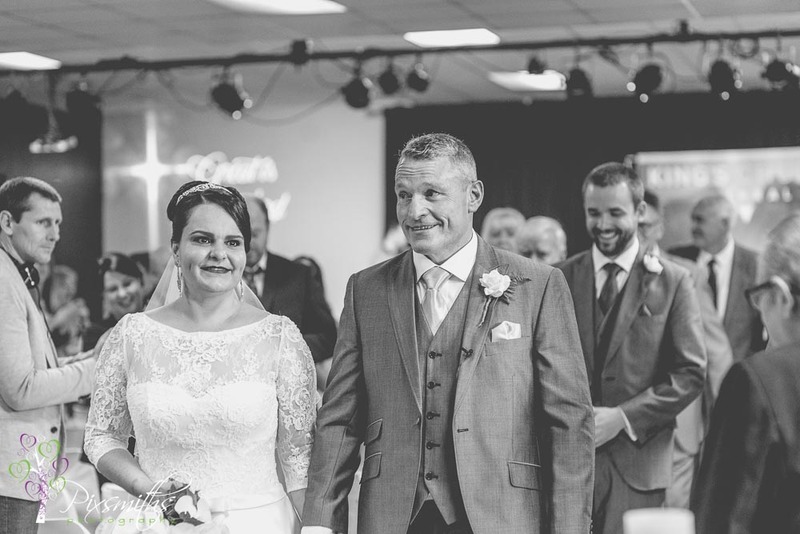 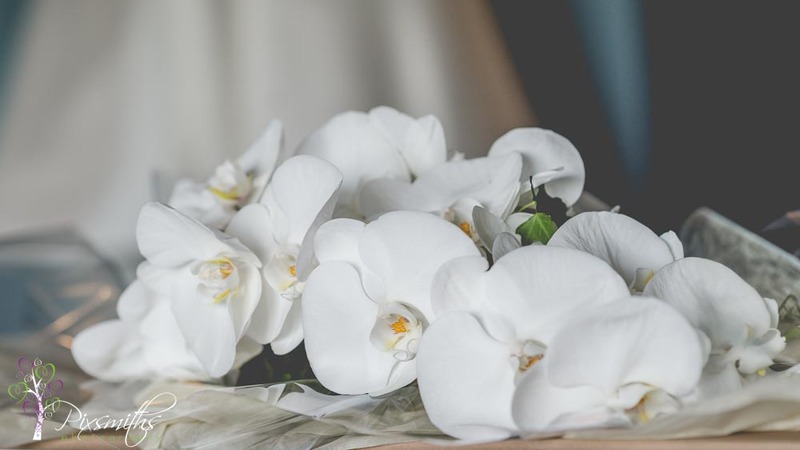 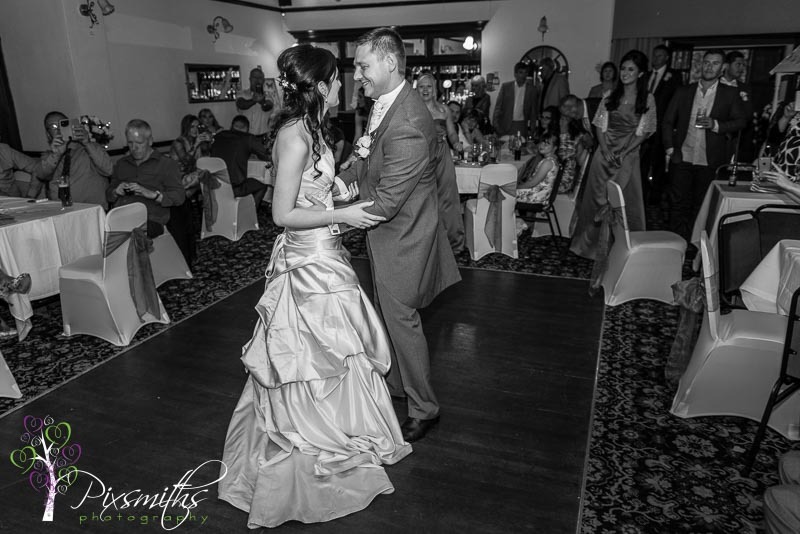 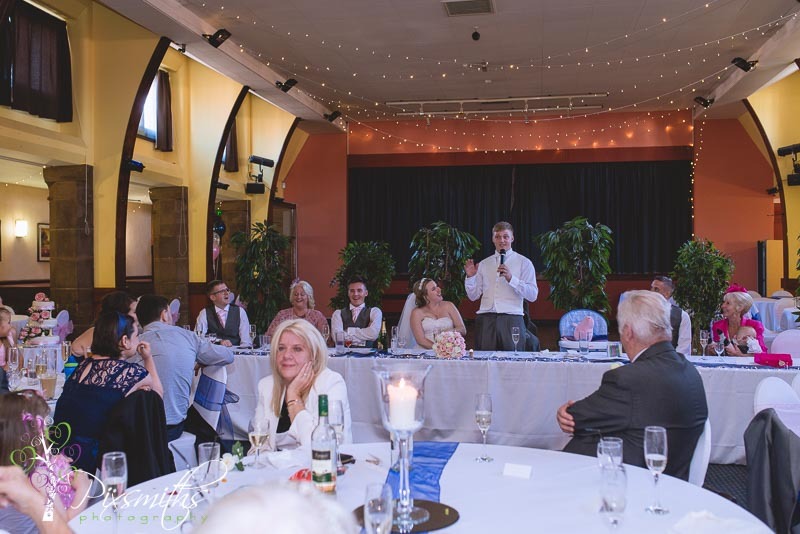 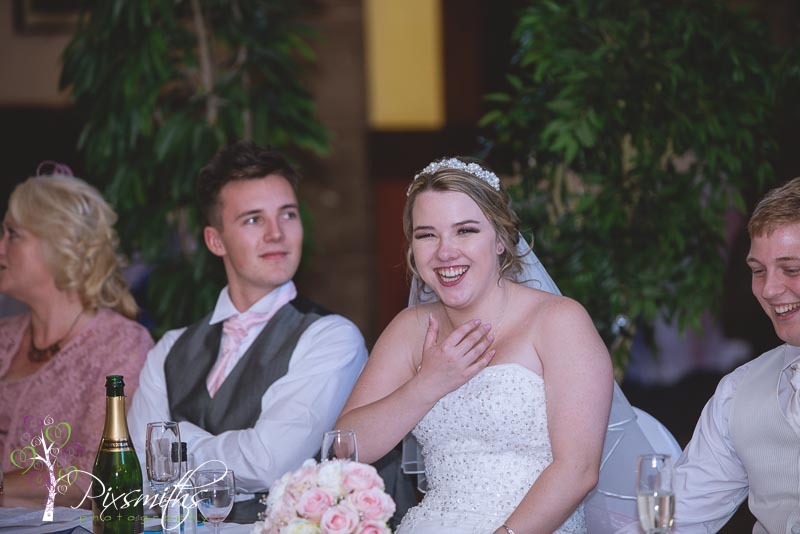 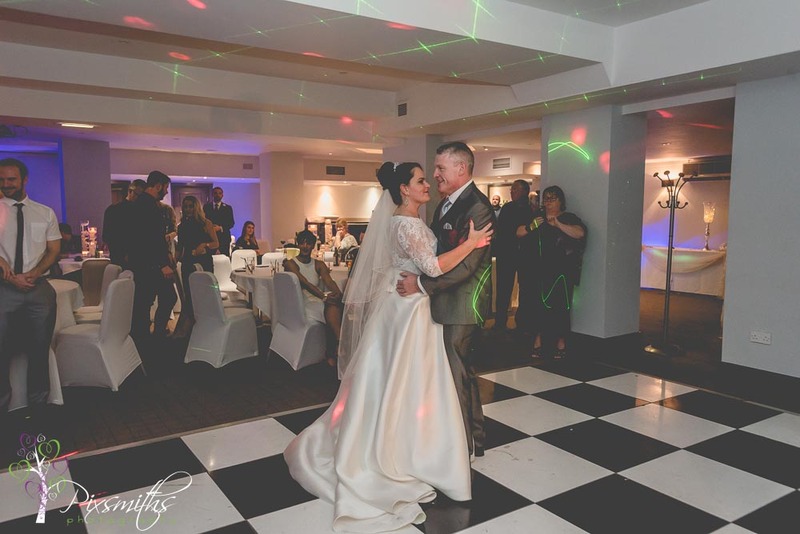 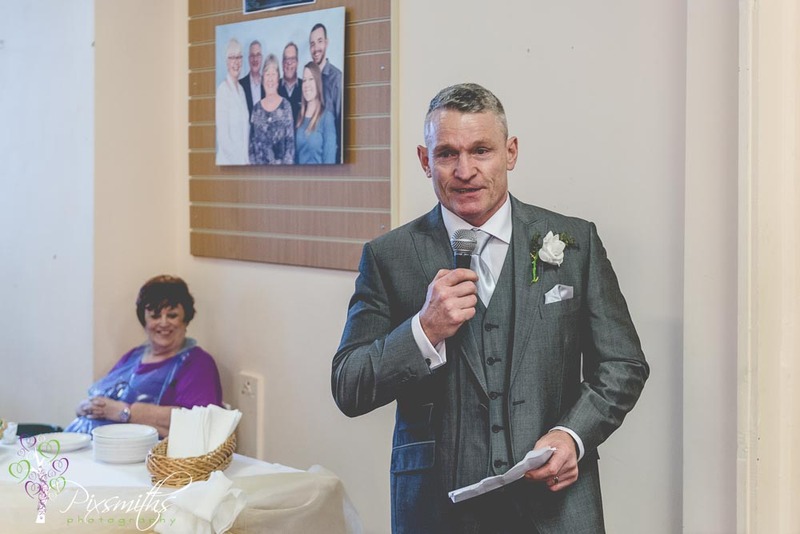 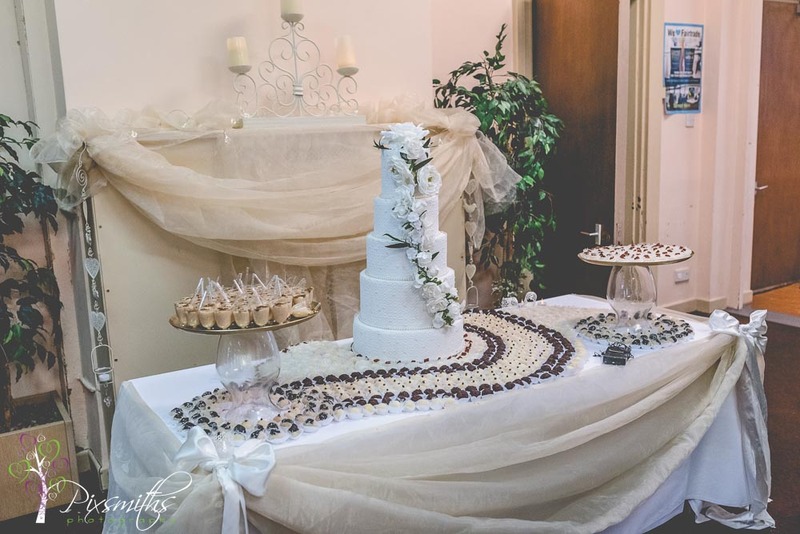 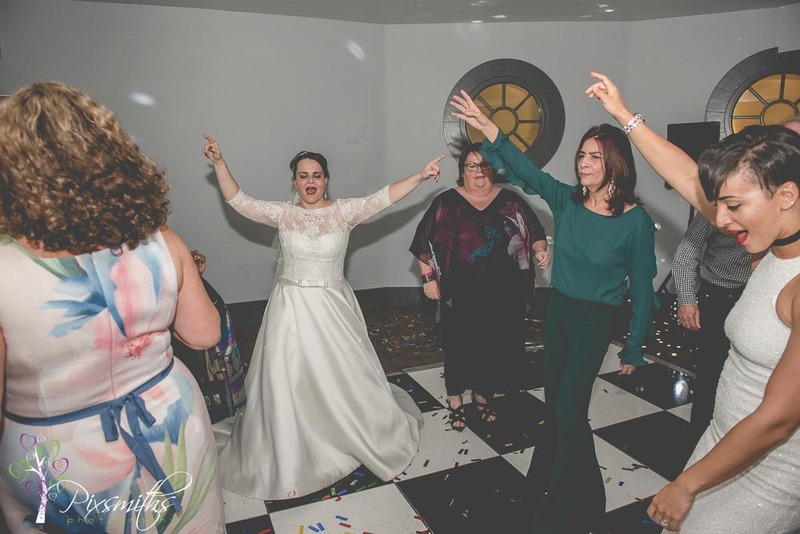 Again the reception room was beautifully set set up in their colour scheme and staff so helpful – directing guest to the bar area first before entering the room for the wedding breakfast. 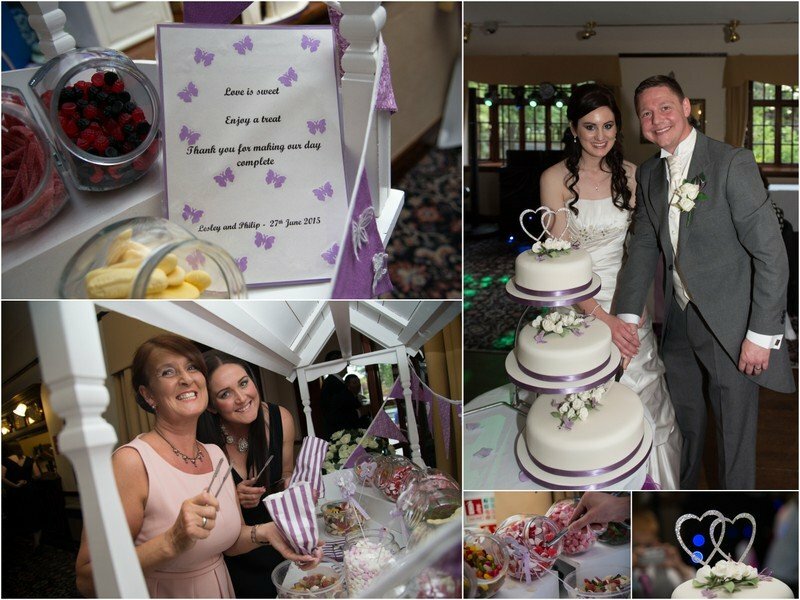 Special mention must go to Lesley’s mum who had made the bouquets, the cake, the bunting for the sweet cart and the favours – a real labour of love for teh couple. 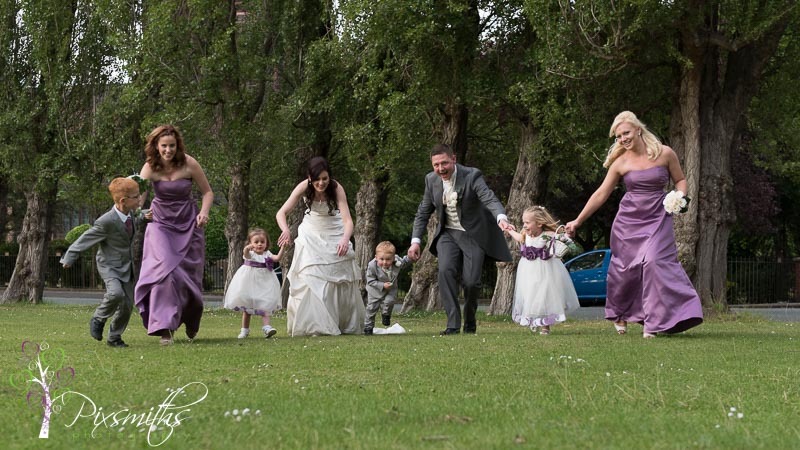 The golden light after the meal meant we could just pop over the road to the grassed area for a few more impromptu family pics and portraits before the evening dancing got underway.